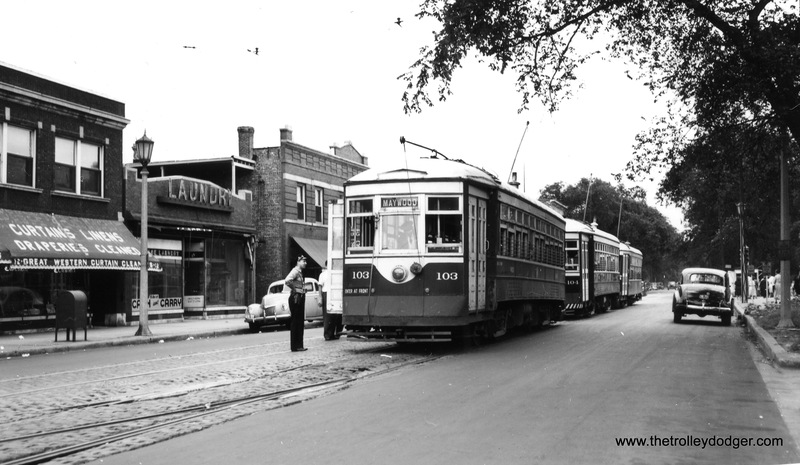 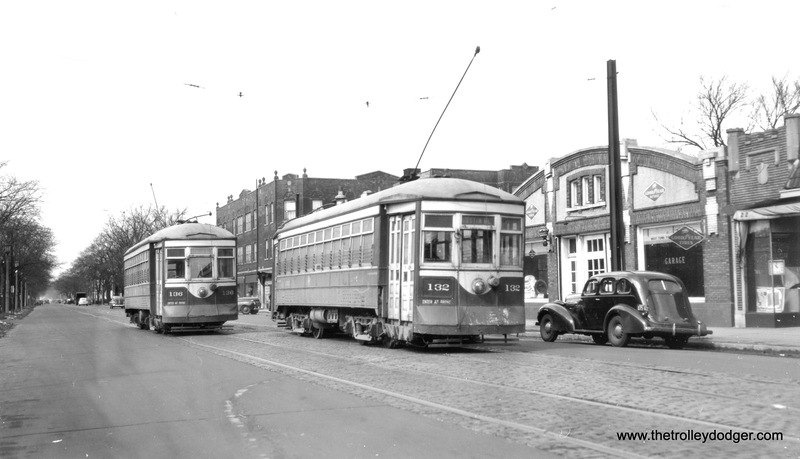 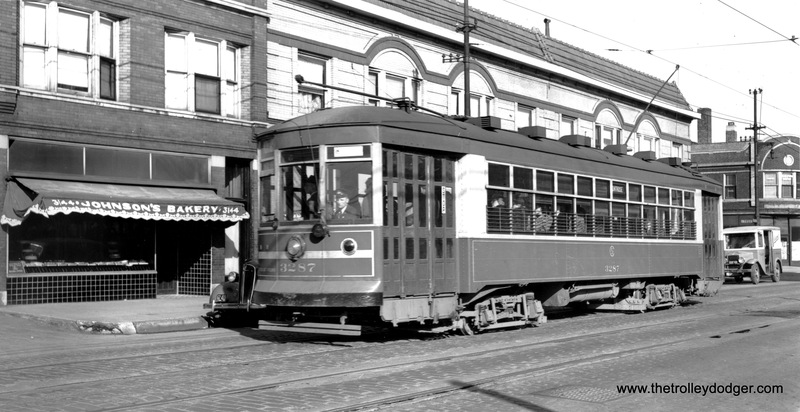 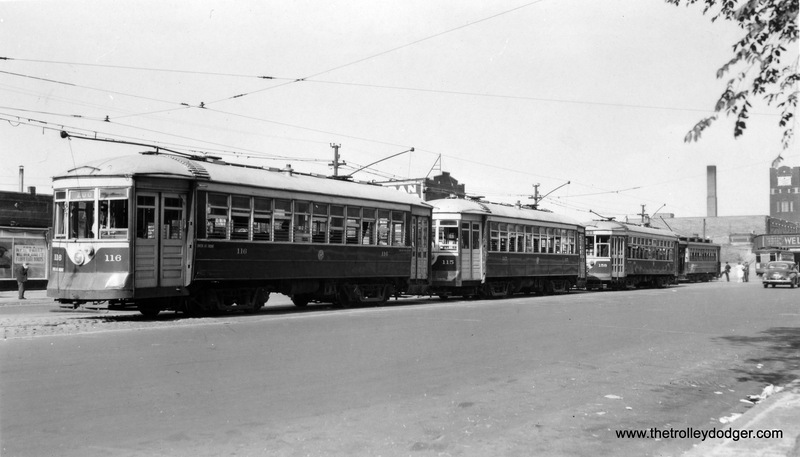 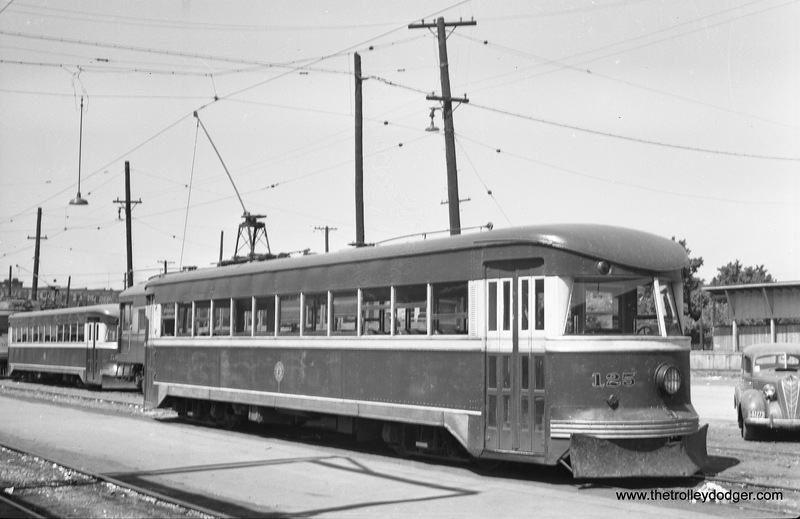 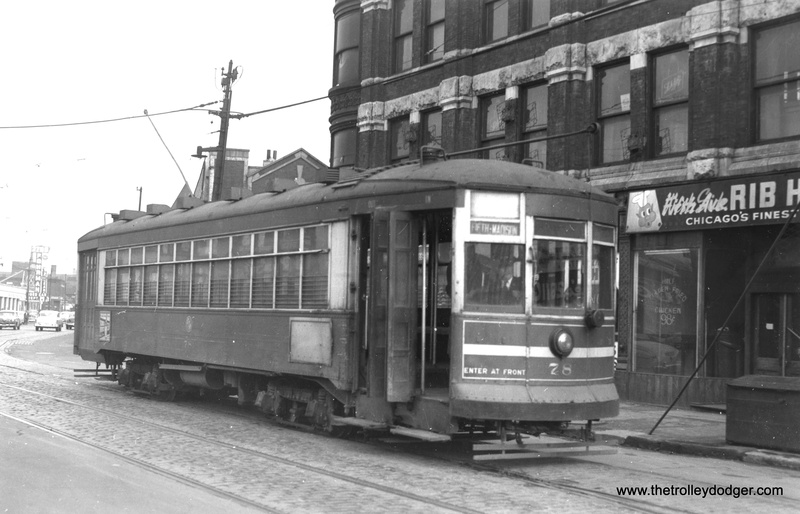 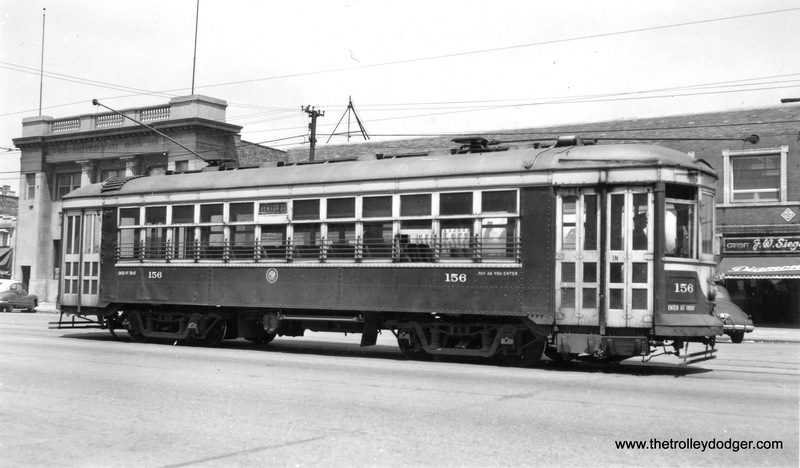 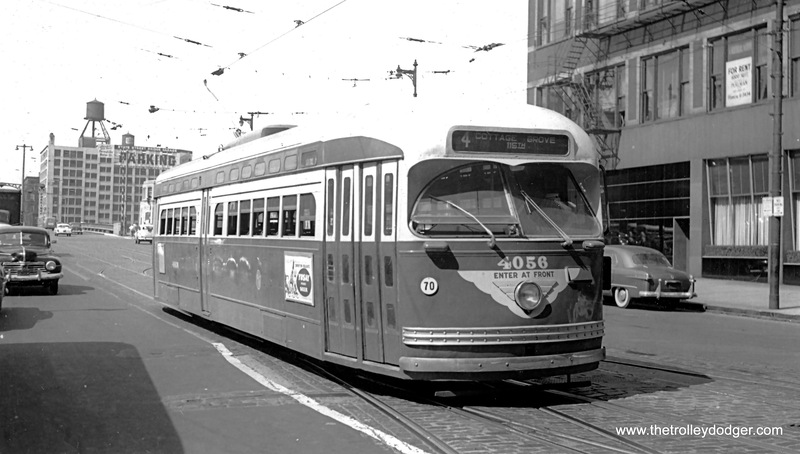 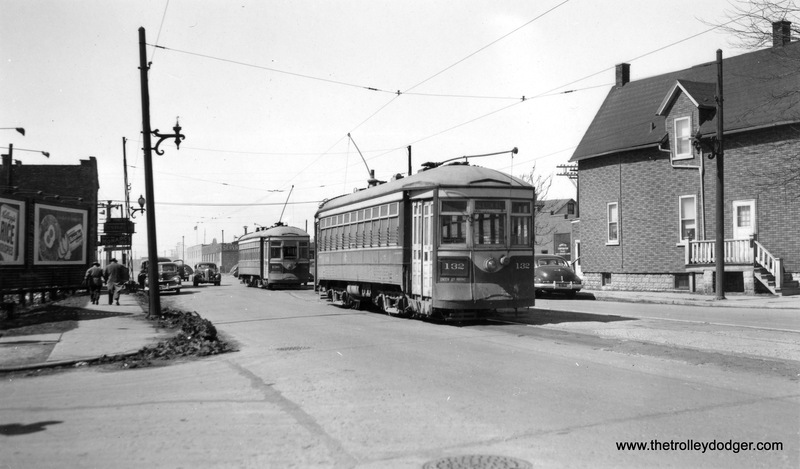 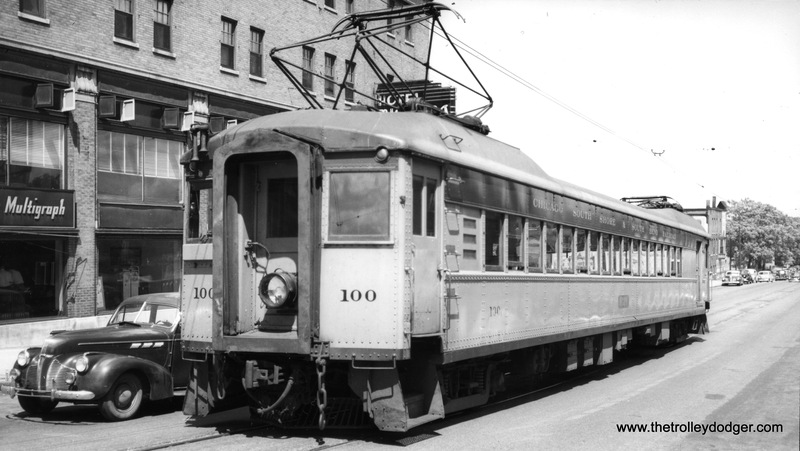 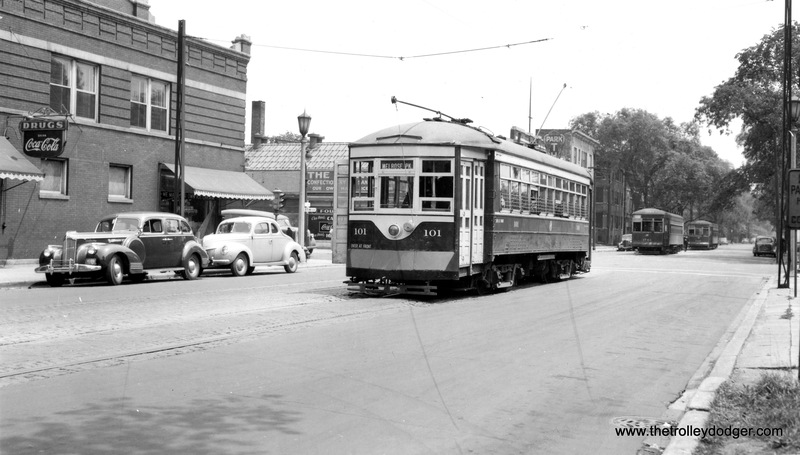 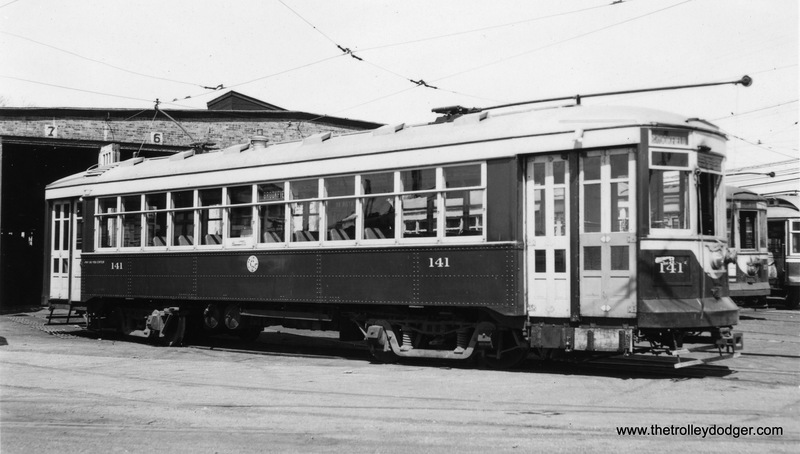 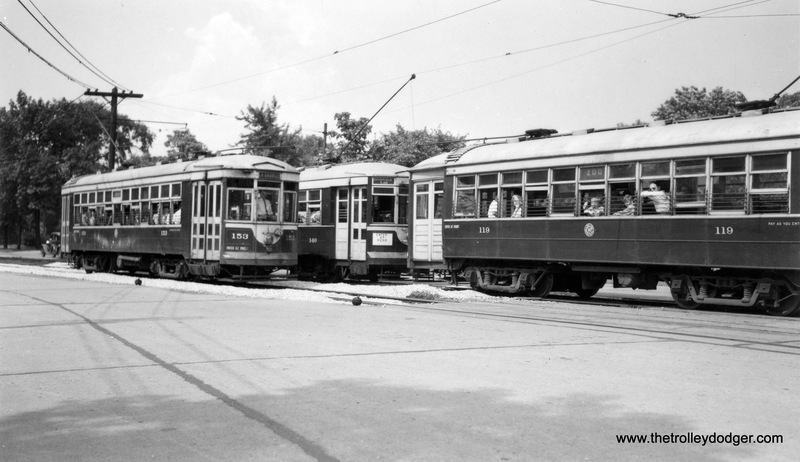 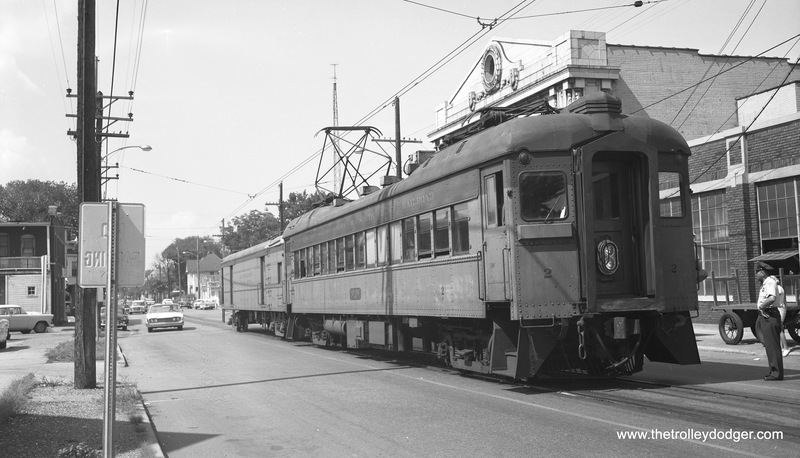 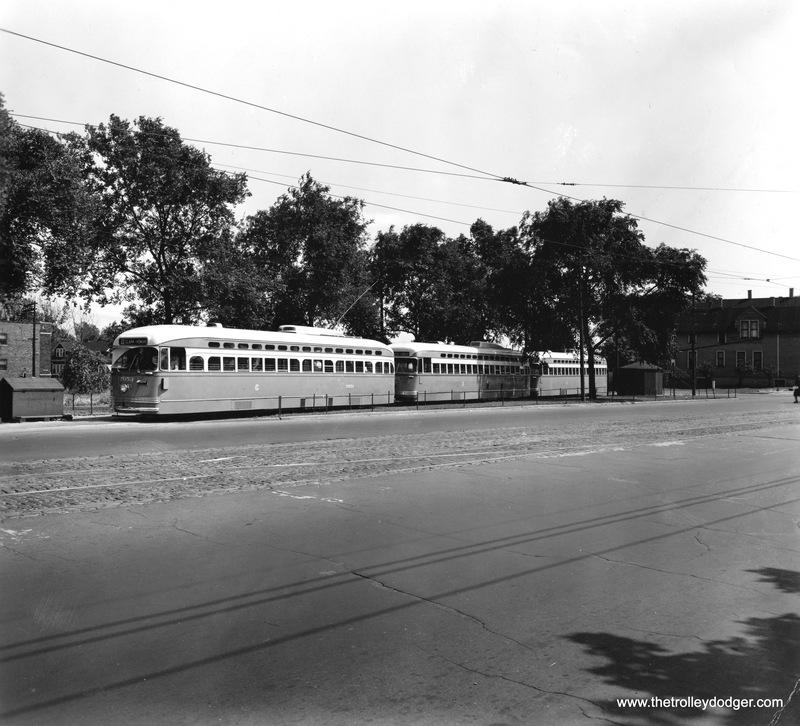 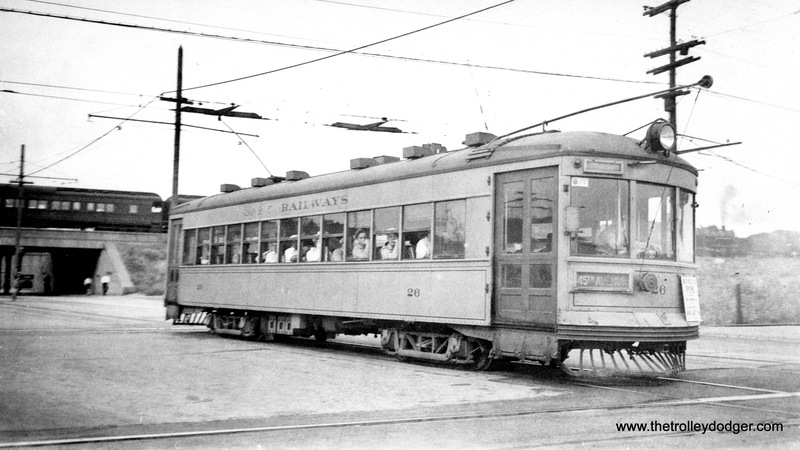 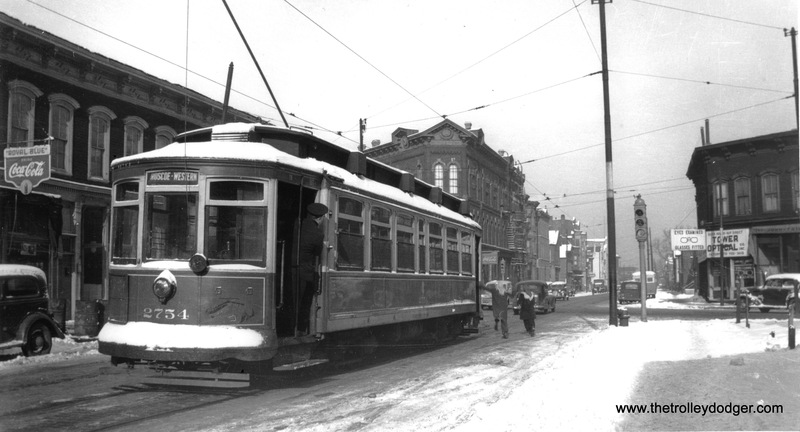 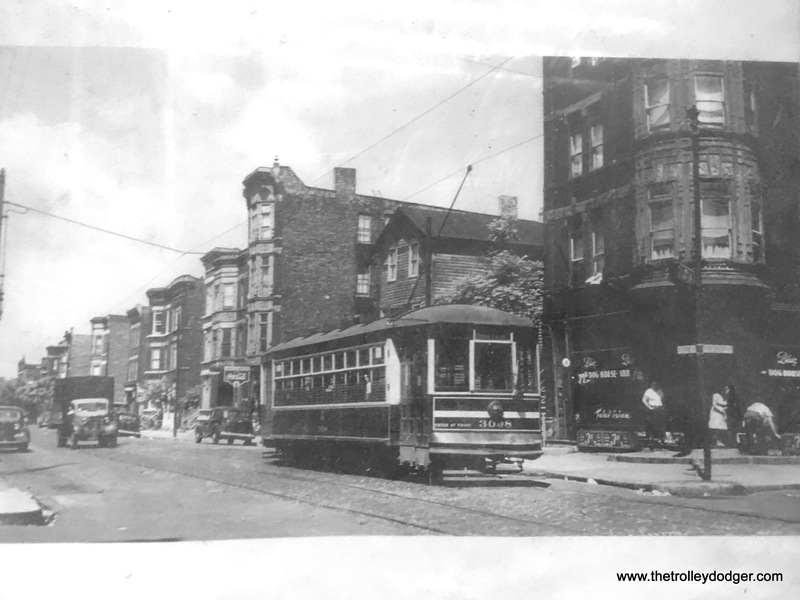 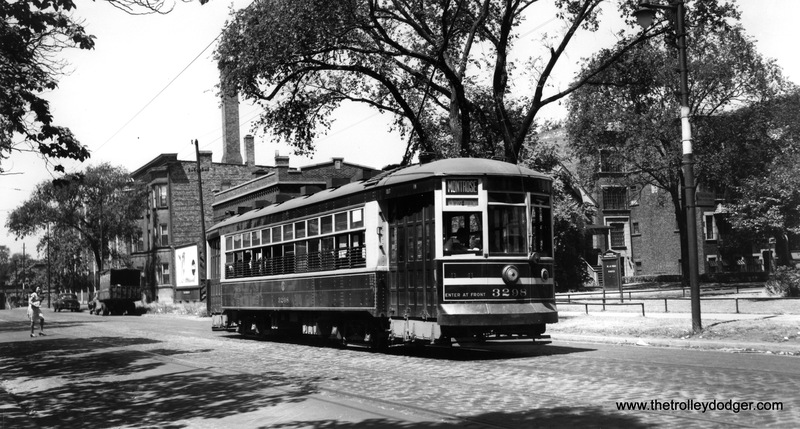 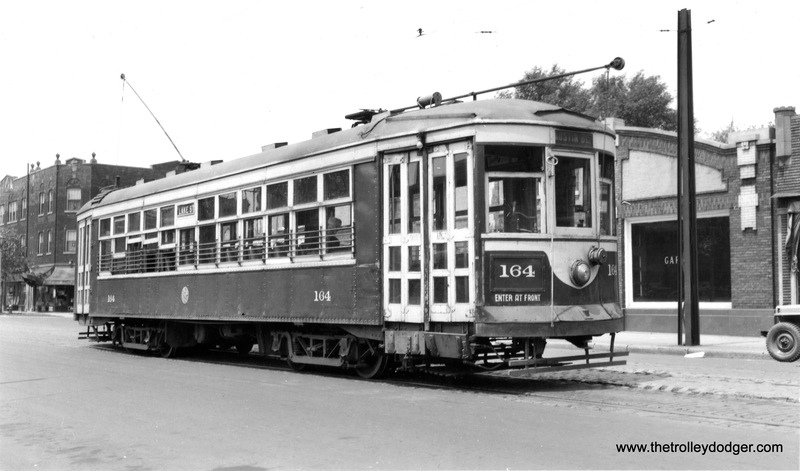 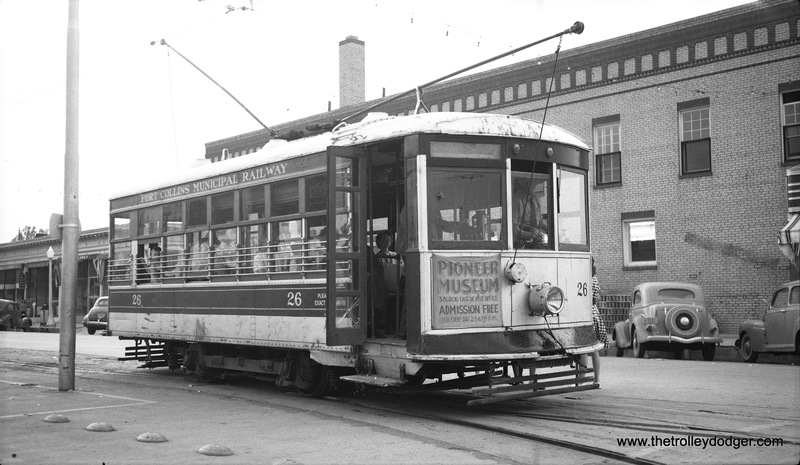 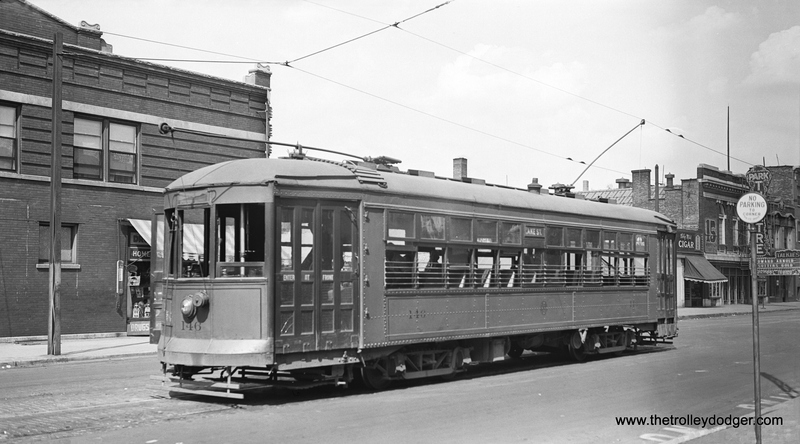 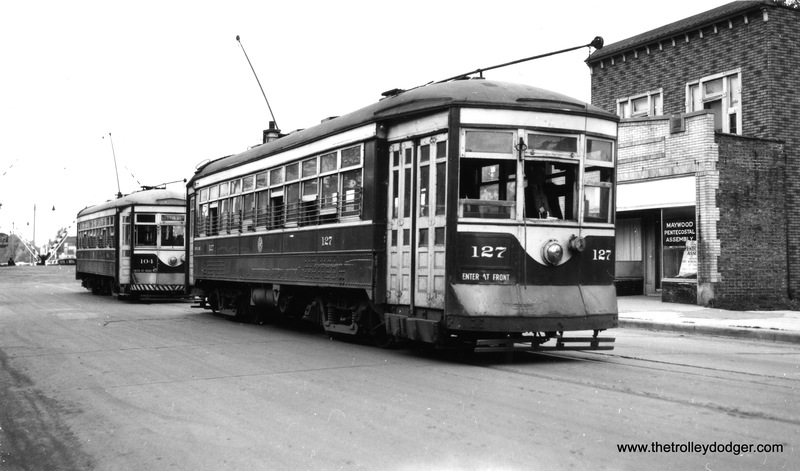 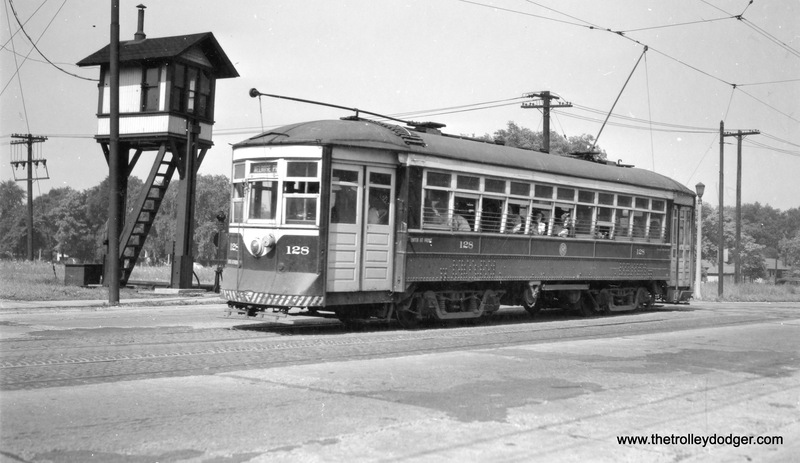 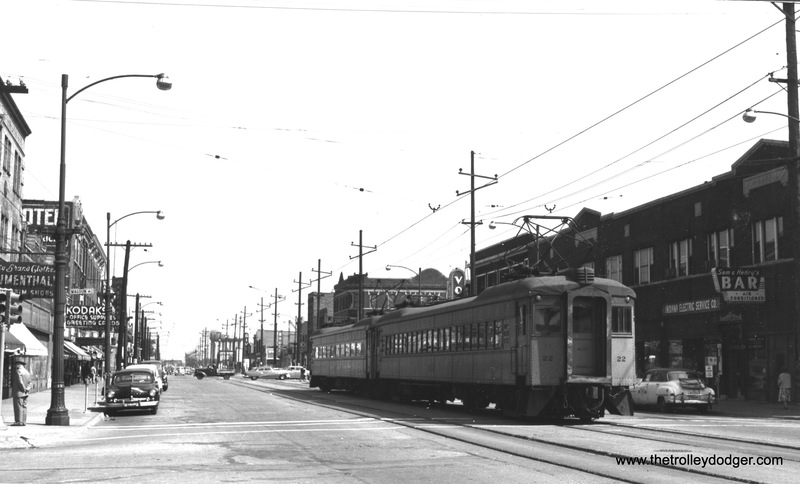 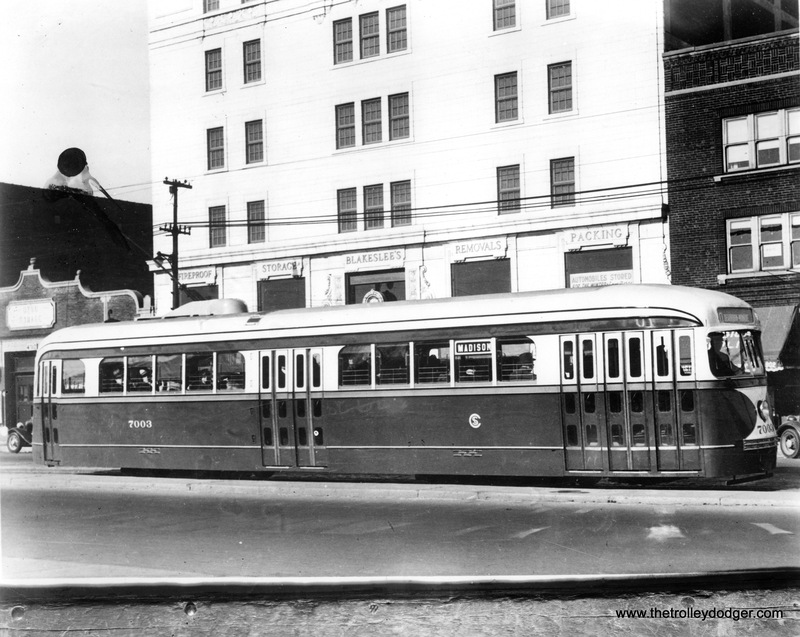 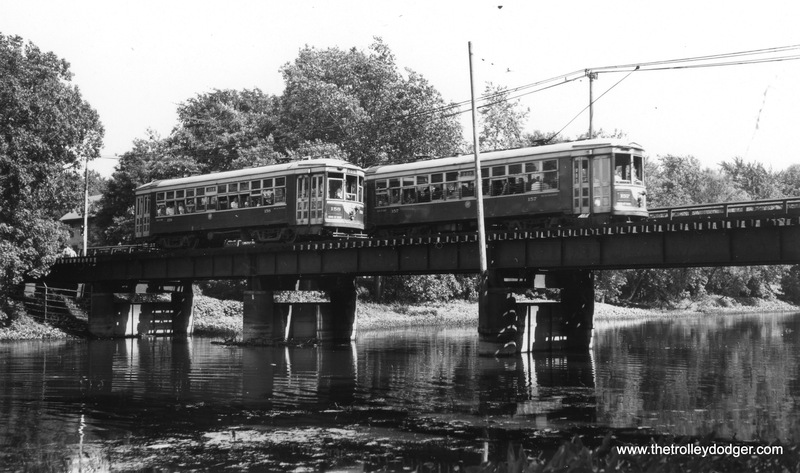 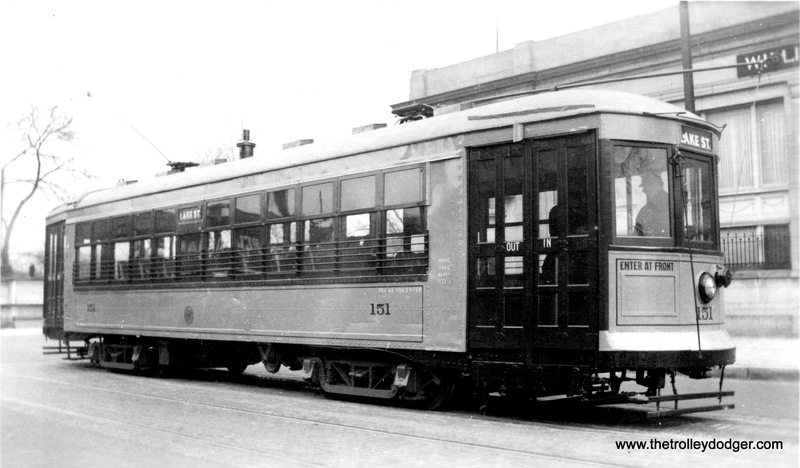 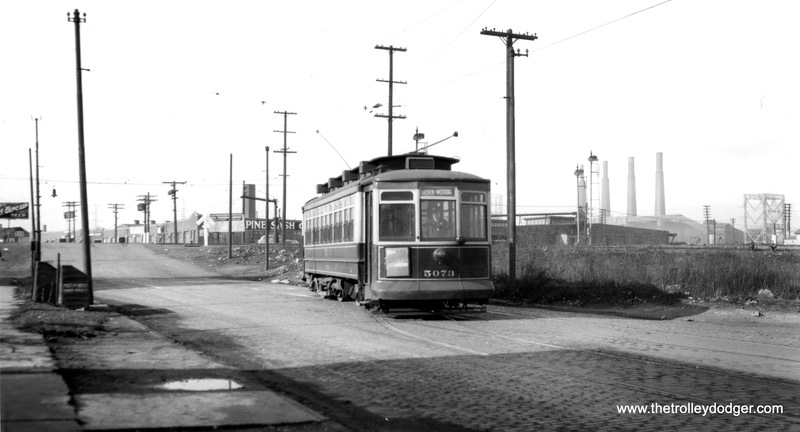 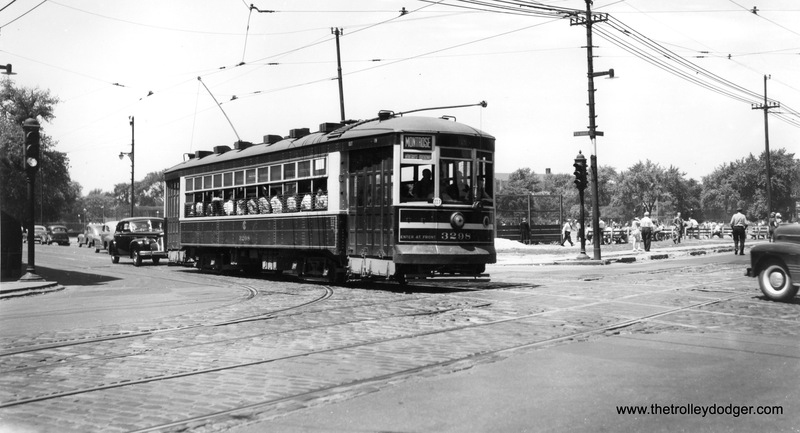 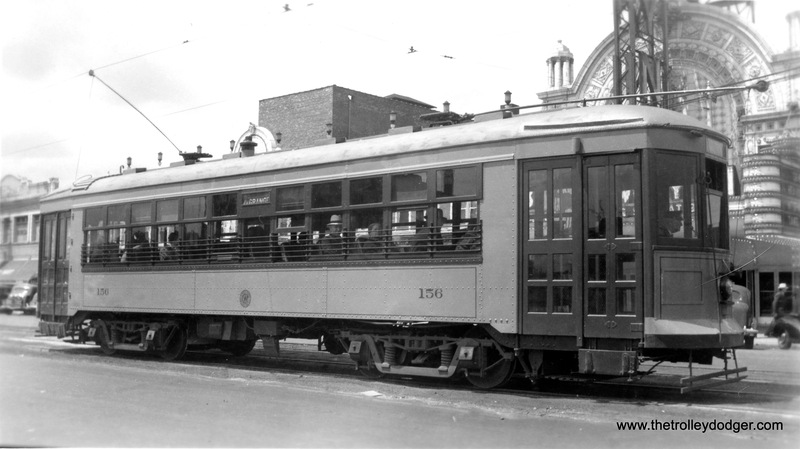 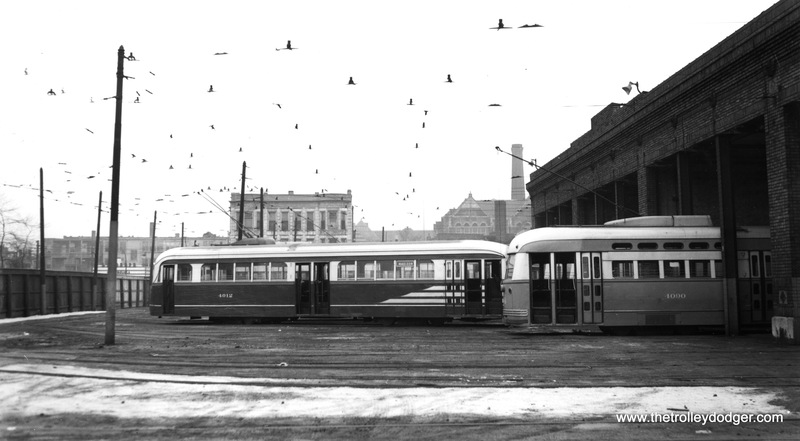 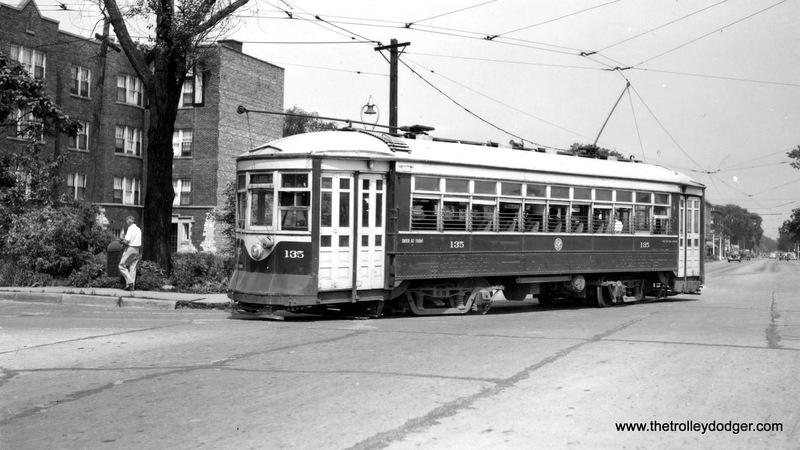 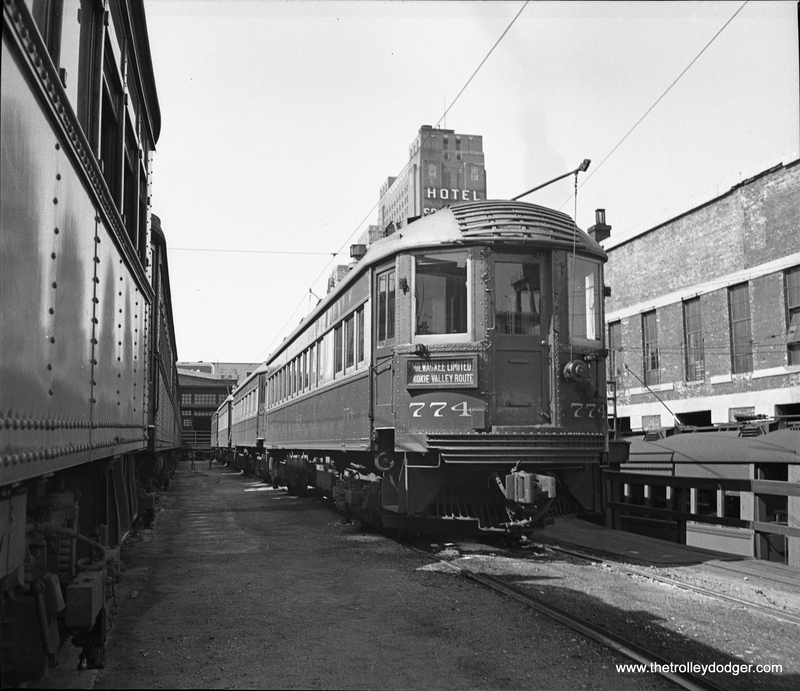 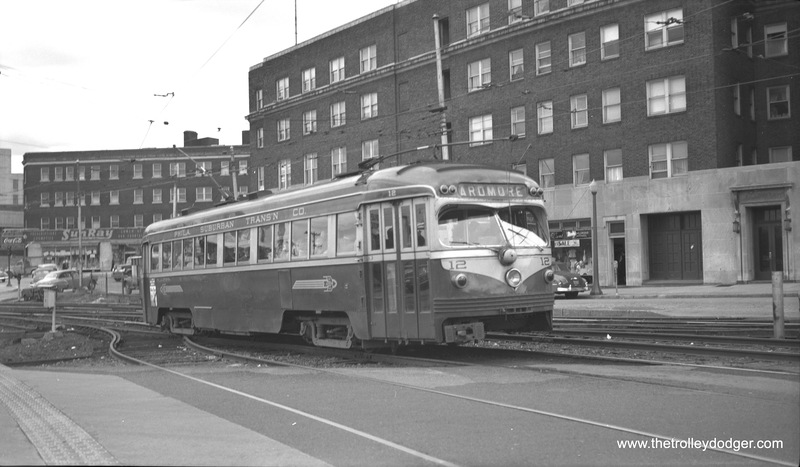 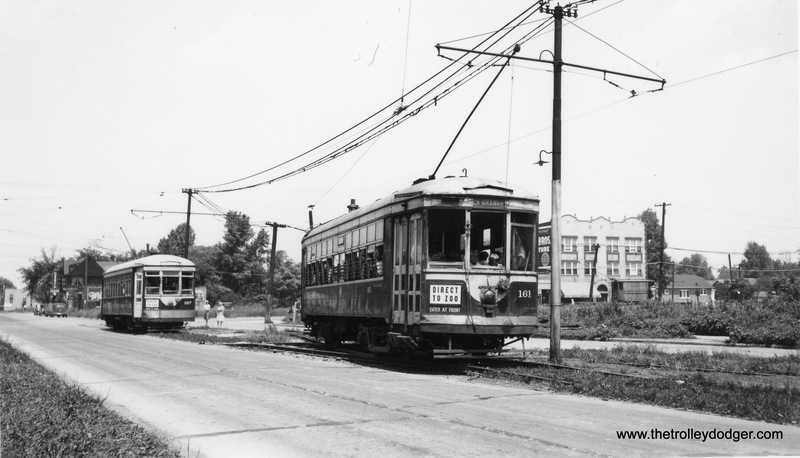 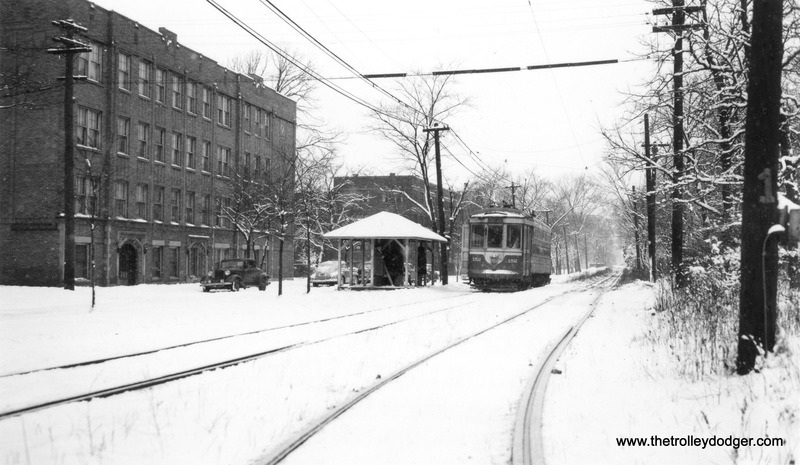 One of our regular readers writes, “The 4 tracks were taken out about 1948 when a number of the car lines that operated off of Canal were converted to trolley bus.” The location is the intersection of Canal and St. Charles. 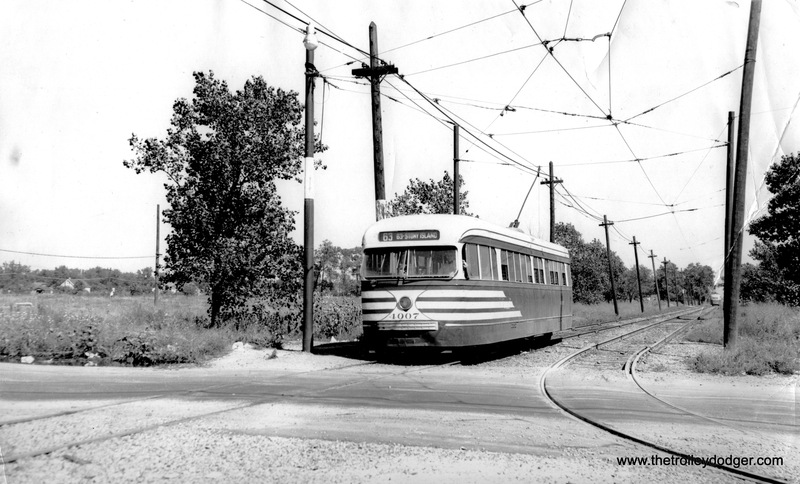 Car 444 is looping at the end of the St. Charles route and will be turning to the left in the picture. 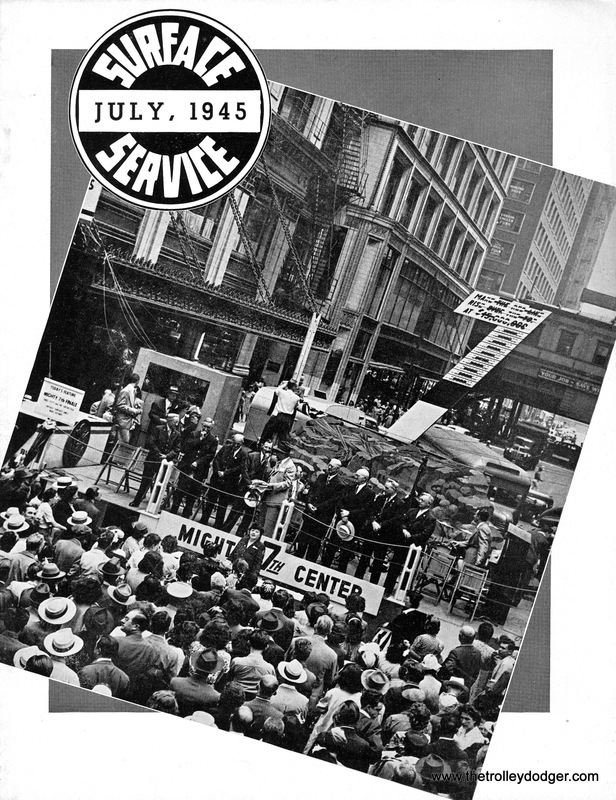 WSMB (now WWWL) was an AM radio station at 1350 on the dial. 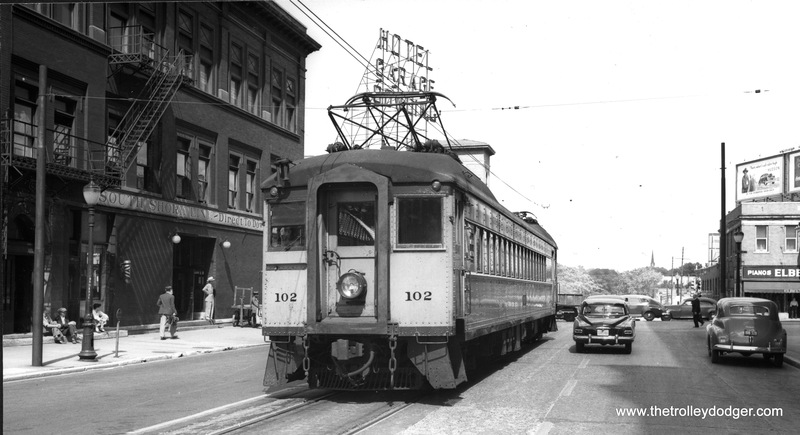 Its old call letters reflect its original ownership by the Saenger theater chain and Maison Blanche department store. 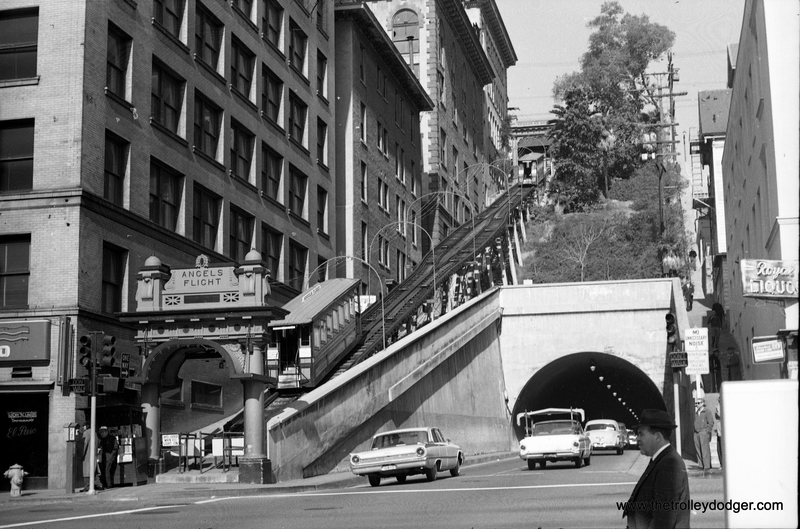 Its studios were located in the Maison Blanche department store building at right, now the Ritz-Carlton hotel. 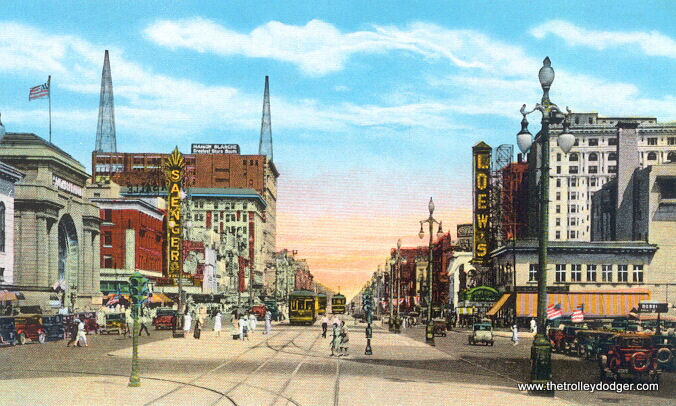 The Saenger Theatre, another local landmark, is also on the right side of the picture. 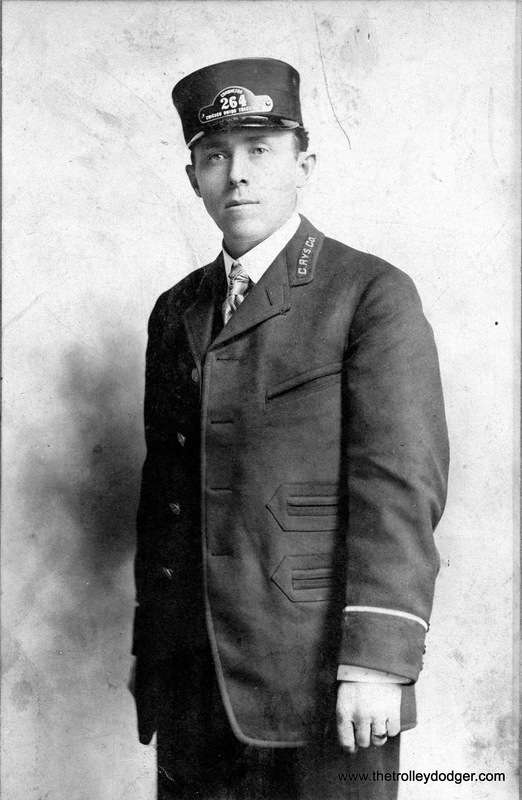 In the days before air conditioning, men used to wear white suits, as you see here, since white reflects more heat than darker clothing. 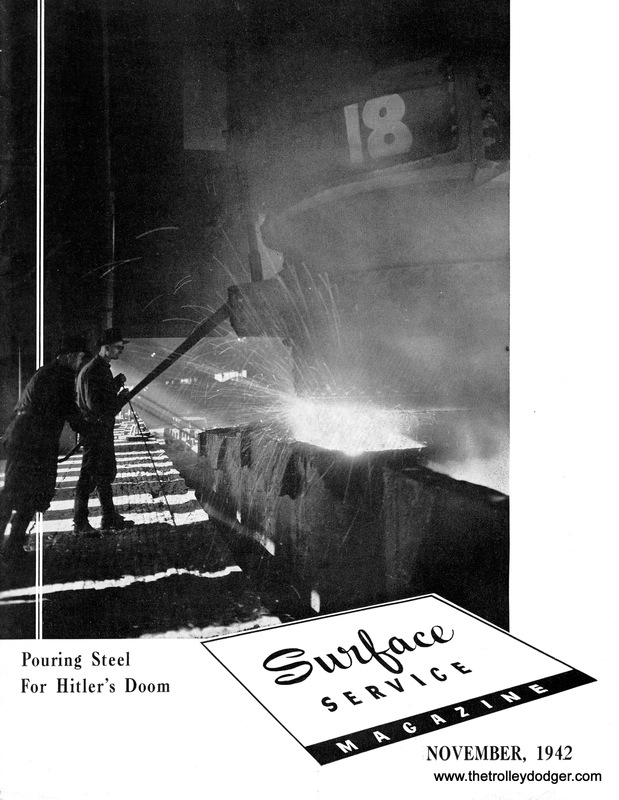 When this picture was taken, France had just fallen to Nazi Germany. 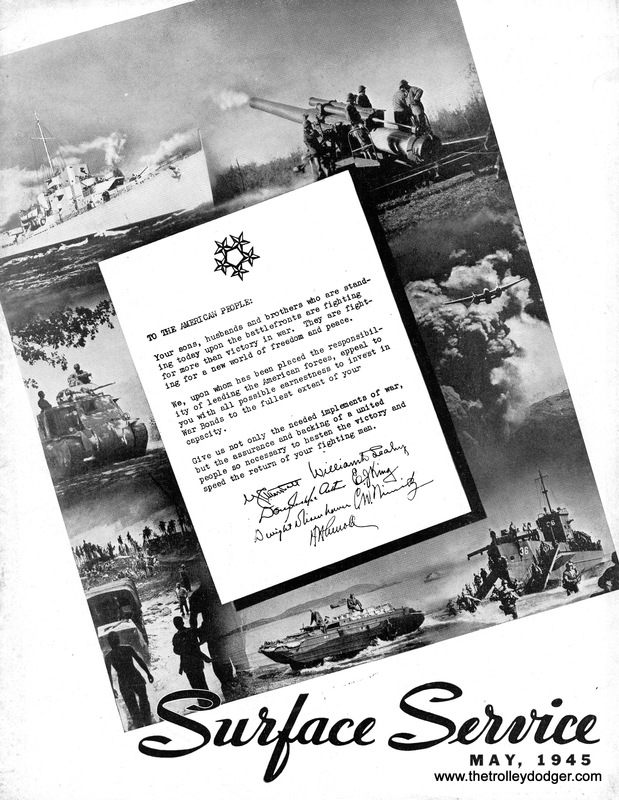 The US did not enter World War II directly until 18 months later. 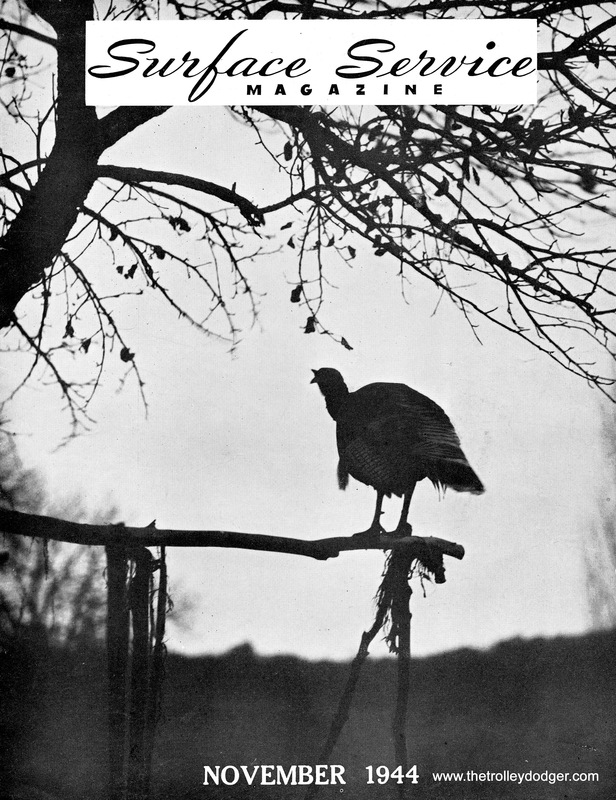 Our theme today is points east, west, and south. 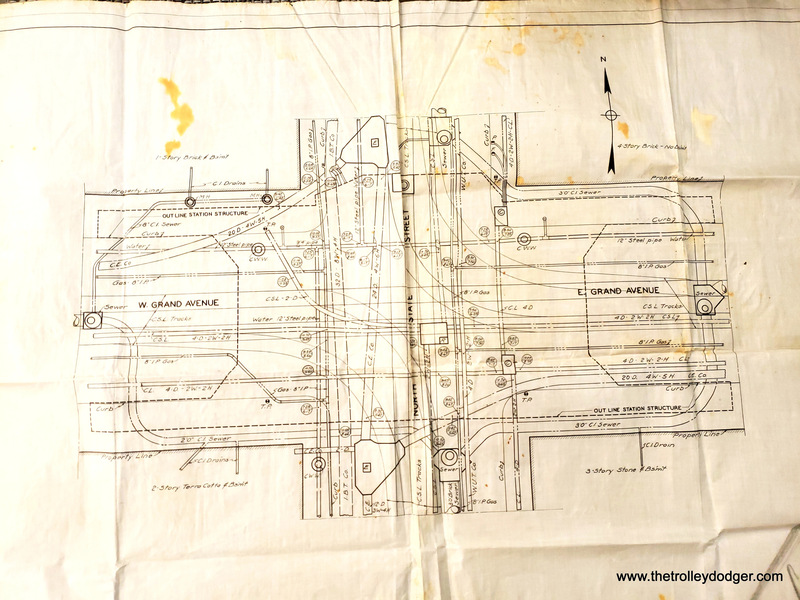 We’re going off in three directions, every which way but north. 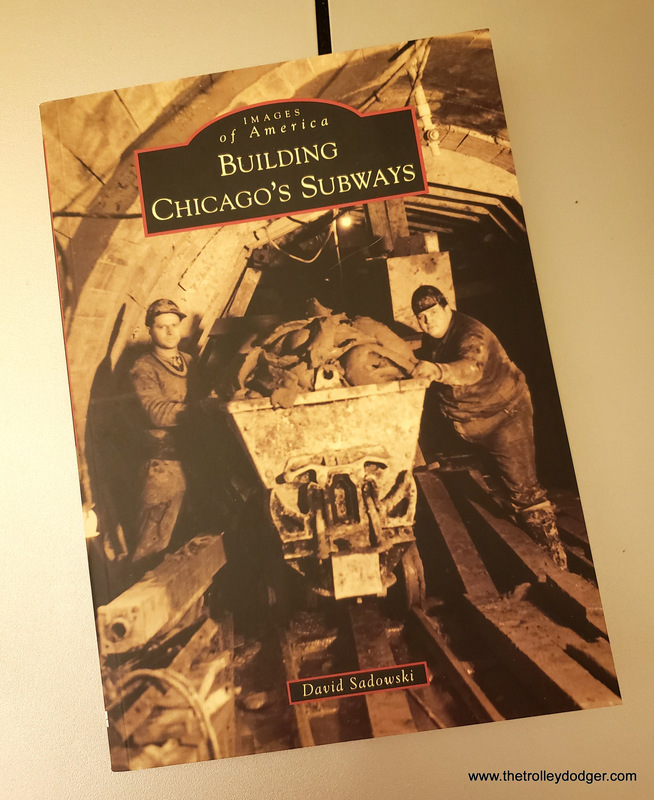 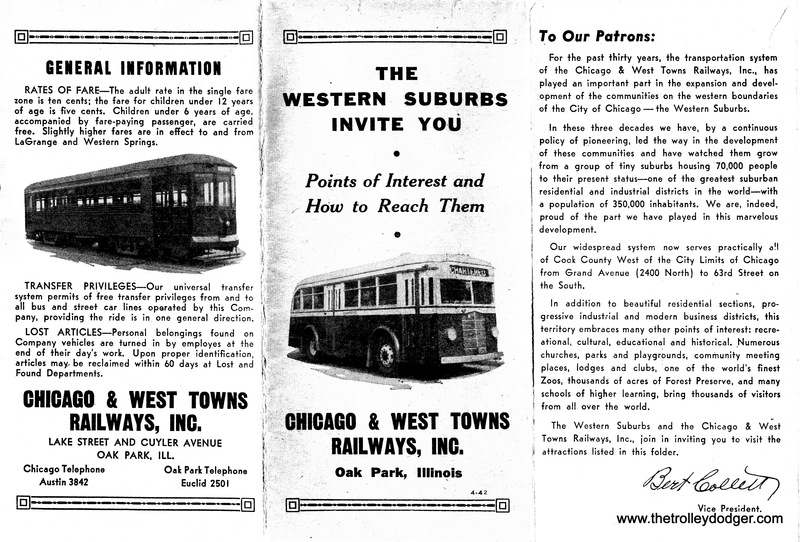 We are especially glad to feature both the Chicago & West Towns Railways and Gary Railways. 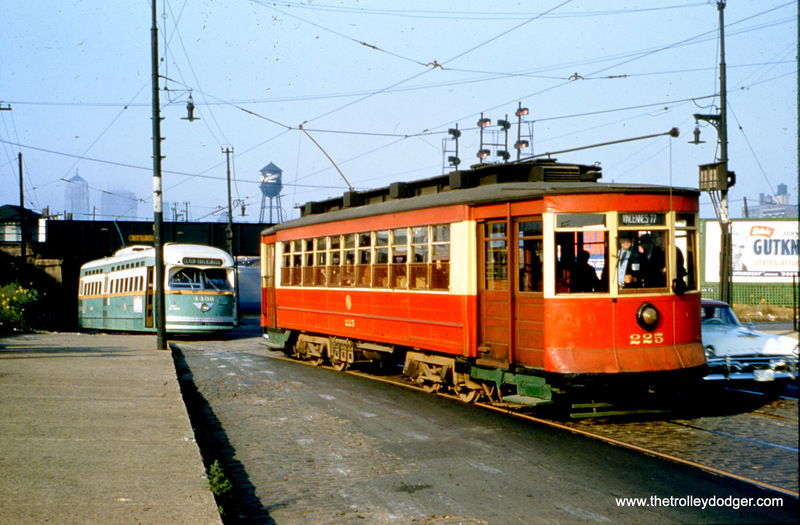 These photos have been generously shared by George Trapp, long a friend of this blog. 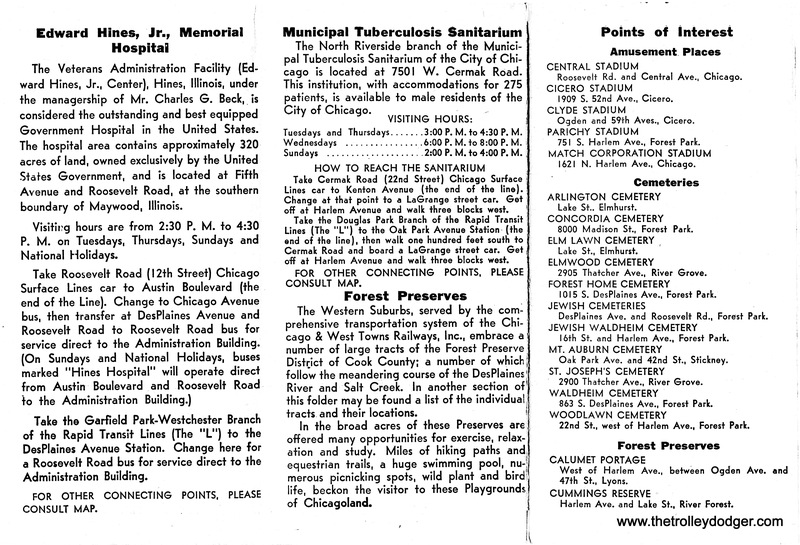 The West Towns map and photos of other properties come from our own collections. 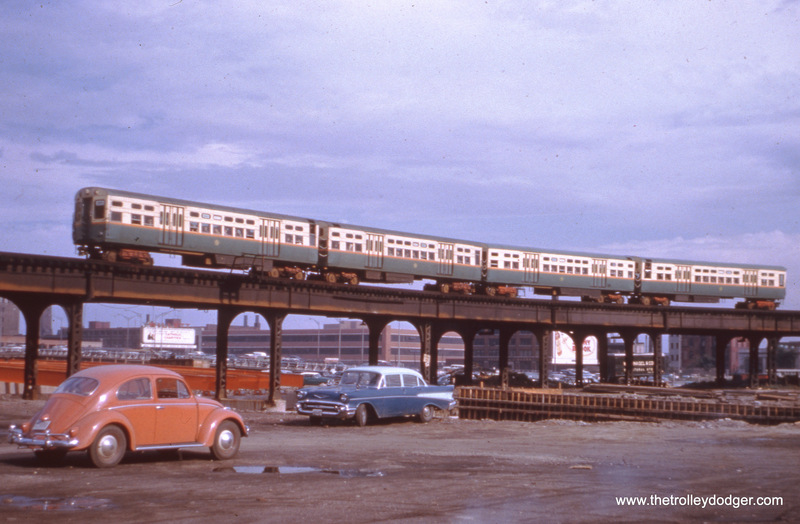 As always, to see a larger version of each photo, just click on it with your mouse. 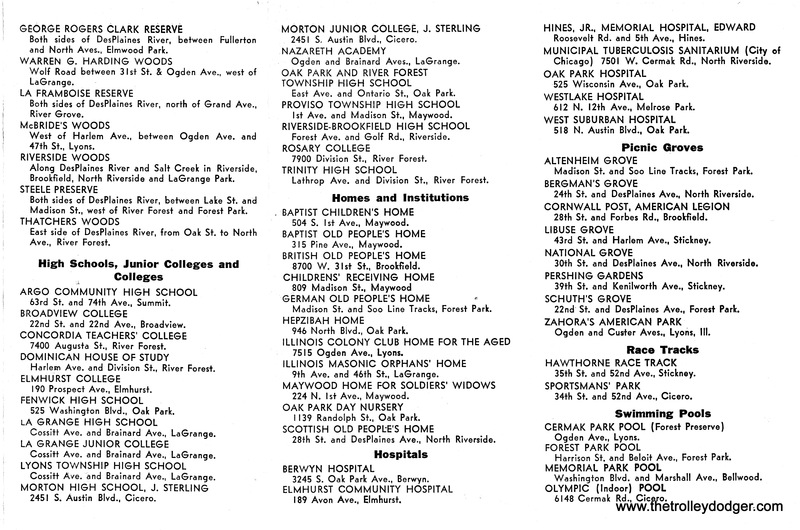 And, if you have useful information to add, please be sure to contact us. 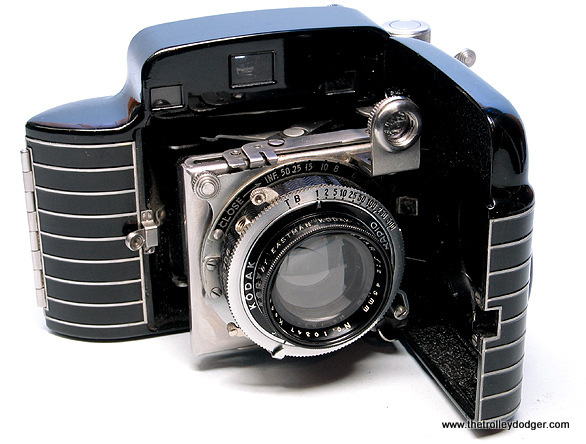 A streamlined Kodak Bantam camera, using size 828 roll film, of a type that may have taken the New Orleans picture. 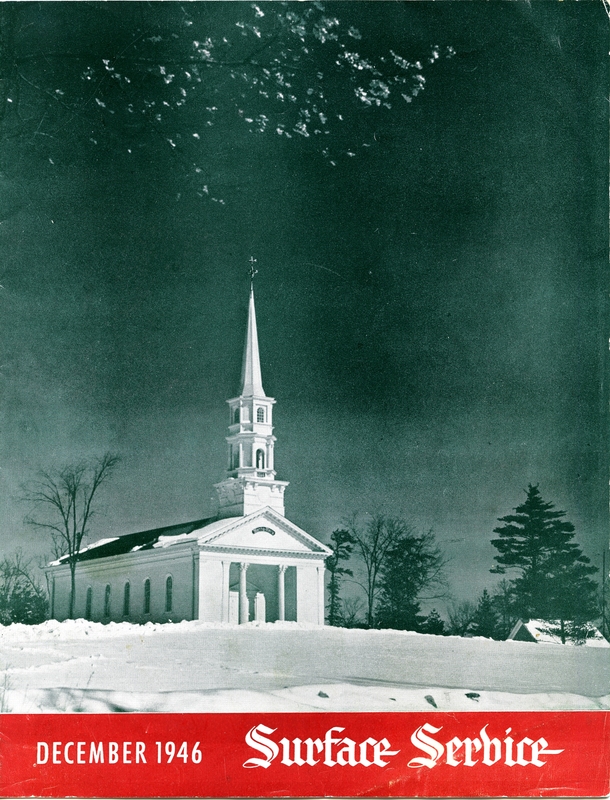 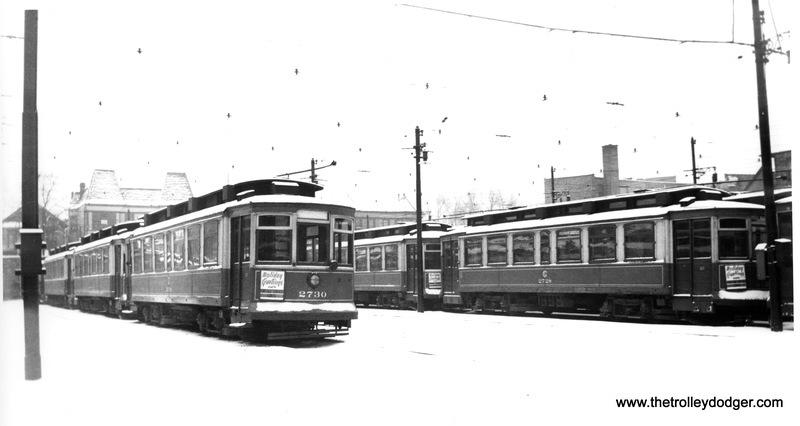 The same location today. 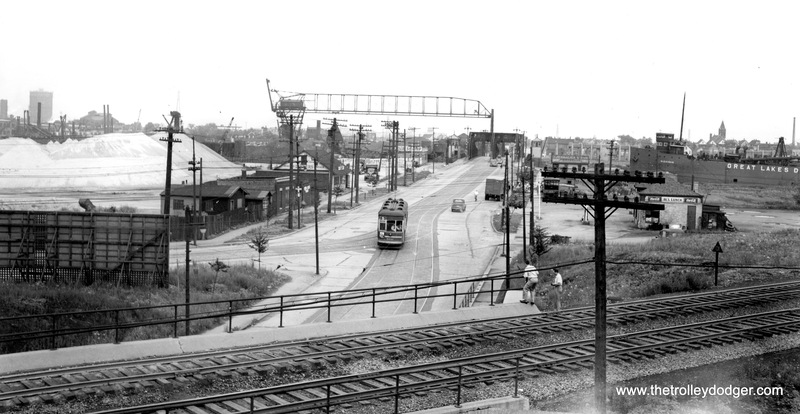 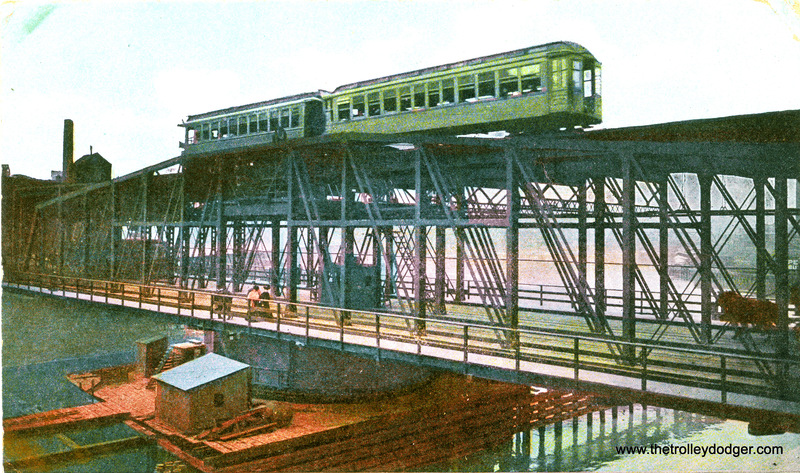 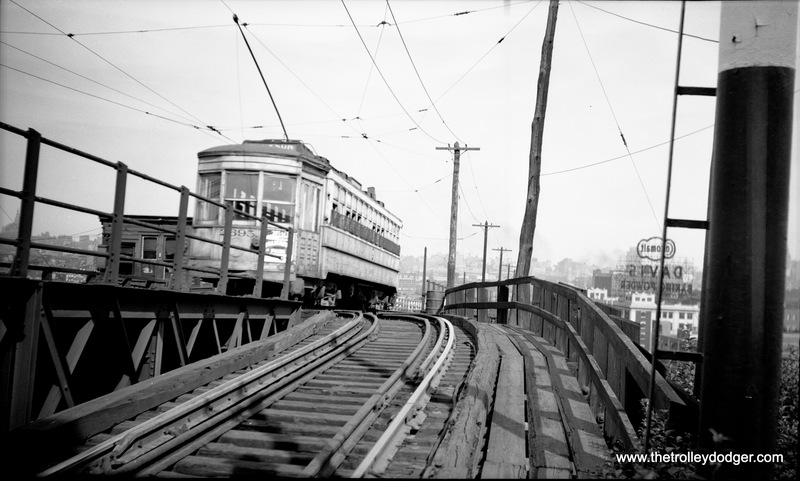 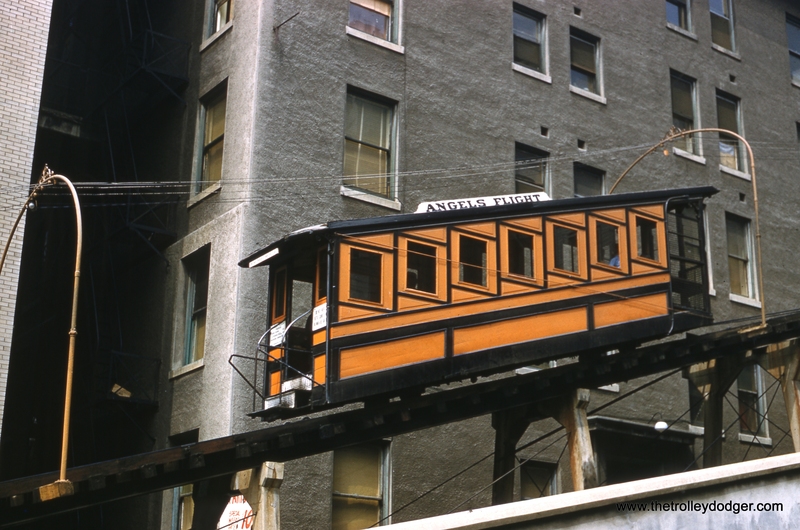 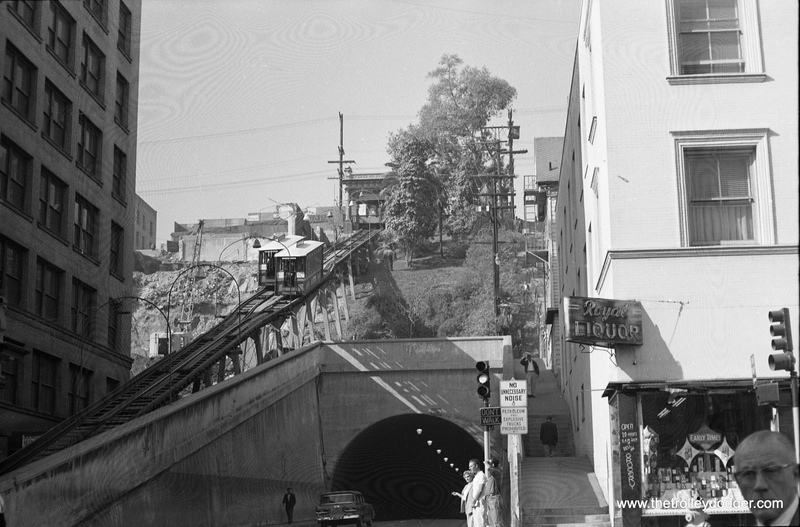 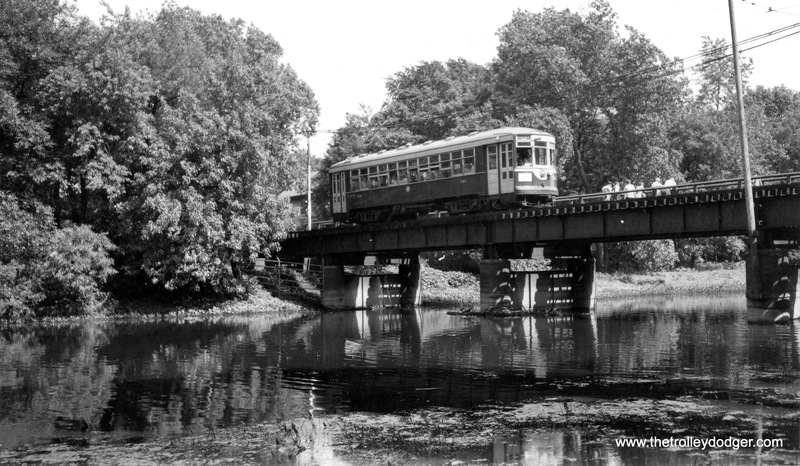 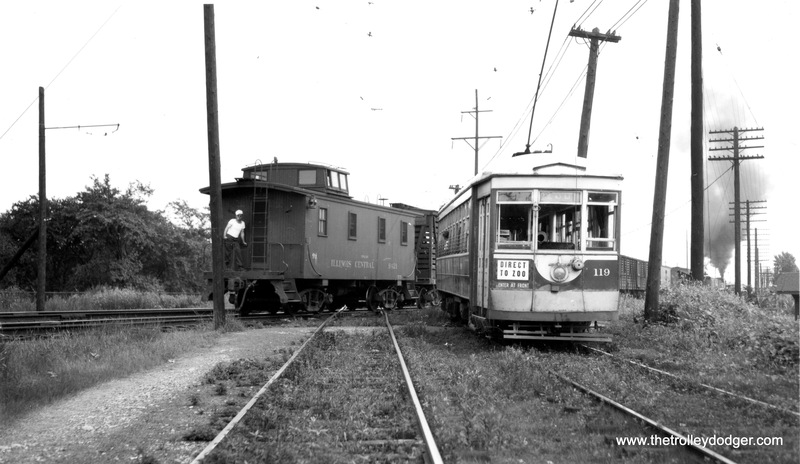 The St. Charles line still loops as it did in the 1940 picture. 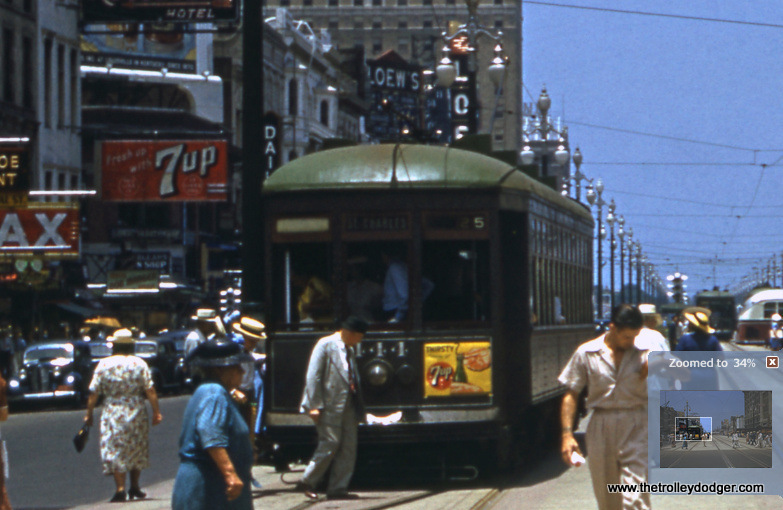 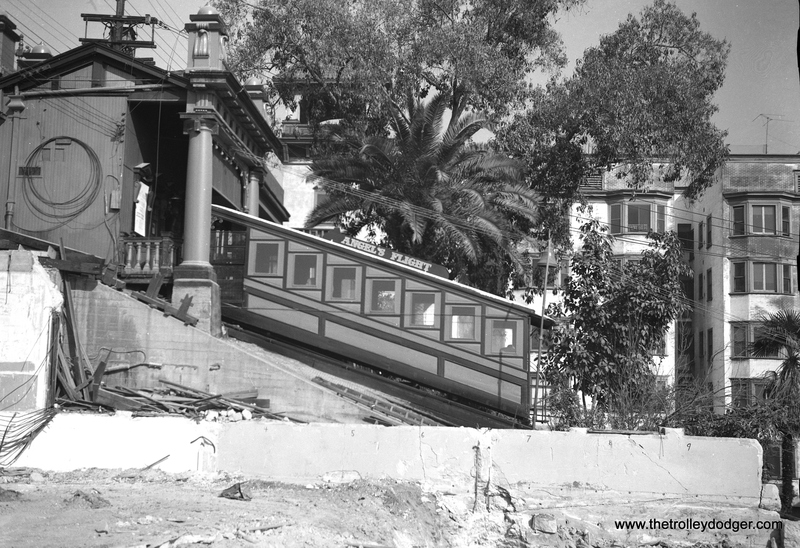 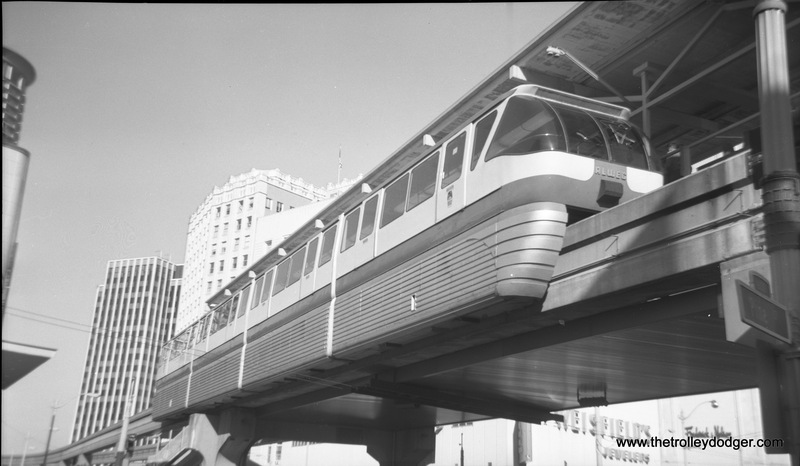 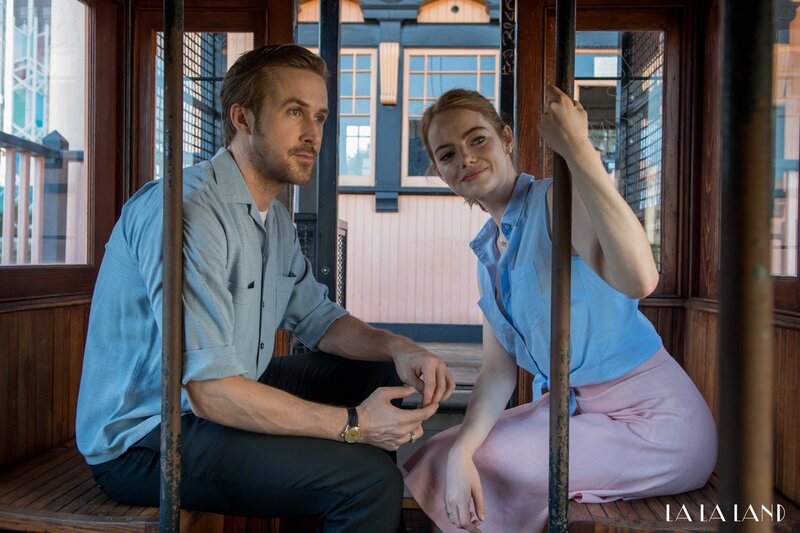 Streetcars were absent from Canal Street for 40 years starting in 1964, but have returned. 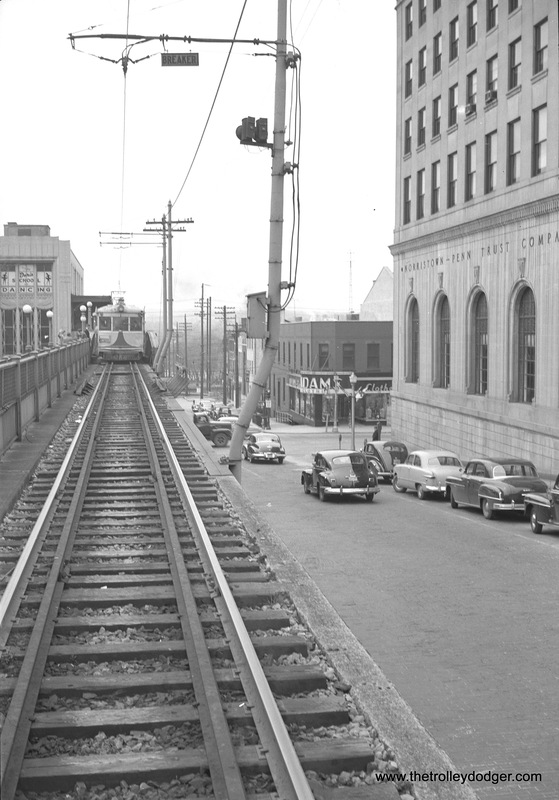 There is a crossover track, visible in this picture, connecting the two lines. 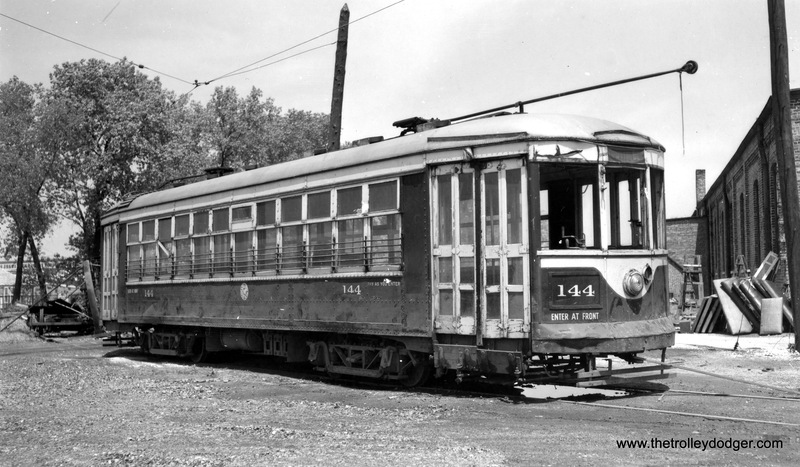 This close-up shows New Orleans Public Service car 444. 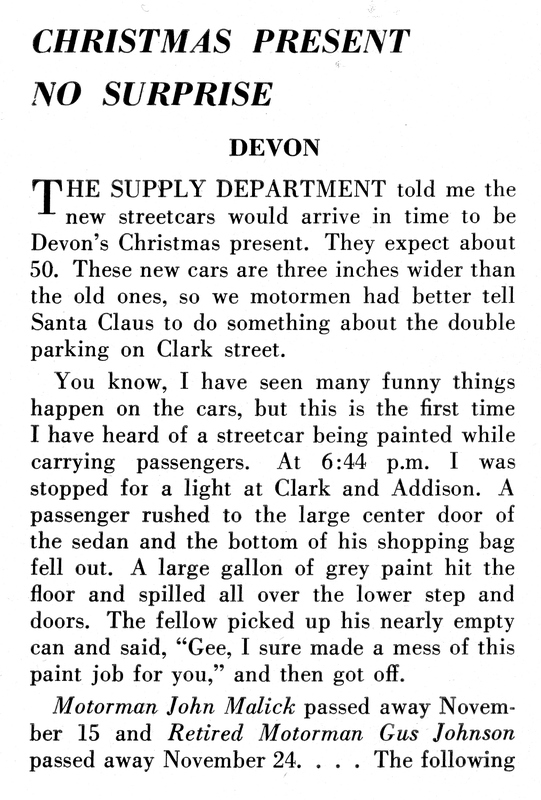 One of our regular readers says, “It is not a Perley-Thomas built car but rather a Southern Car Company car built in 1914. 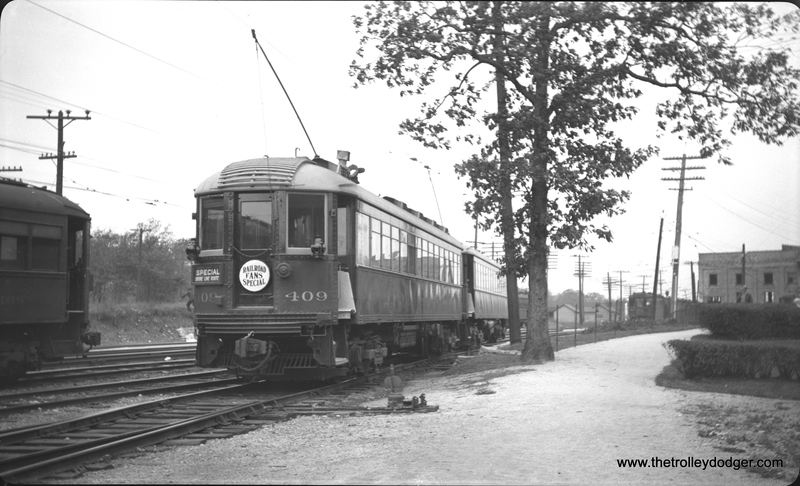 Starting in 1914, all of the car bodies appeared the same starting with car #400 even though they were not all built by Perley-Thomas.” It was part of a group of 50 cars, numbered 400-449. 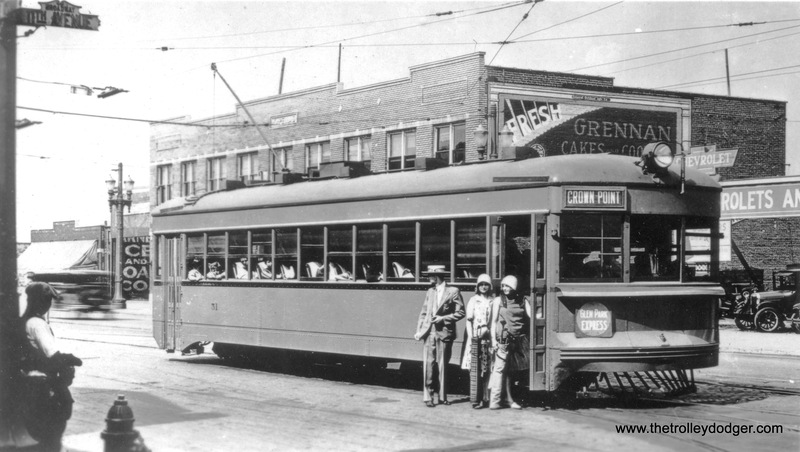 Behind the streetcar, you can see part of the marquee for the Loew’s State Theatre (also known as the State Palace), at 1108 Canal Street. 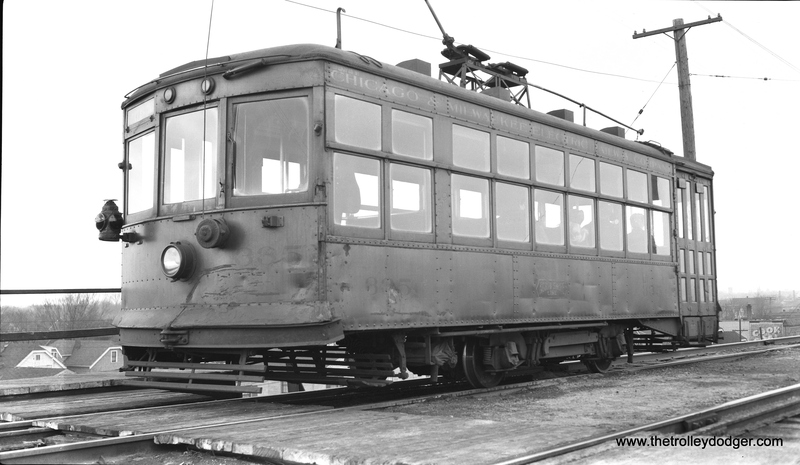 It opened in 1926, but is currently closed and awaiting restoration. 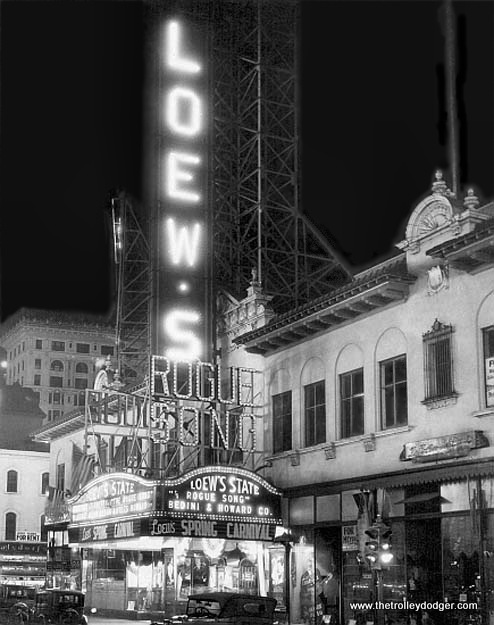 You can see some pictures of that theater’s interior here. 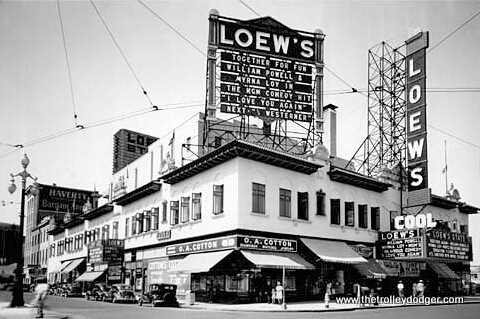 Loew’s circa 1940, showing I Love You Again, an MGM comedy starring William Powell and Myrna Loy, directed by W. S. Van Dyke. 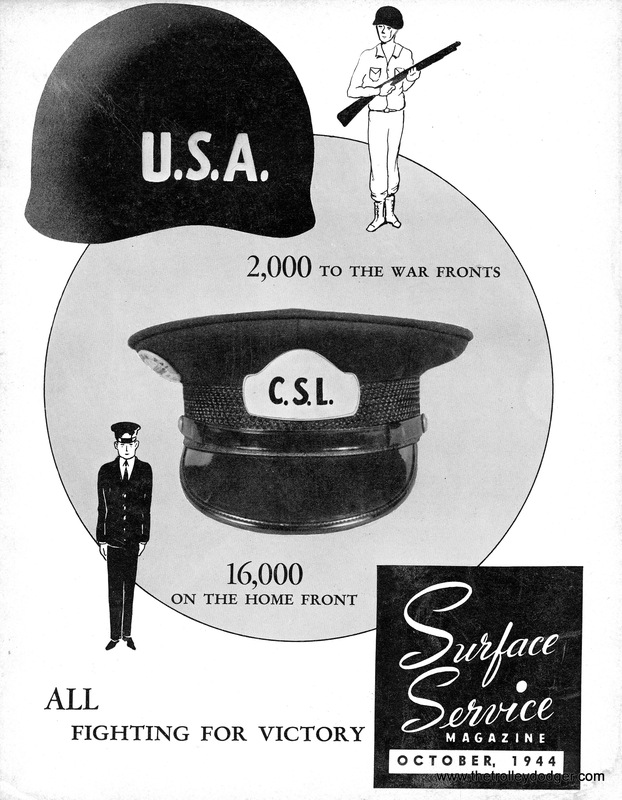 All three were associated with the Thin Man series of films, which were very popular. 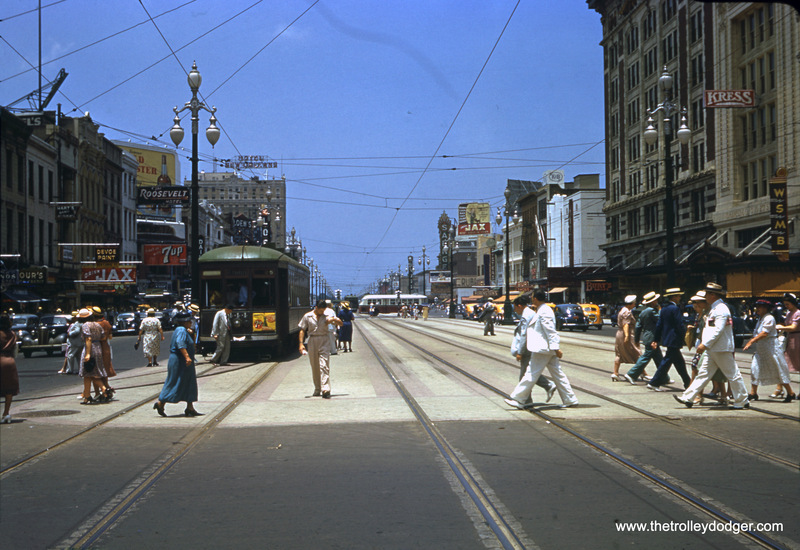 A postcard view of Canal Street, showing the same general area as the 1940 slide, but looking from the opposite direction. 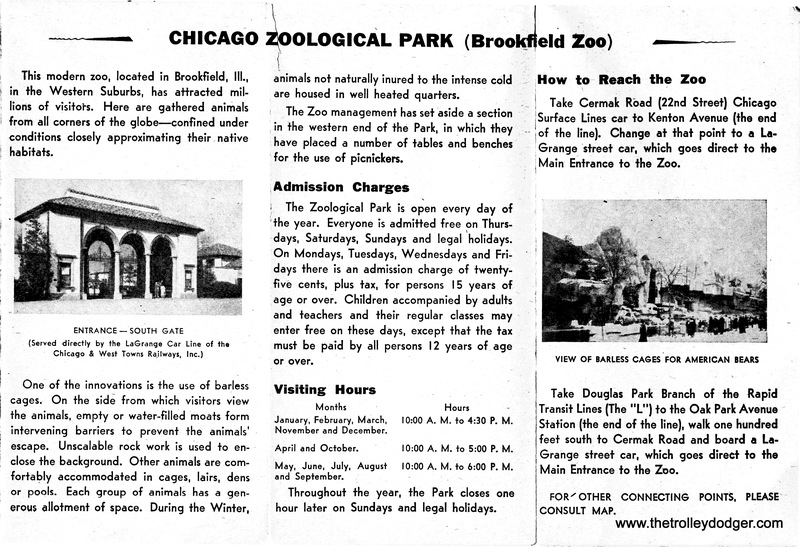 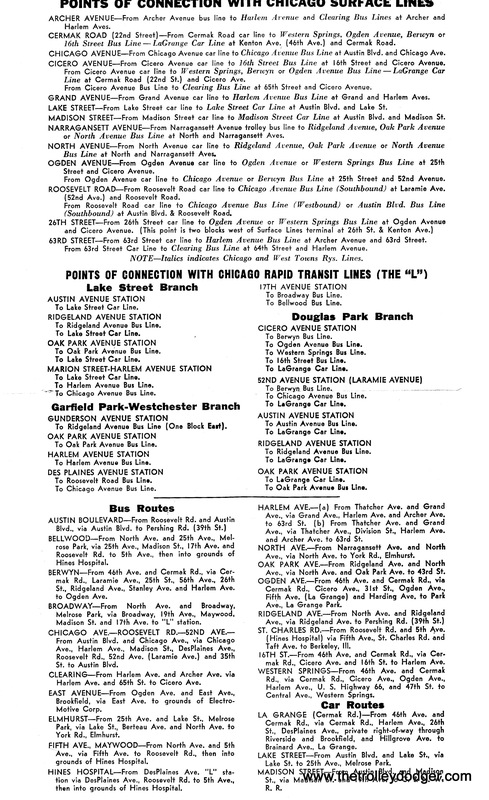 A Chicago & West Towns route map, from April 1942. 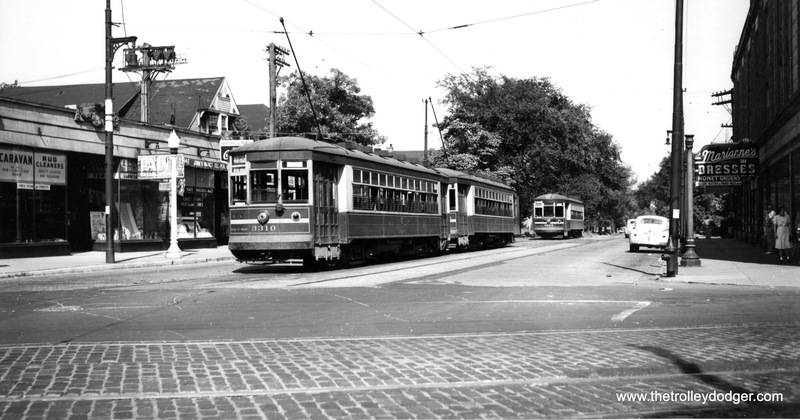 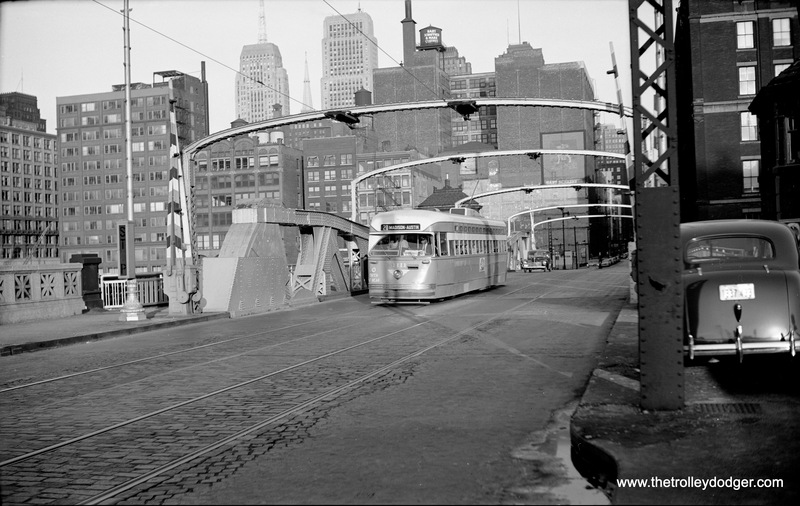 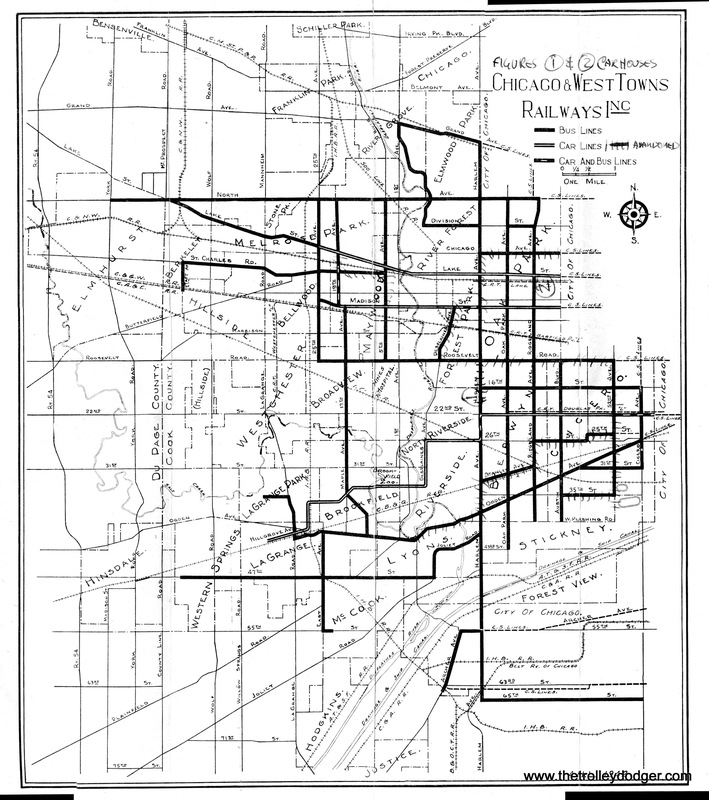 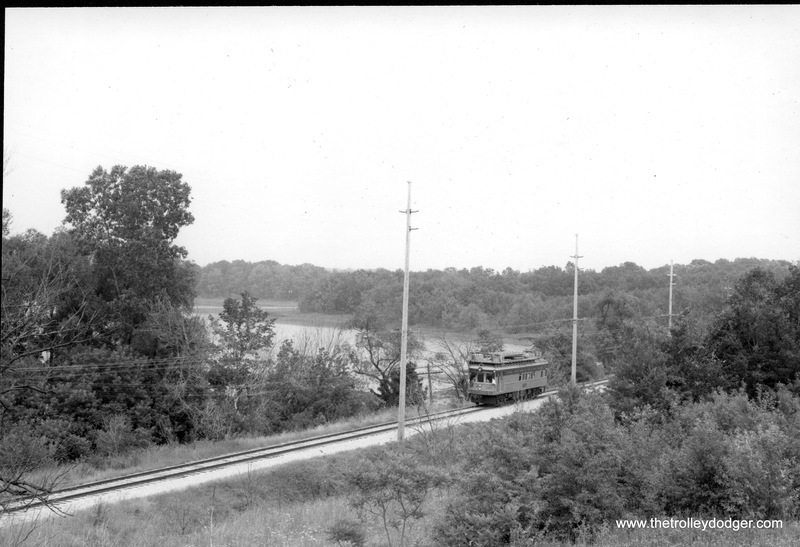 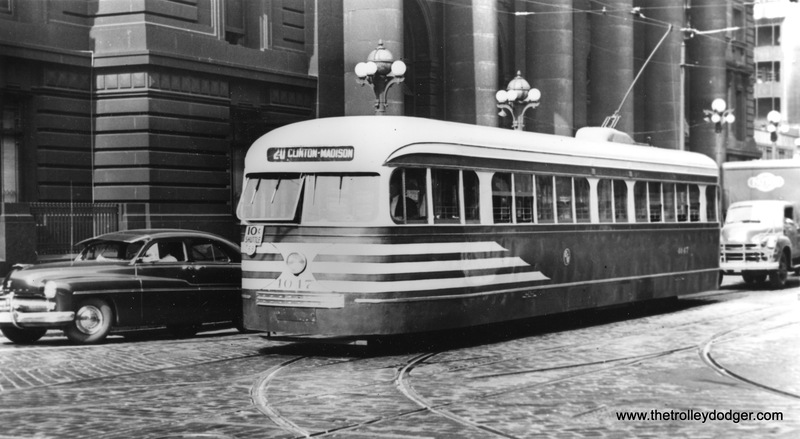 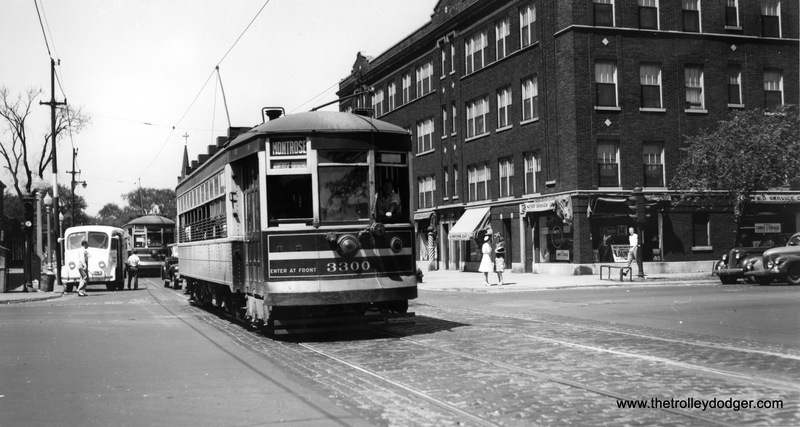 By this time, only three streetcar lines were left: LaGrange, Lake, and Madison. 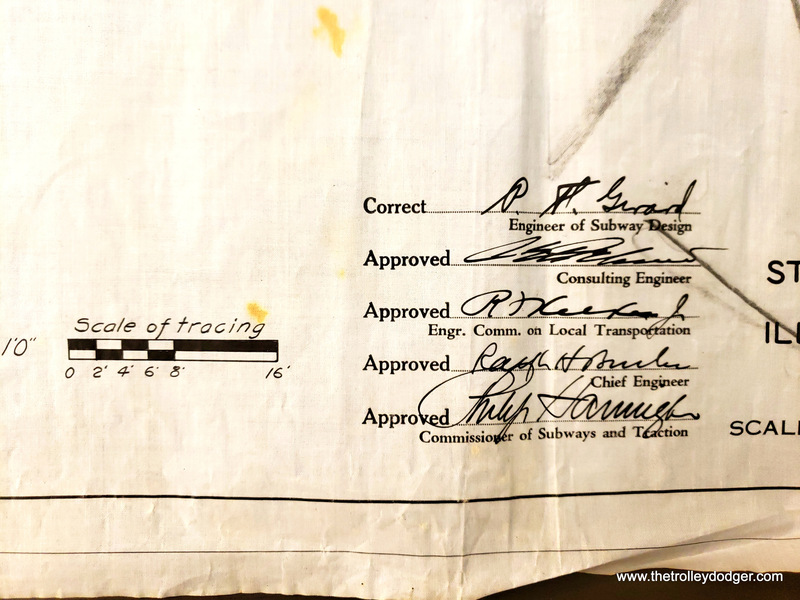 The owner of the map crossed out (with has marks) some routes that were abandoned later. 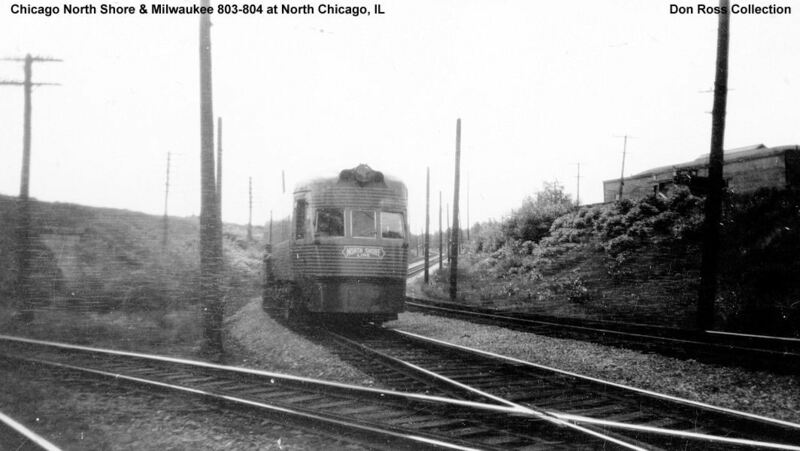 There was, by 1942, no track connection between the two north side lines and the LaGrange line. 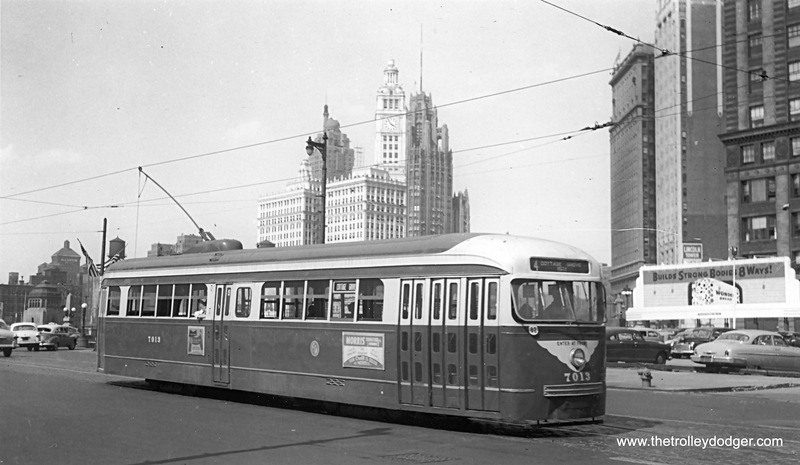 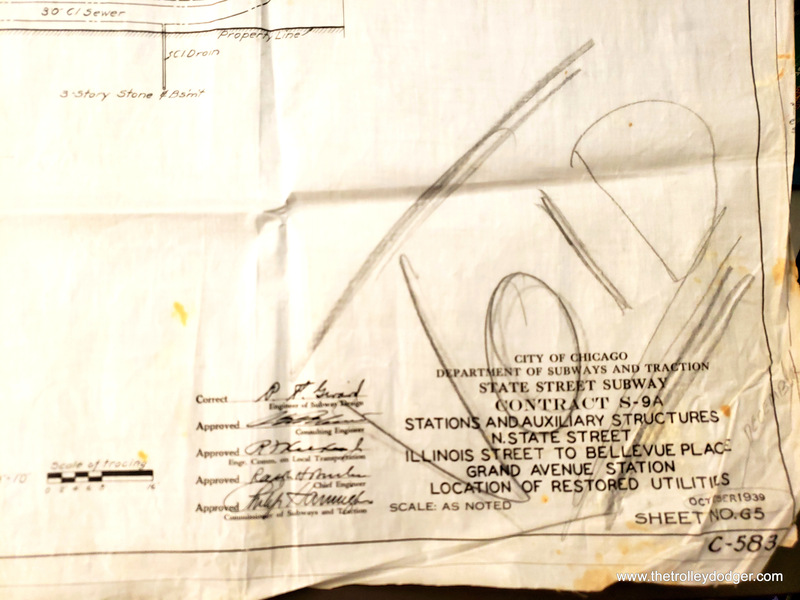 When the Lake and Madison lines were finally bustituted, the remaining streetcar fleet was moved at night in 1947 on a circuitous route via Chicago Surface Lines trackage. 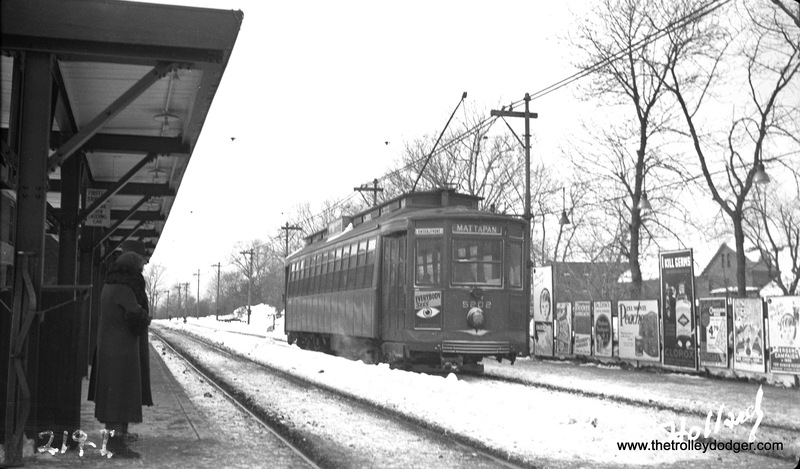 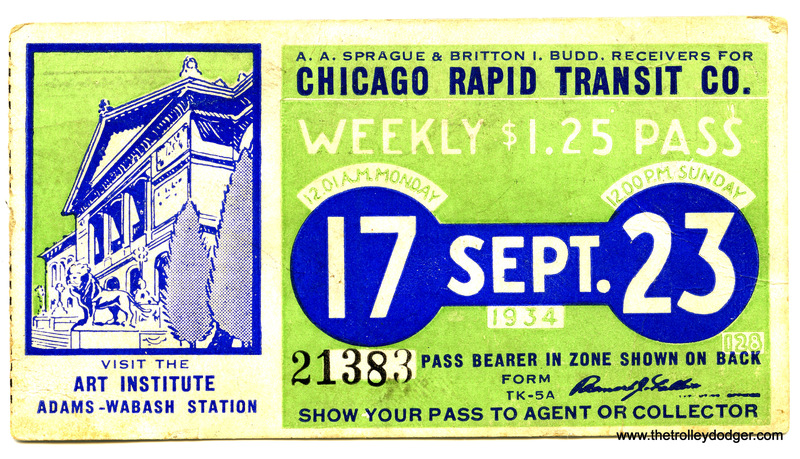 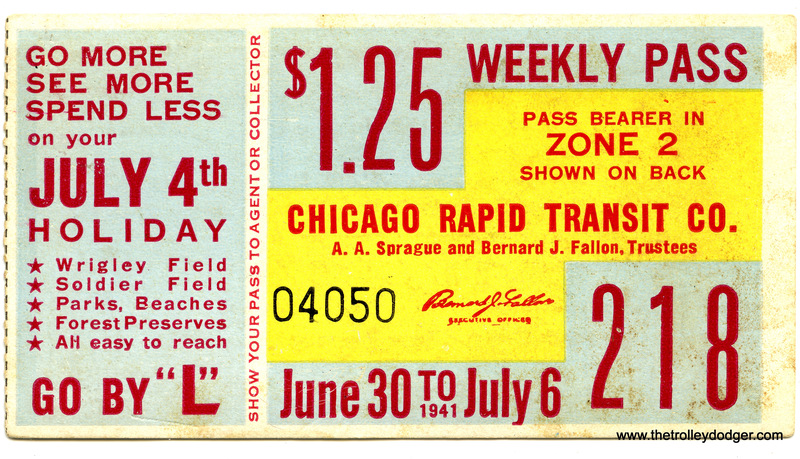 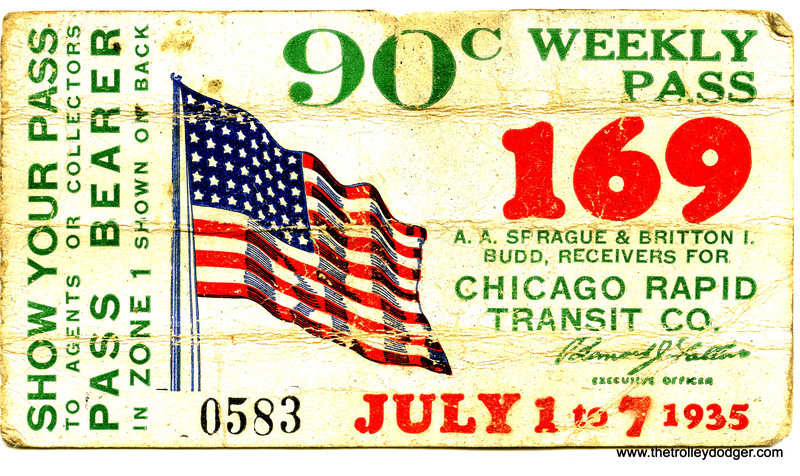 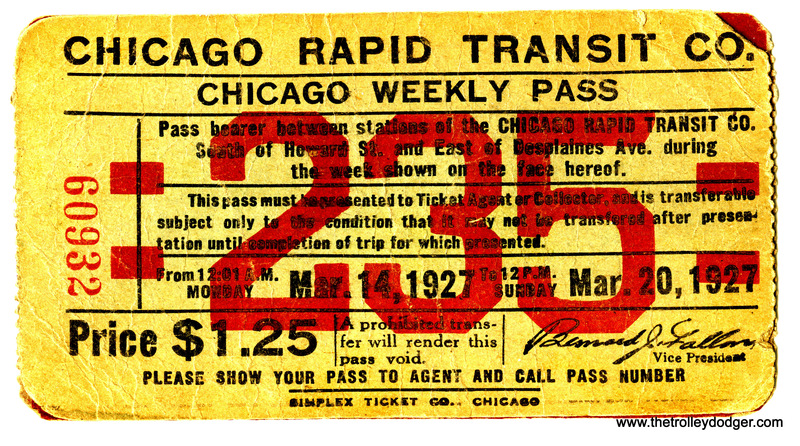 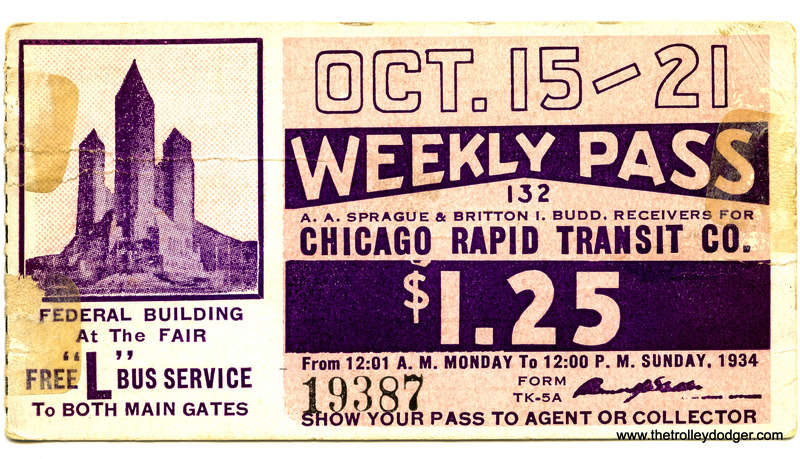 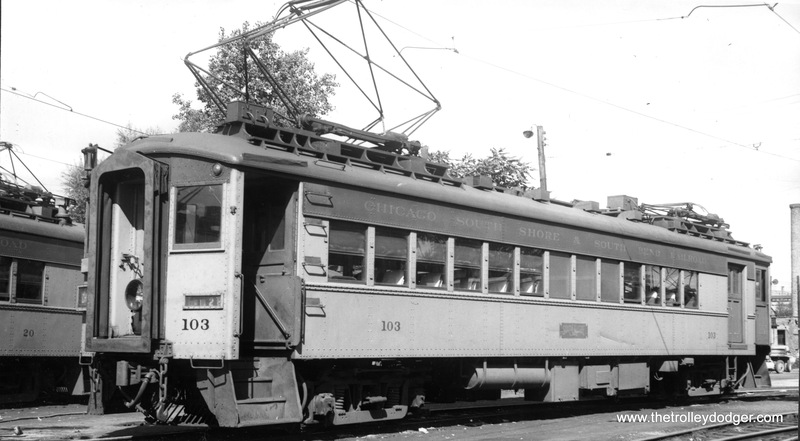 The Chicago & West Towns was a major streetcar operator in Chicago’s western suburbs until April 1948, when the last line was converted to bus. 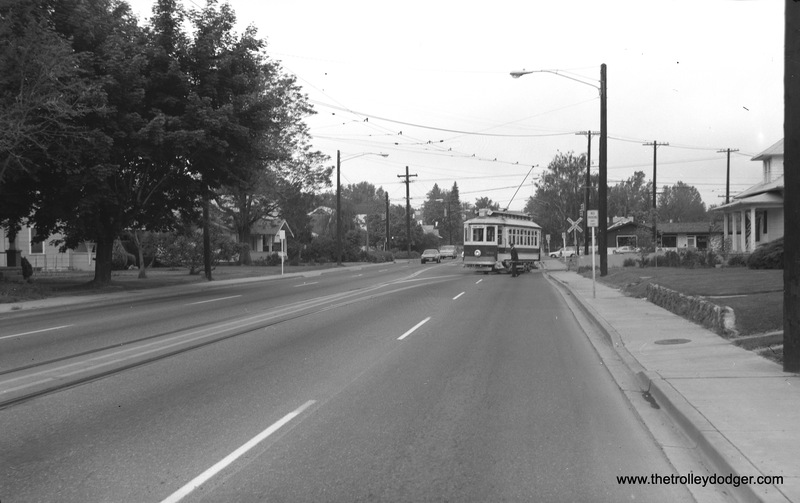 Bus operation continues today as part of Pace, a public agency. 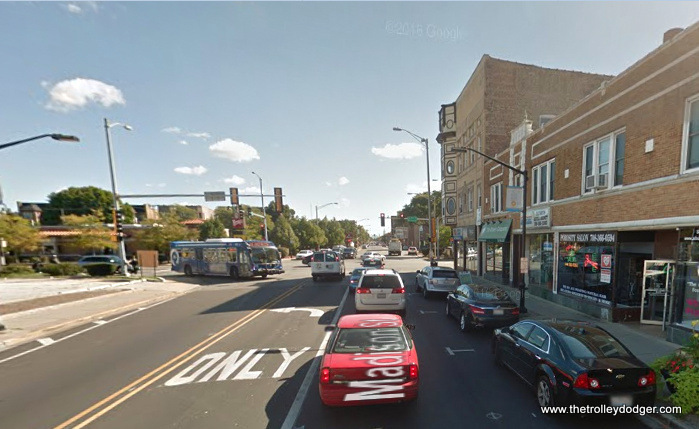 Madison and Harlem today. 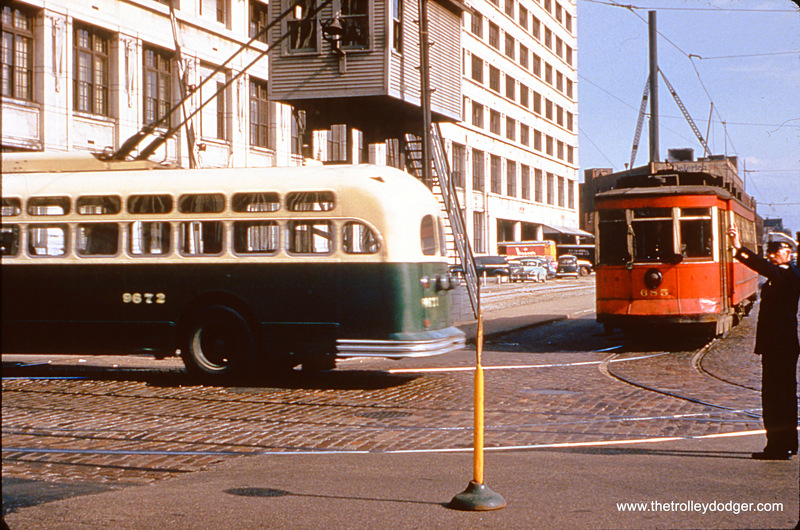 A route 318 Pace bus is turning from Harlem onto Madison. 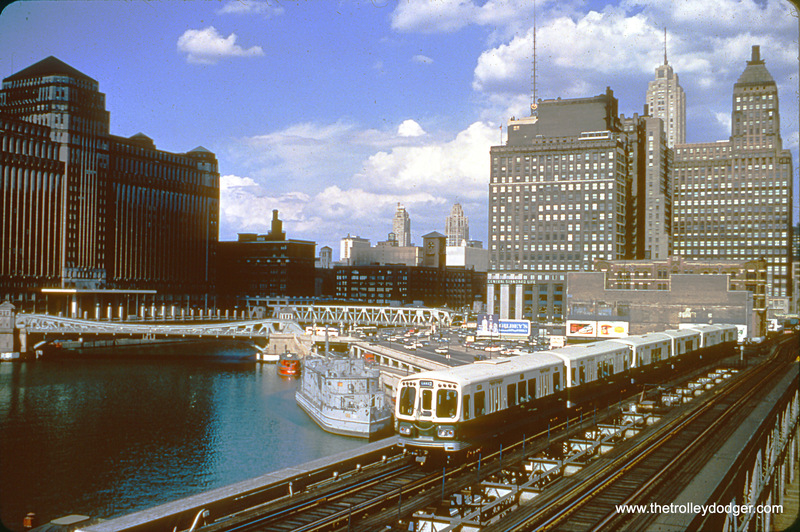 Pace is the successor to the West Towns. 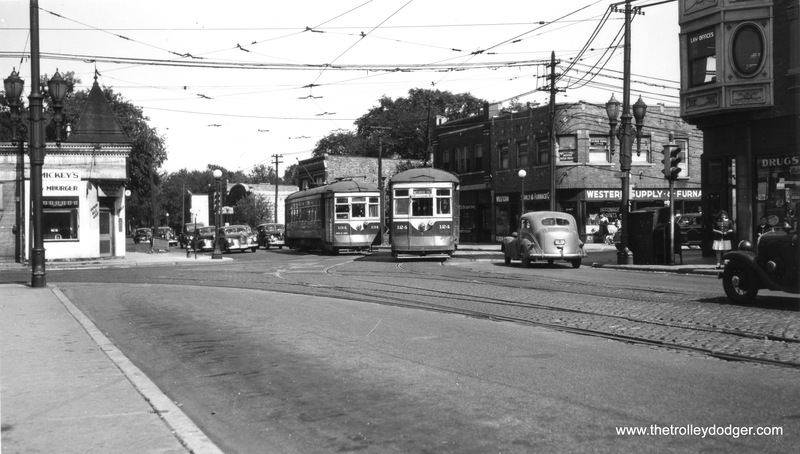 At some point, it appears that Madison was widened to eliminate the jog seen in the earlier photo. 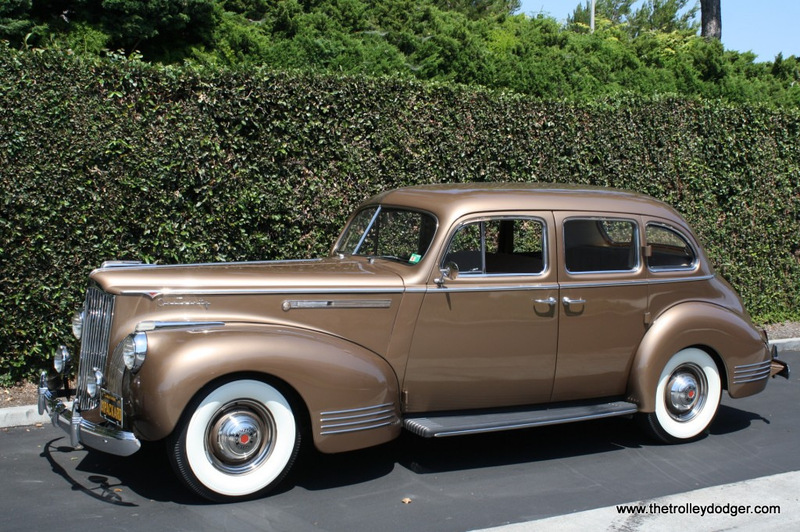 A 1941 Packard One Twenty sedan. 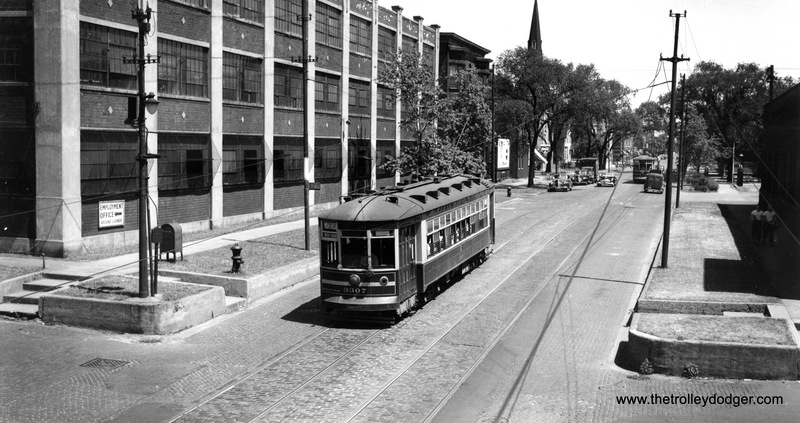 Lake Street just west of Austin Boulevard today. 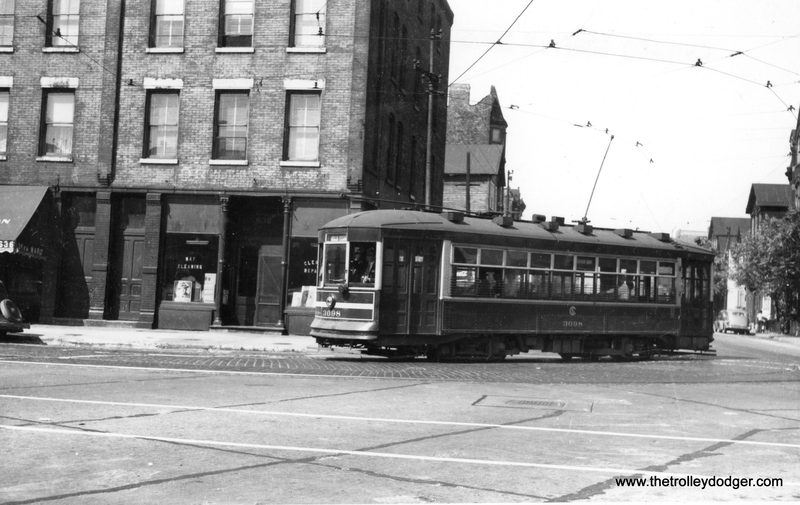 The top of this building, on 26th Street just east of DesPlaines Avenue in North Riverside, has been altered, but it is still recognizable as the same building in the previous picture. 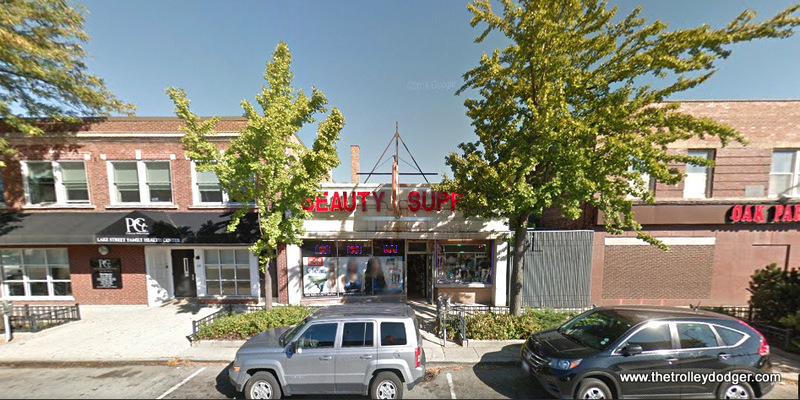 The laundry in the previous photo is now a beauty parlor. 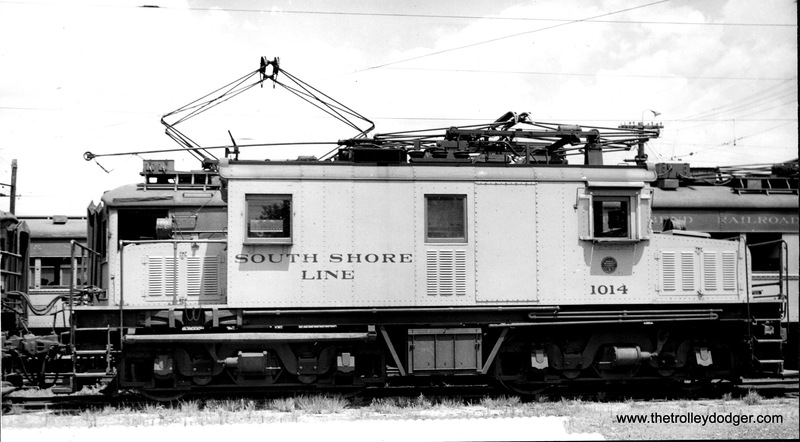 The way to distinguish South Shore Line street running photos from one city to another usually includes counting the number of tracks. 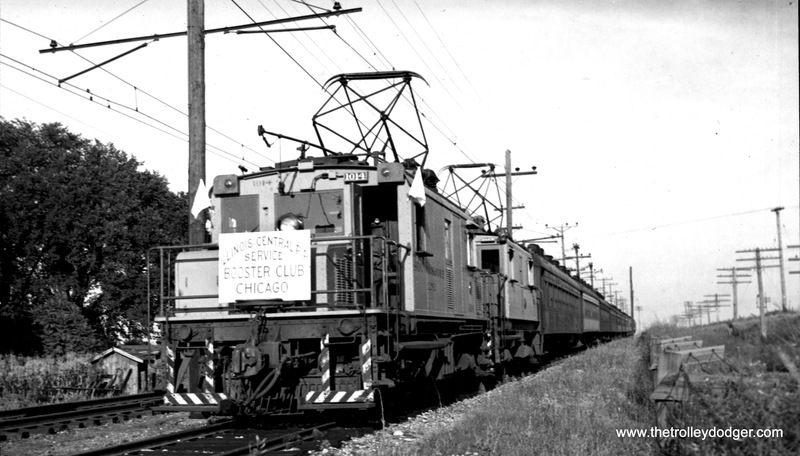 Only East Chicago was double tracked. 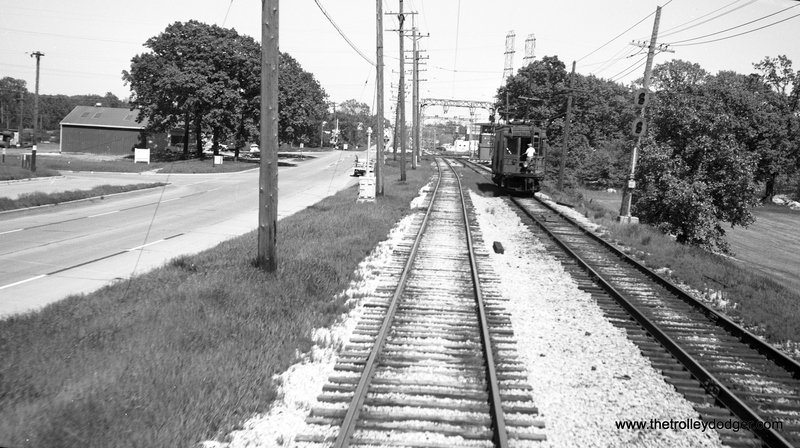 However, this is Michigan City, as there are two tracks for a short distance near the station seen at rear, since many runs begin and end here. 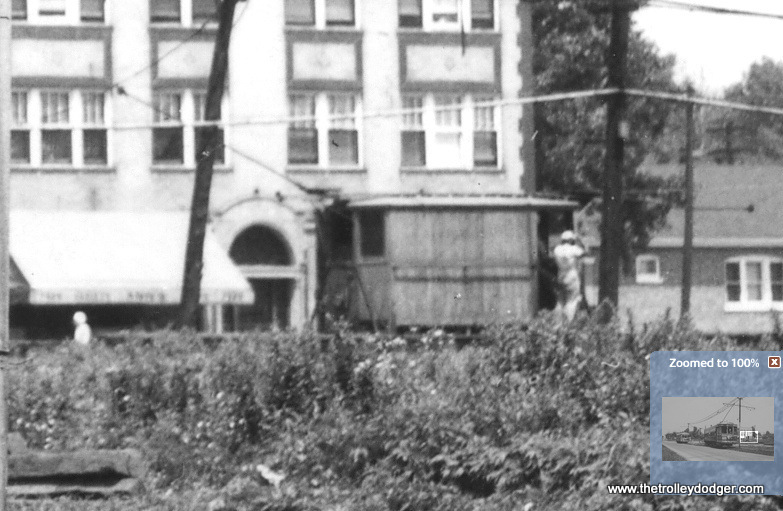 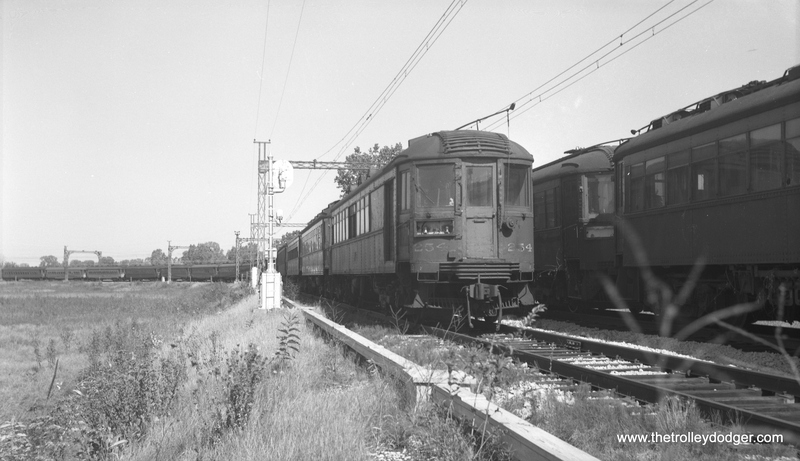 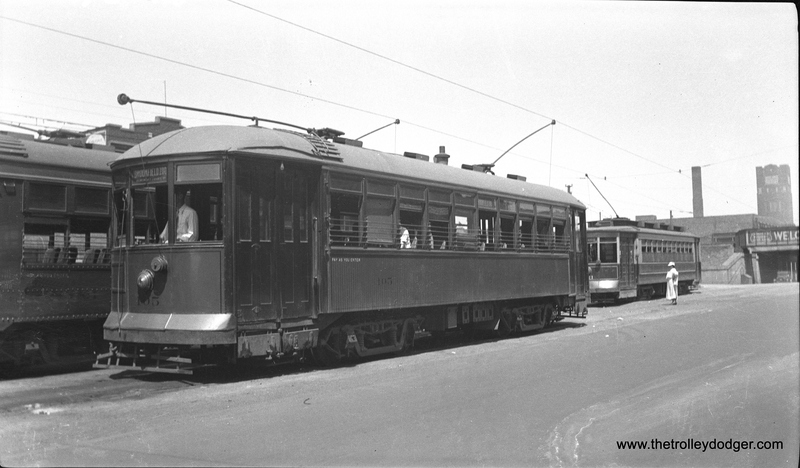 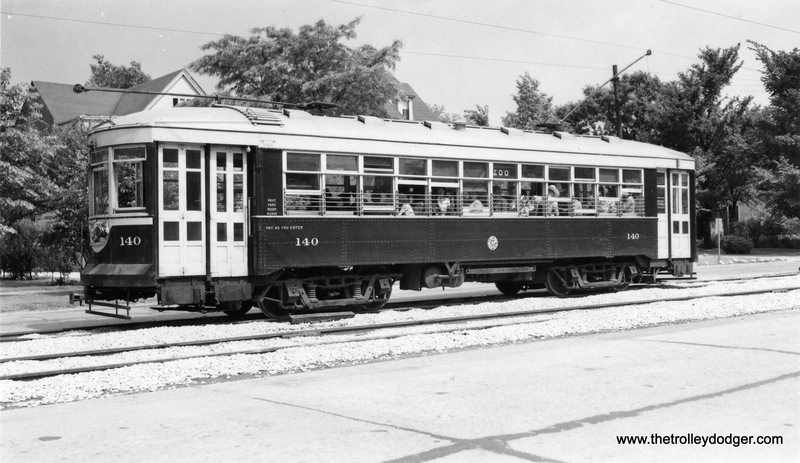 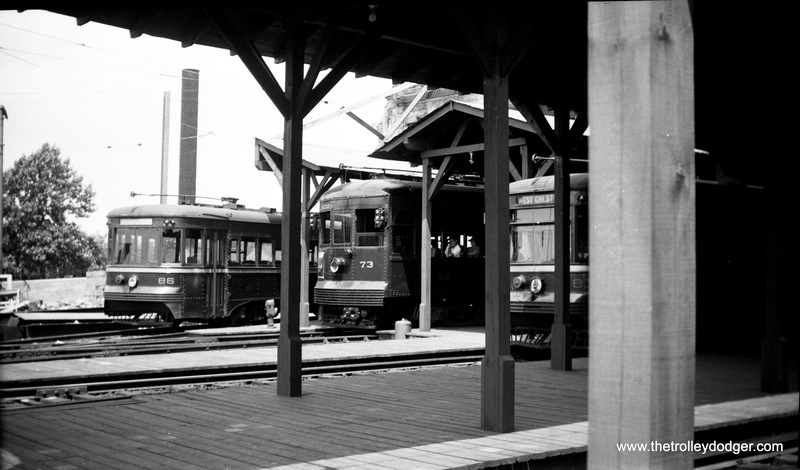 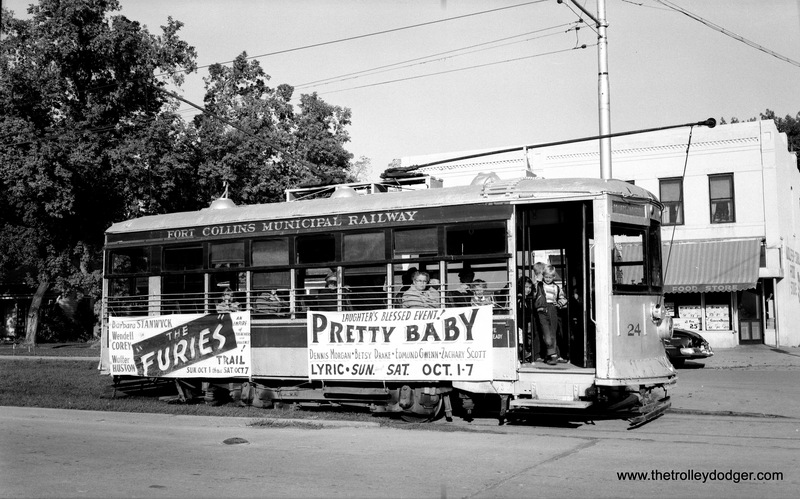 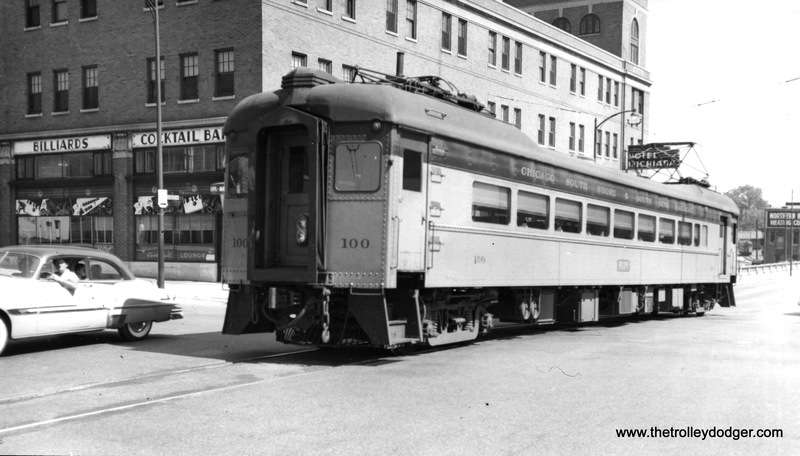 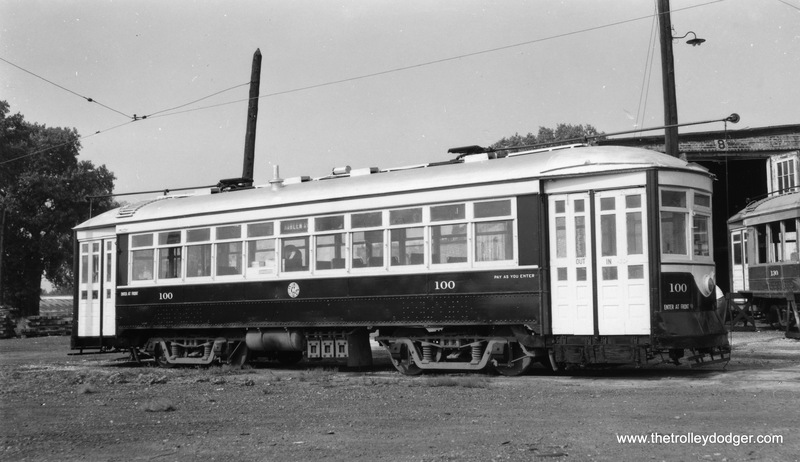 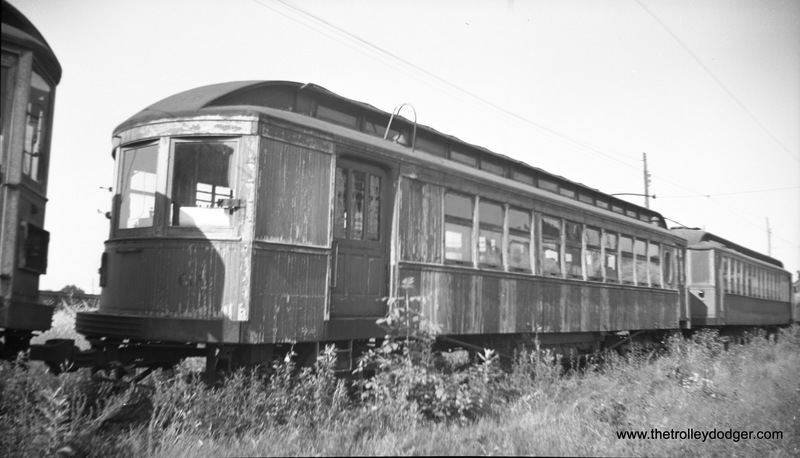 This picture, showing car 105 and train, was taken on August 6, 1948. 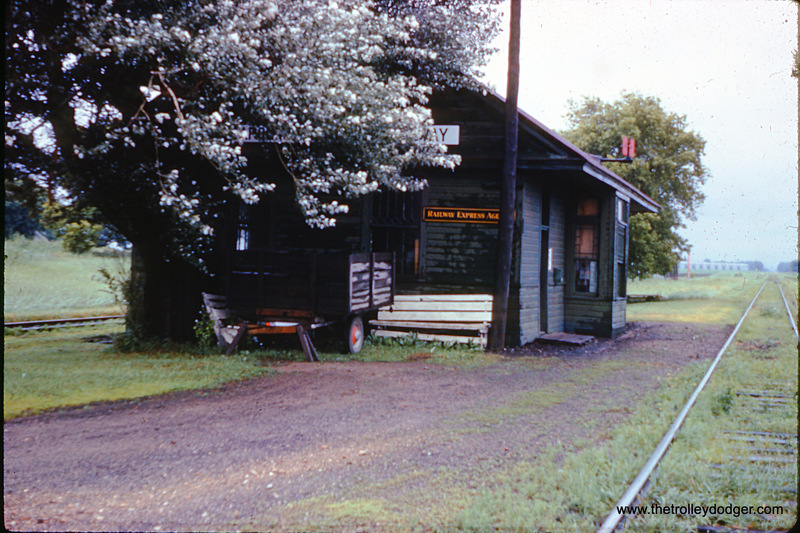 The station building still exists but is no longer in use. 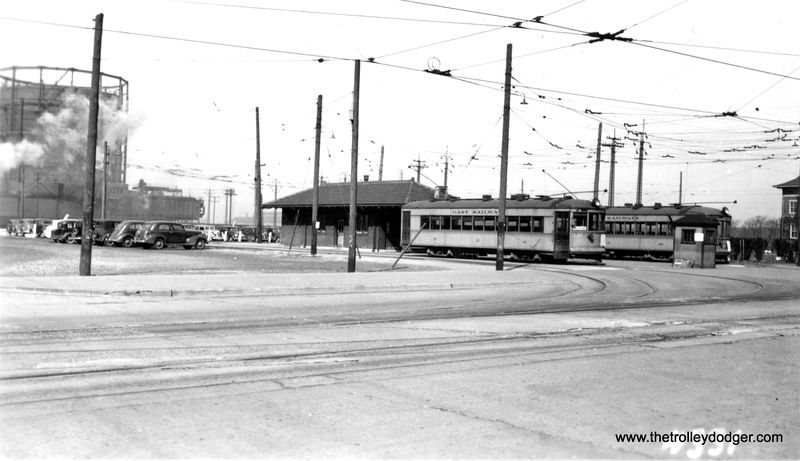 Chicago Lake Shore & South Bend Ry. 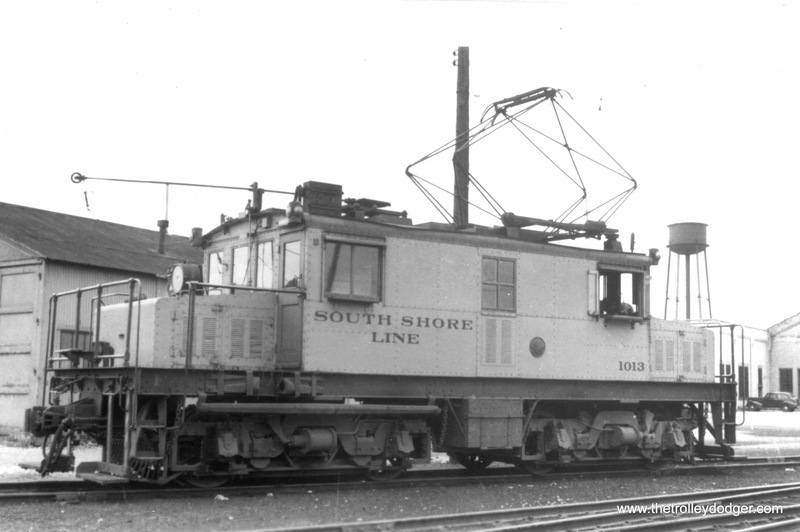 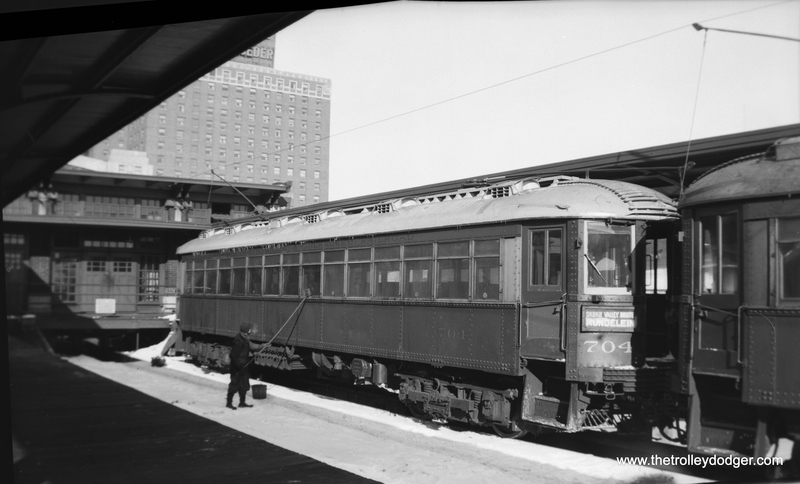 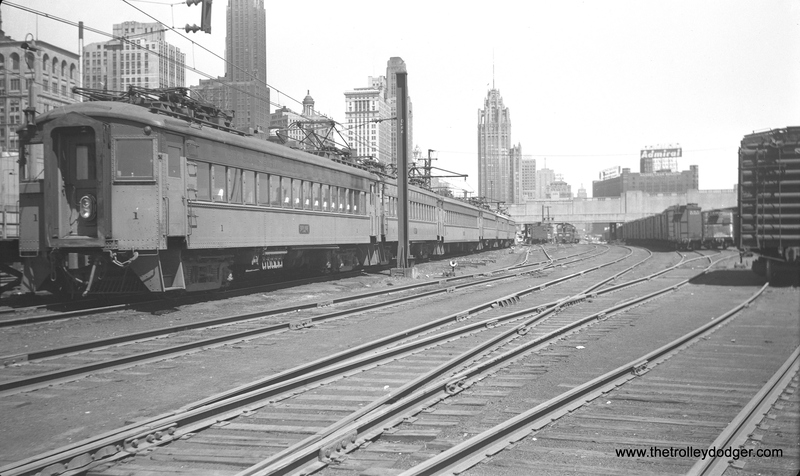 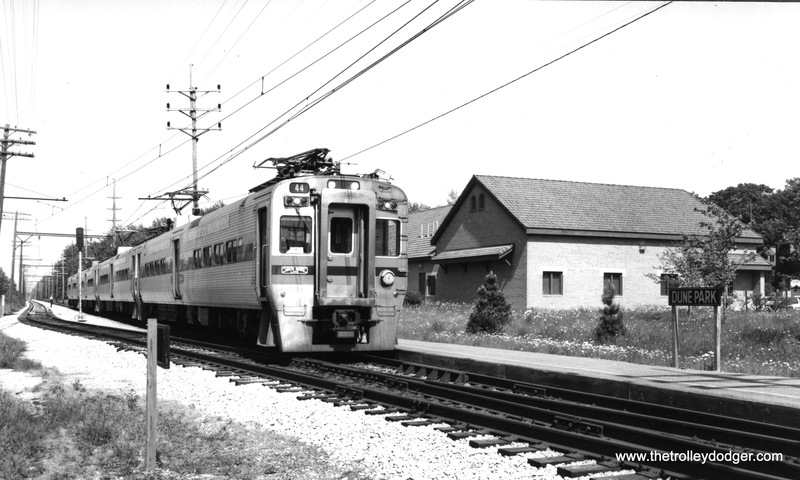 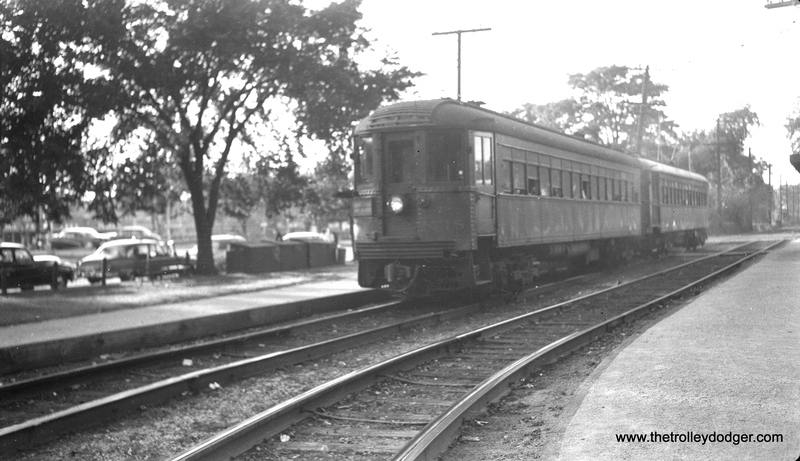 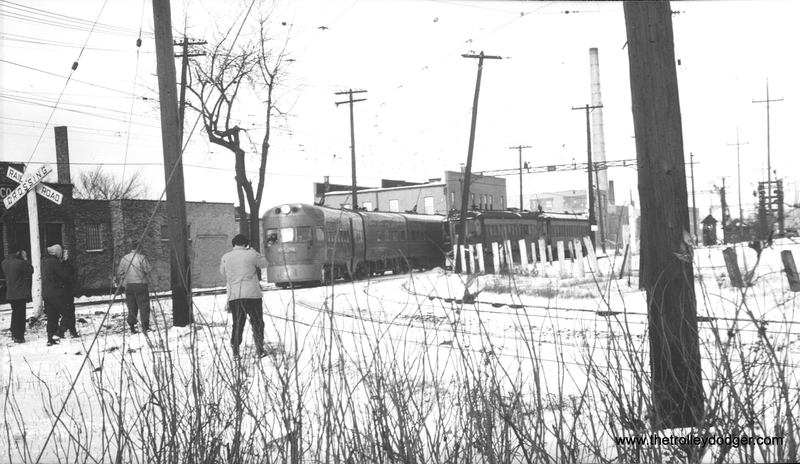 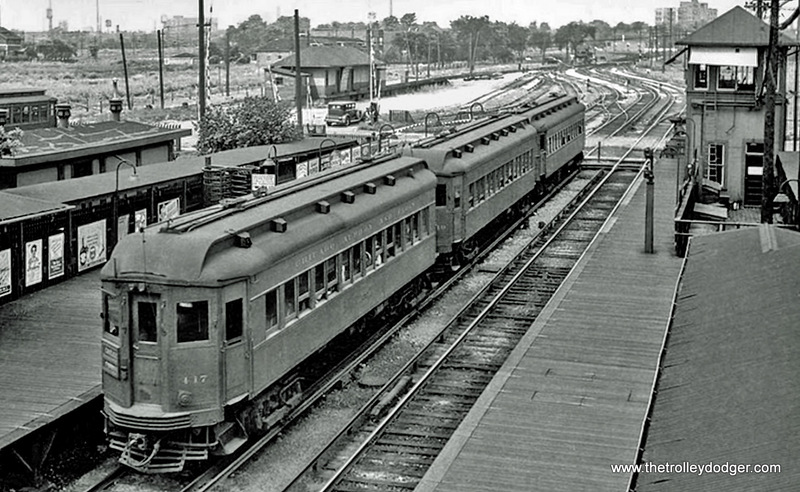 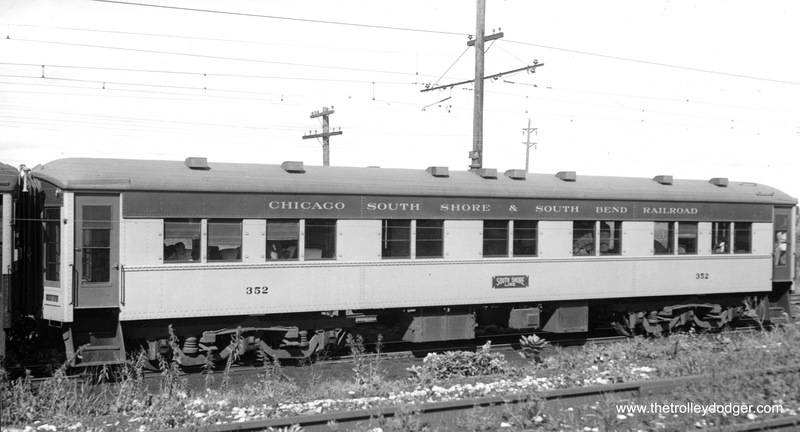 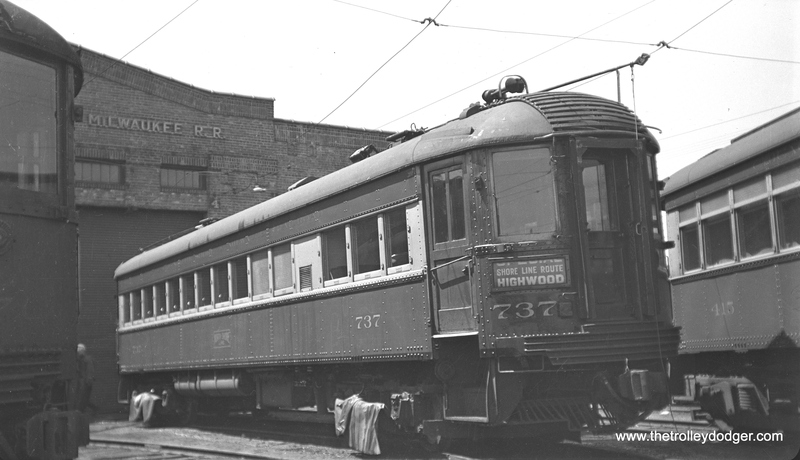 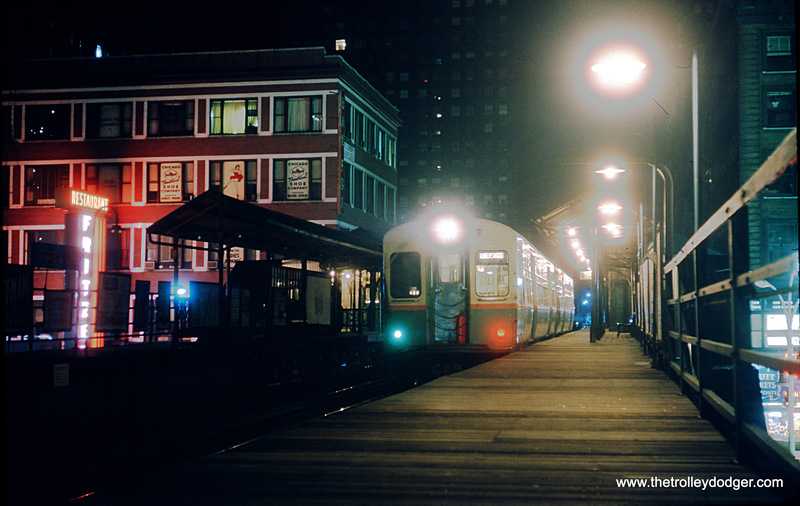 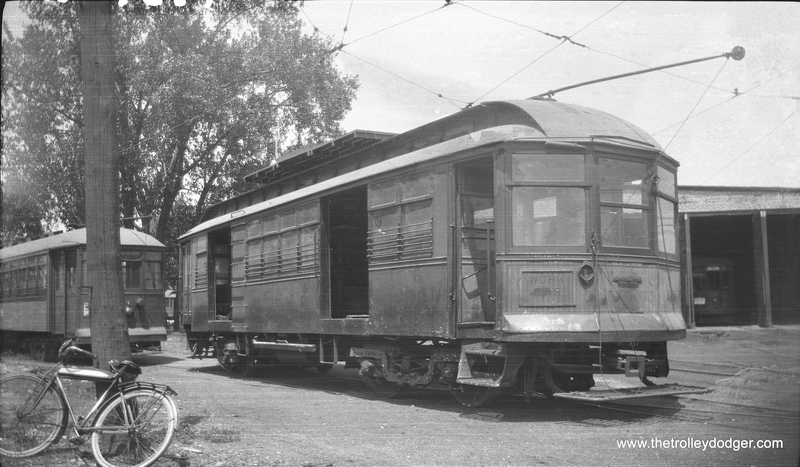 (predecessor of the South Shore Line) car 68 at an unknown location near a wooden Chicago “L” car. 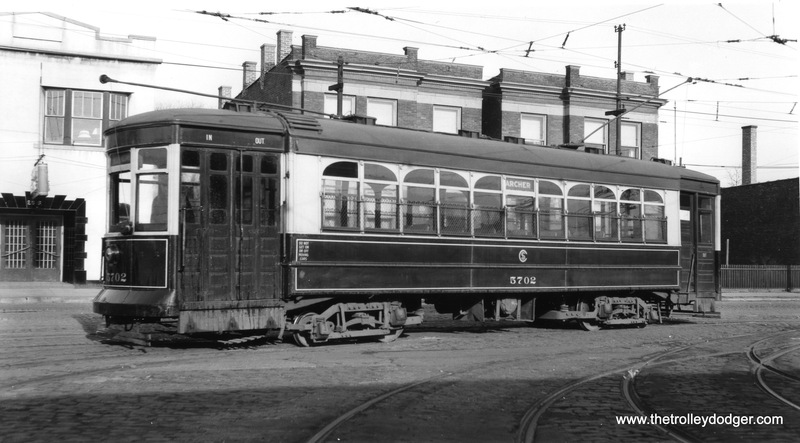 This photo is a real mystery, since, as far as I know, this car has not been preserved (although car 73 is being restored). 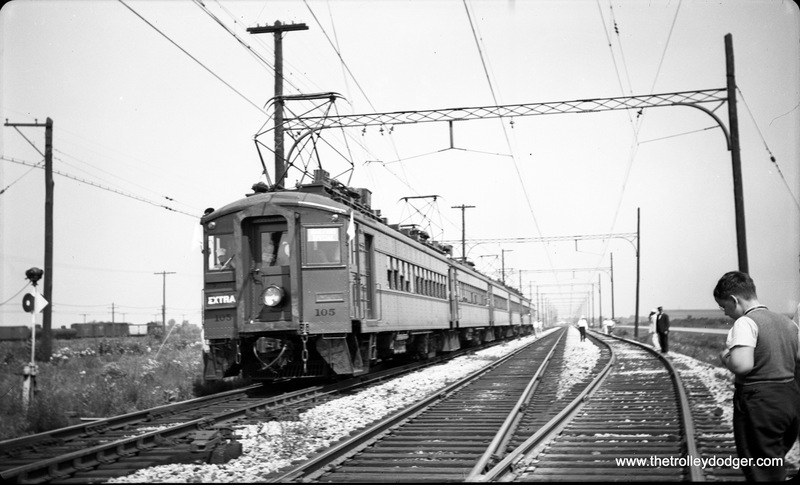 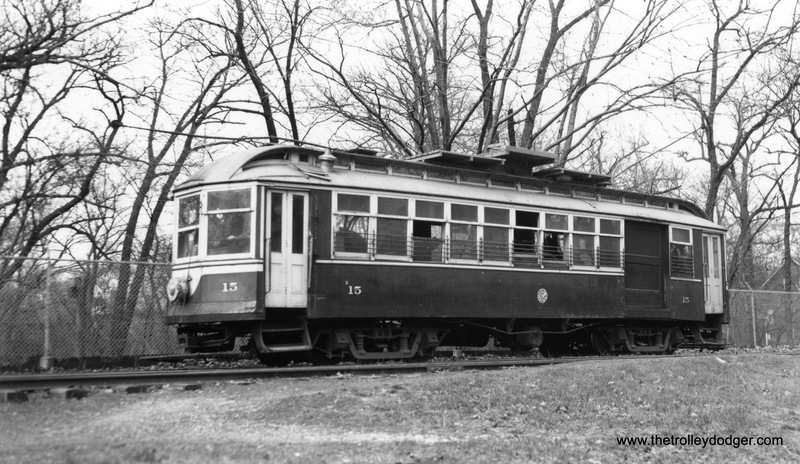 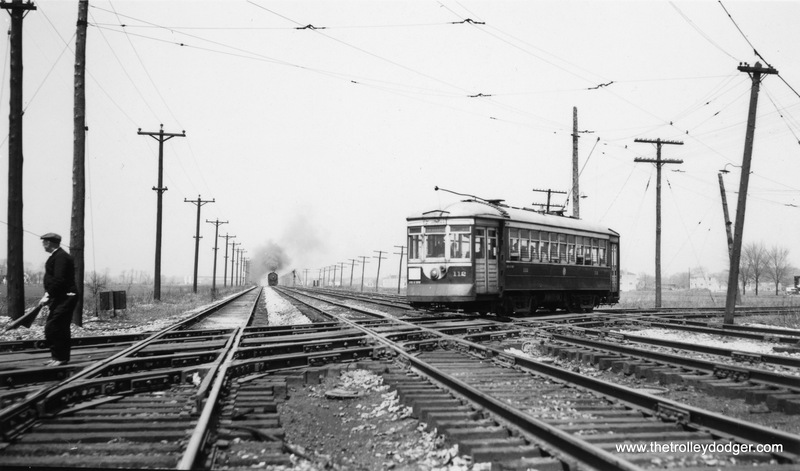 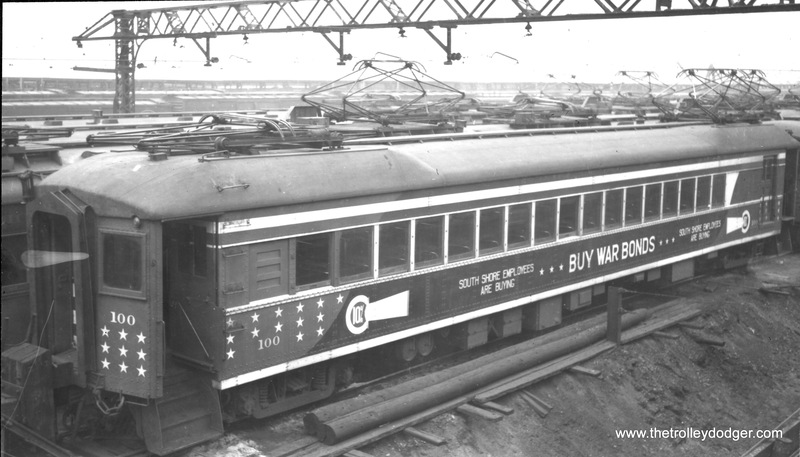 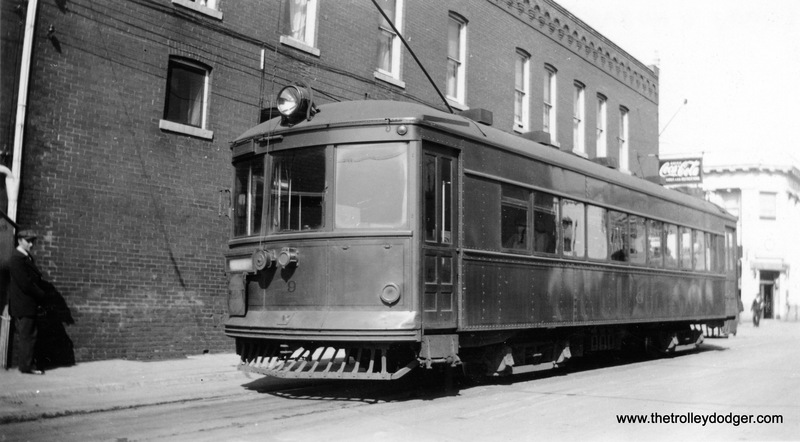 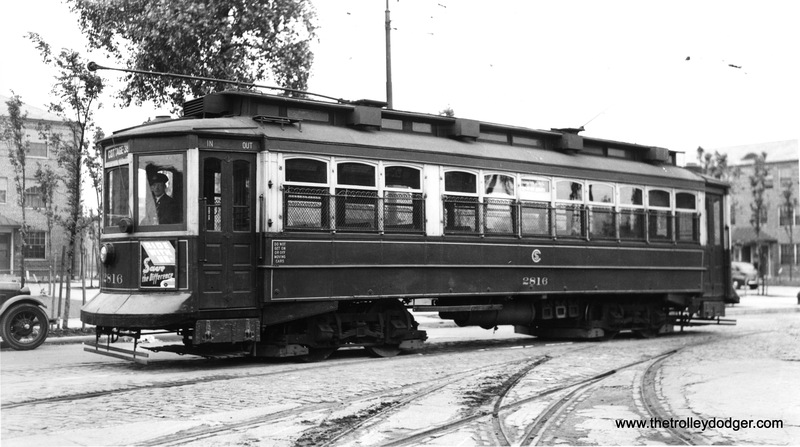 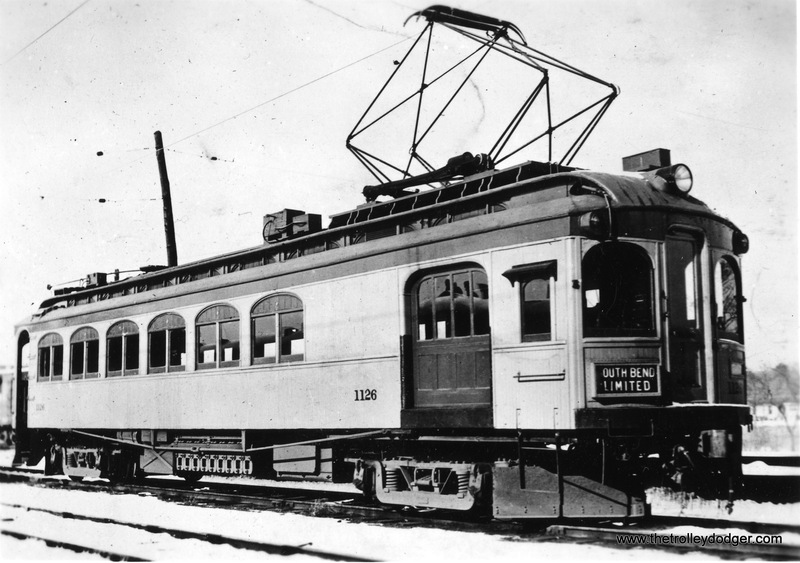 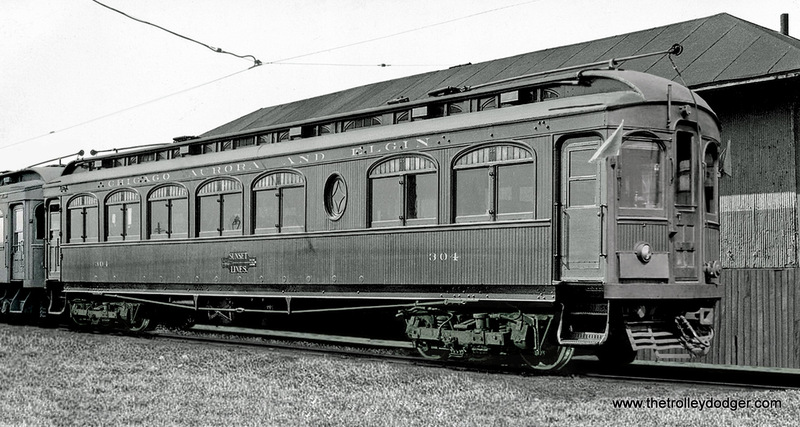 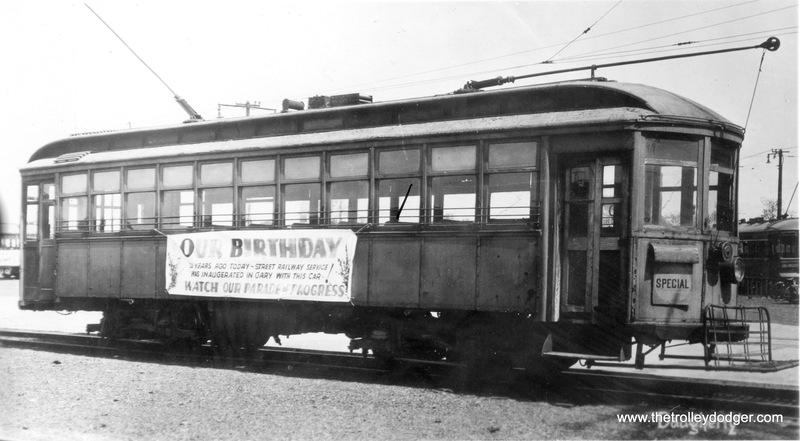 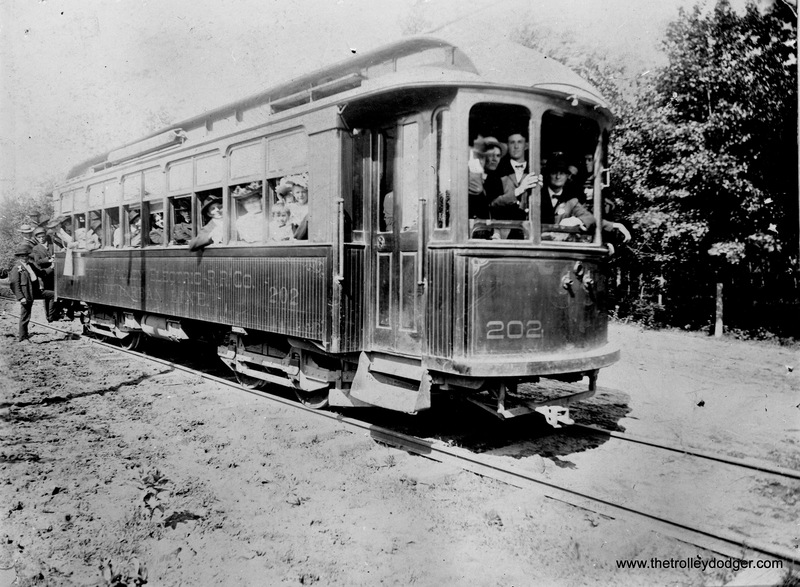 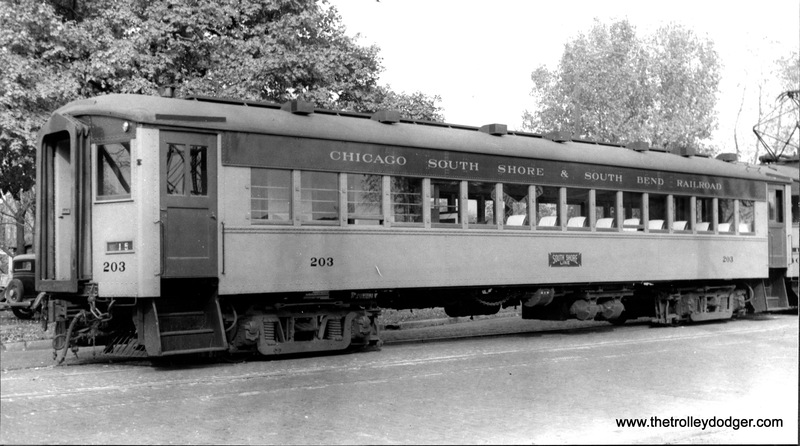 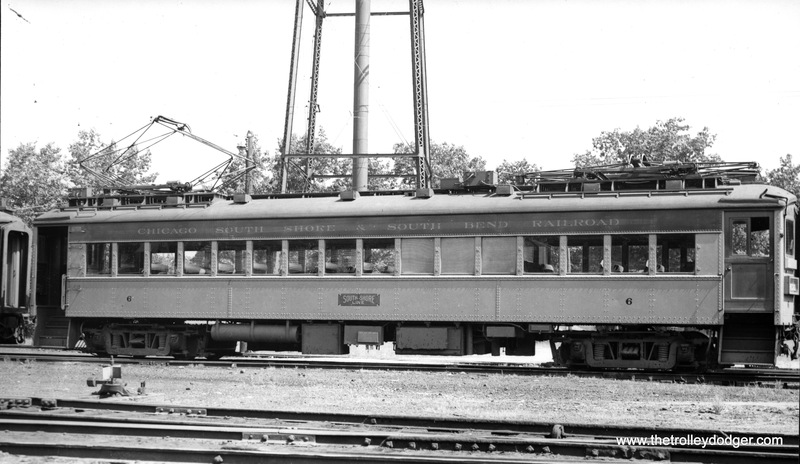 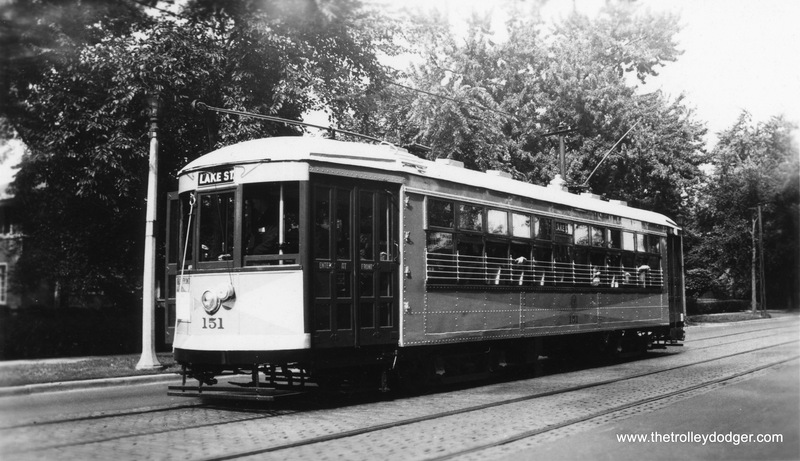 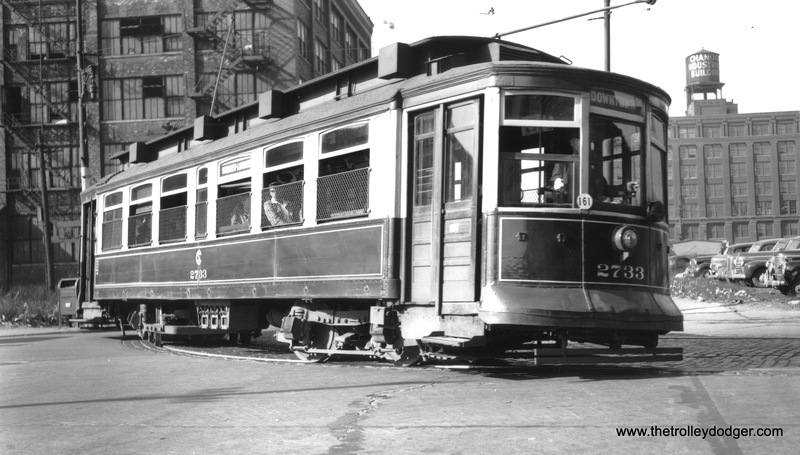 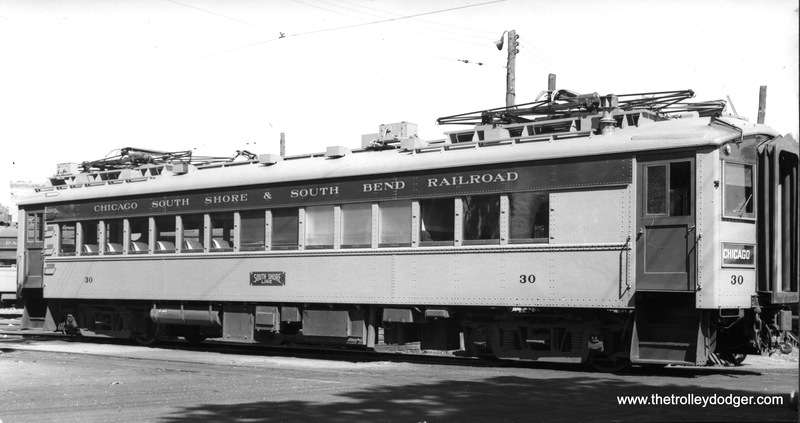 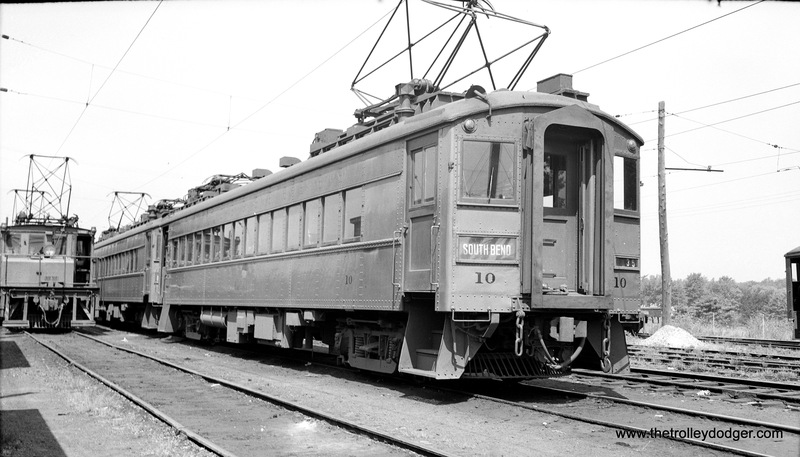 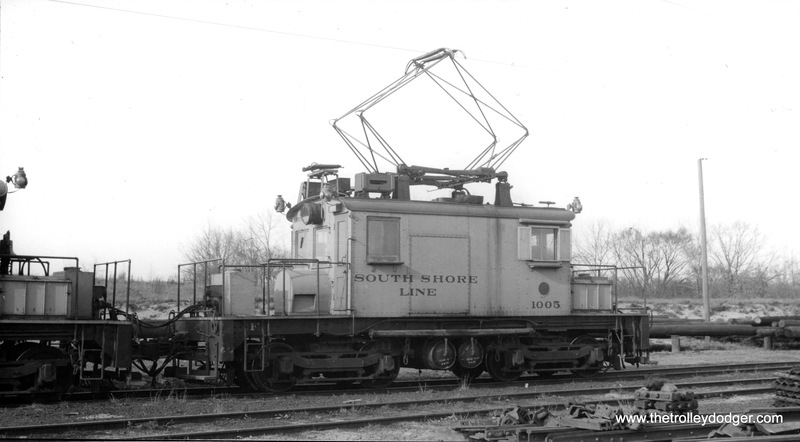 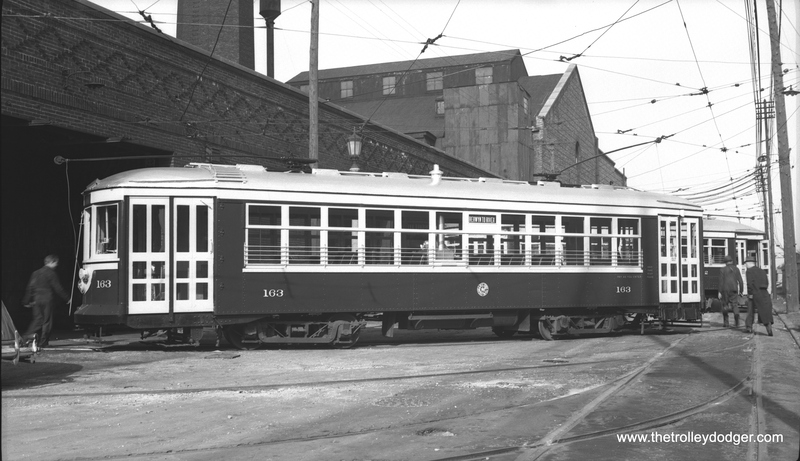 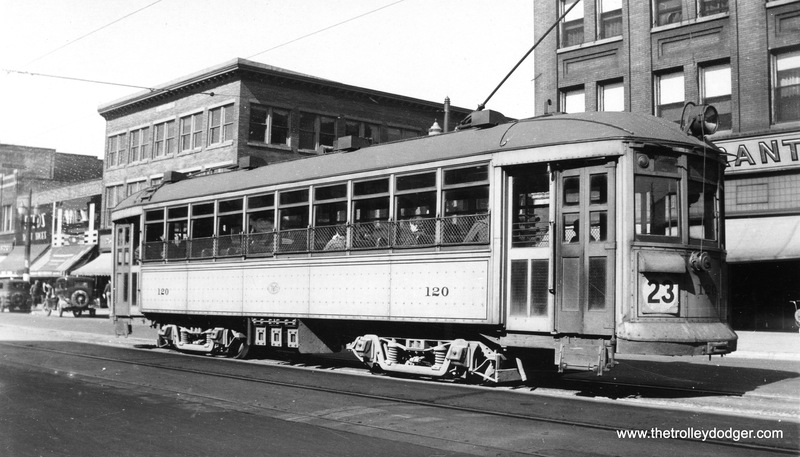 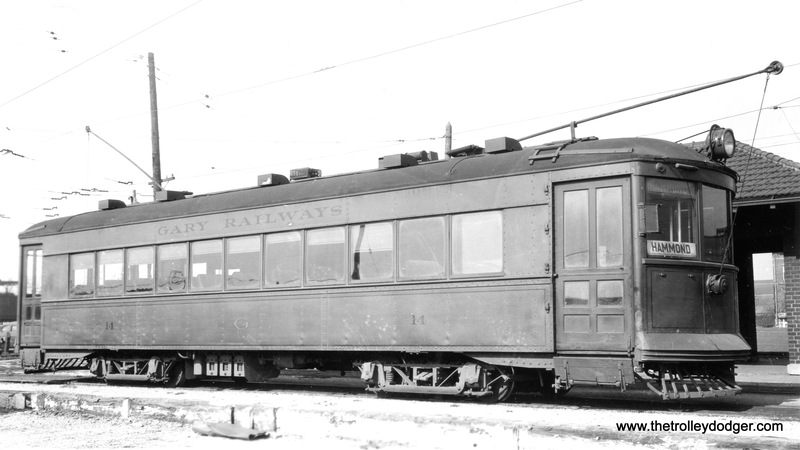 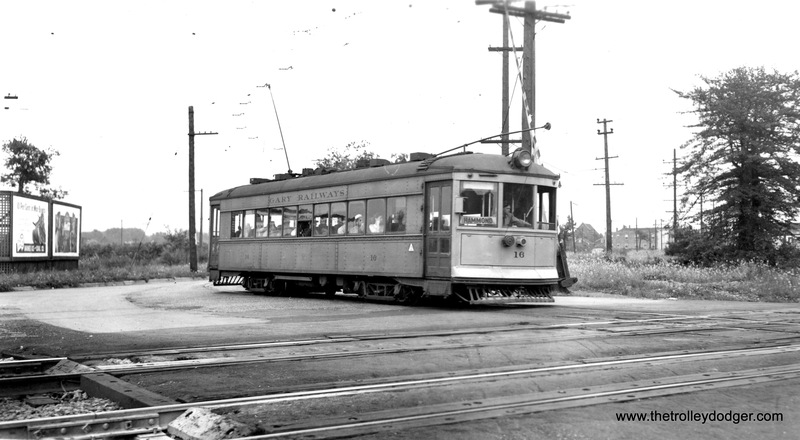 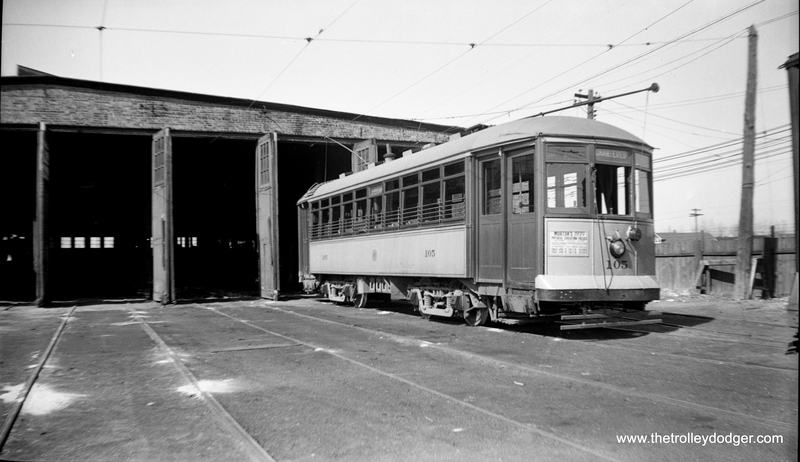 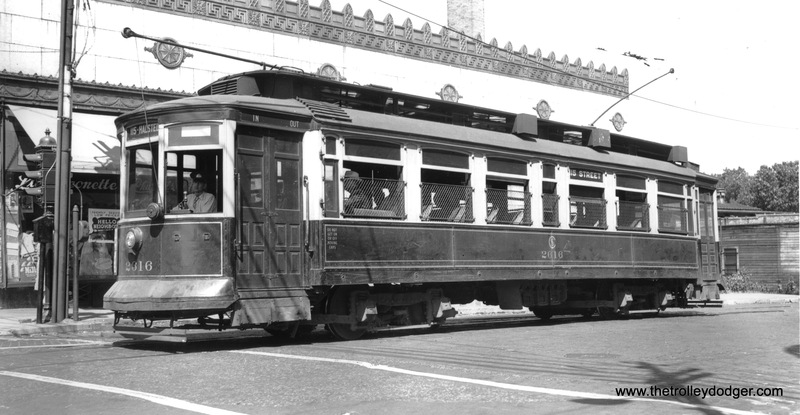 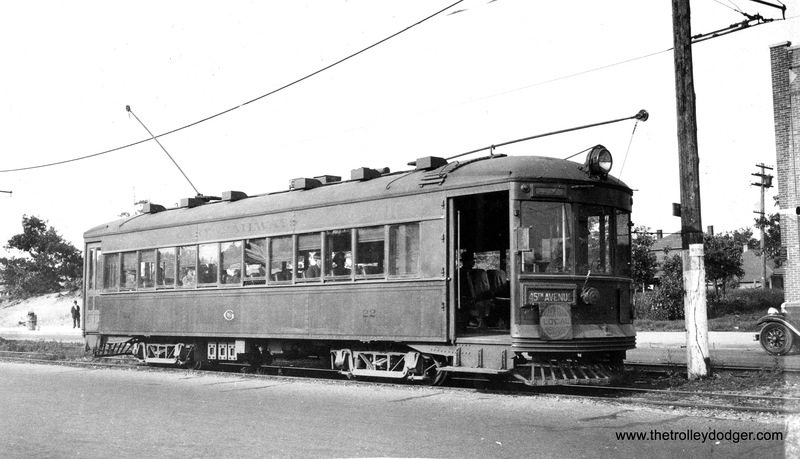 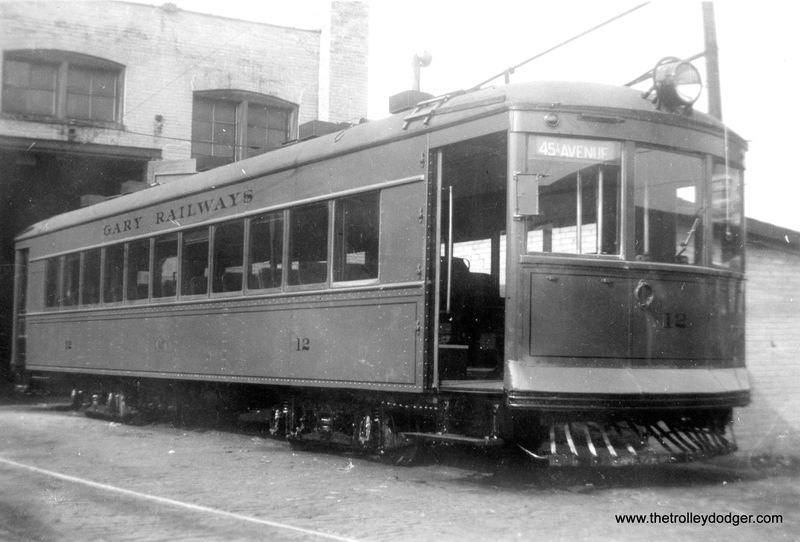 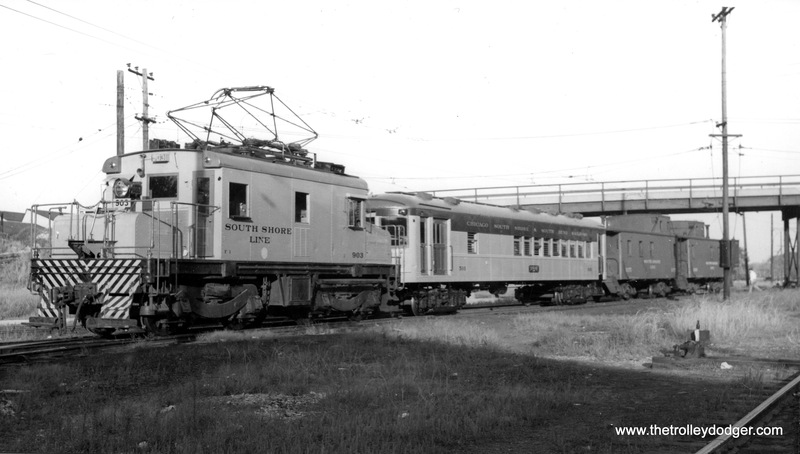 Joe writes: “Car 68 is Lake Shore Electric, not CLS&SB, built by Brill in 1903. 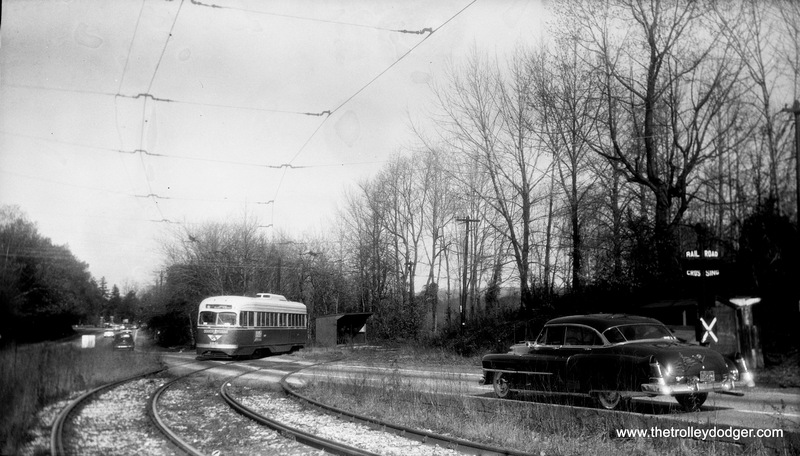 The car behind it is one of the LSE’s Barney & Smith interurban cars.” That clears up the mystery. 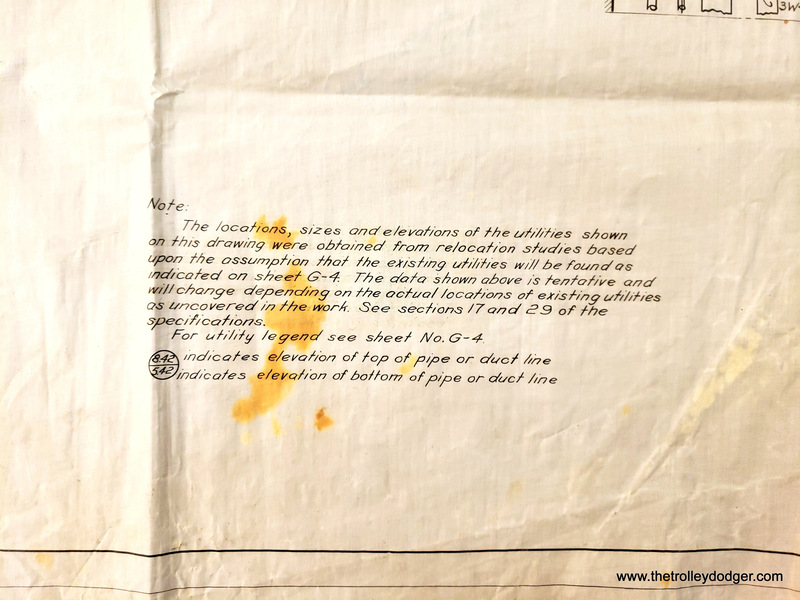 The information that came with this negative was incorrect. 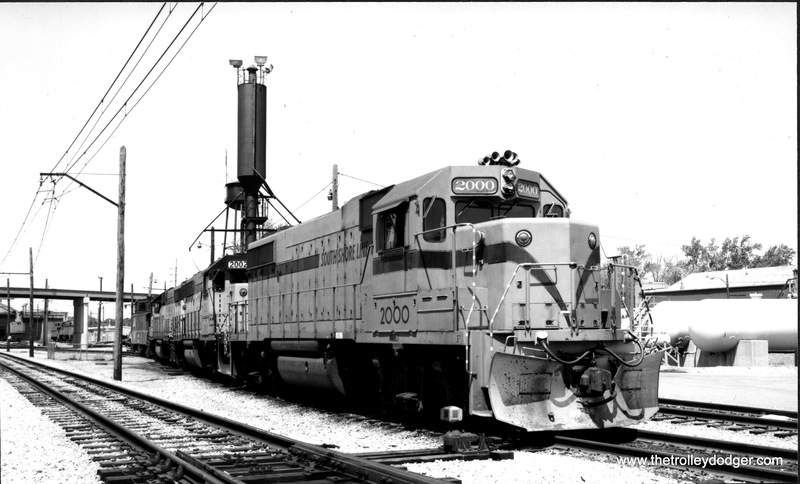 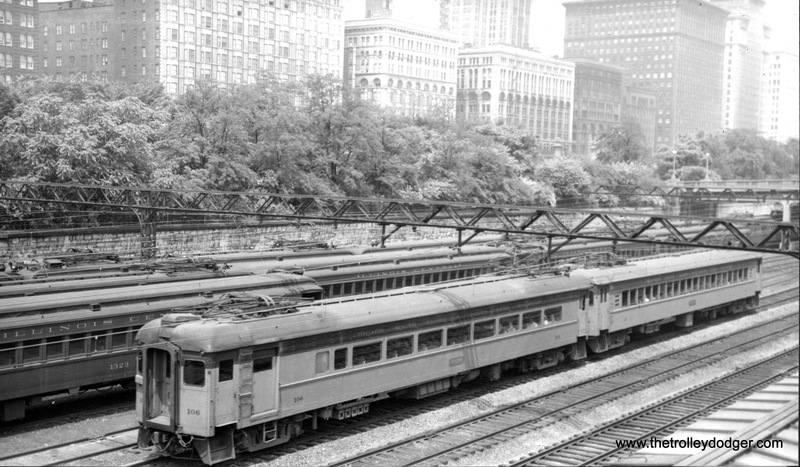 CSS&SB 111 at Randolph Street Terminal in downtown Chicago in May 1953. 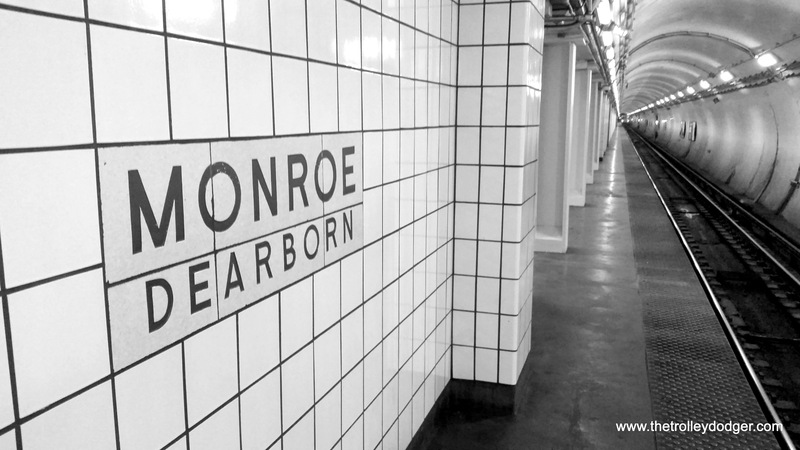 This station has since been rebuilt and is now underneath Millennium Park. 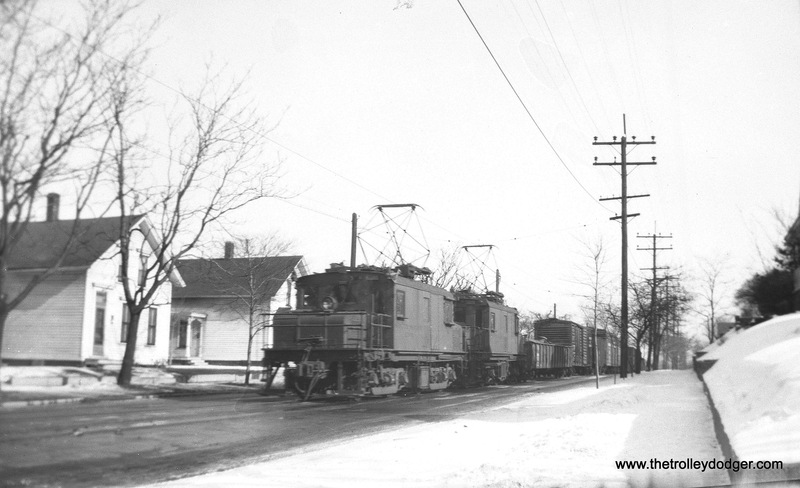 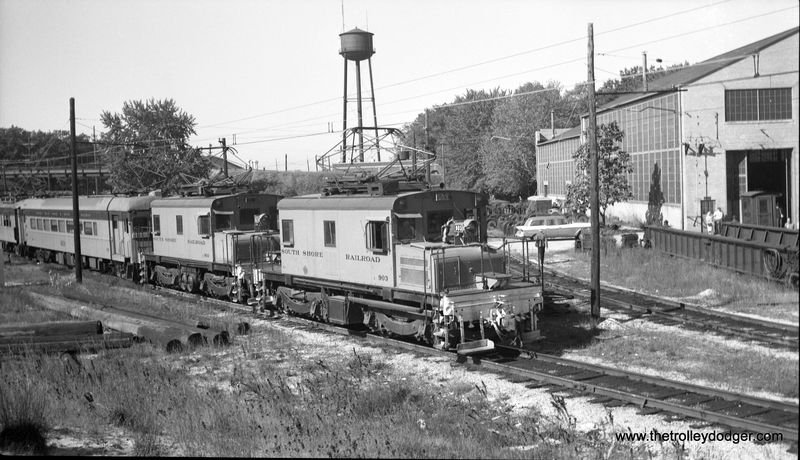 A three-car CSS&SB train, including car 31, makes a photo stop on an early Central Electric Railfans’ Association fantrip near Wilson, Indiana. 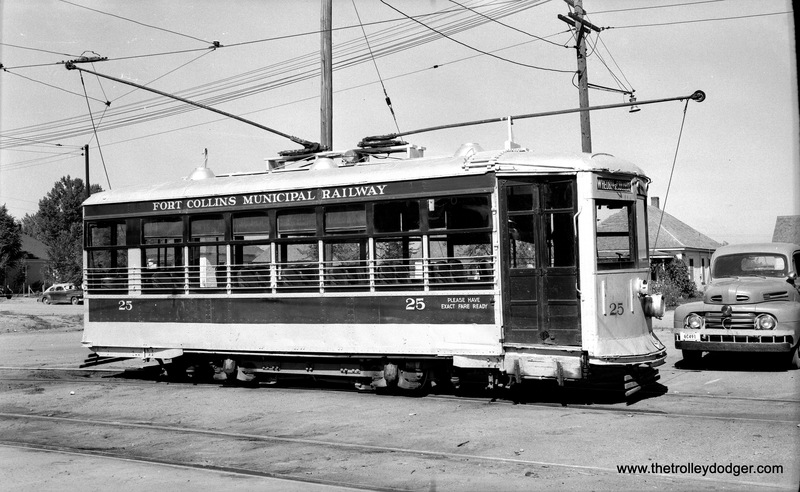 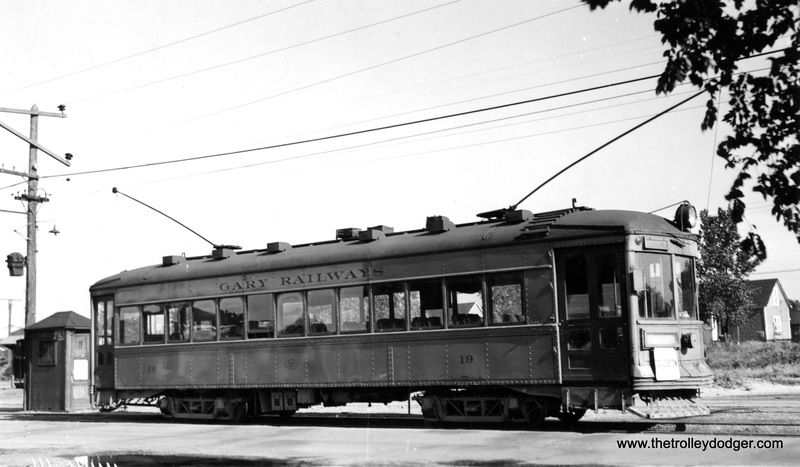 Even the city trolley lines of Gary Railways, operating between 1908 and 1947, had an interurbanish character. 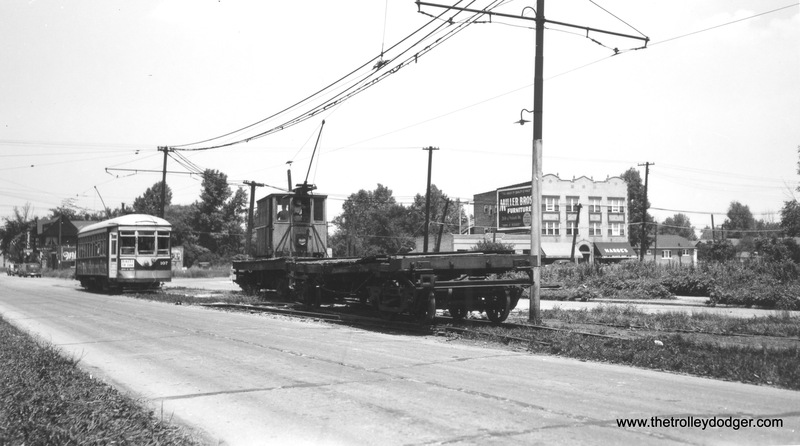 Industrial development in the area meant there were large tracts of land reserved for future use. 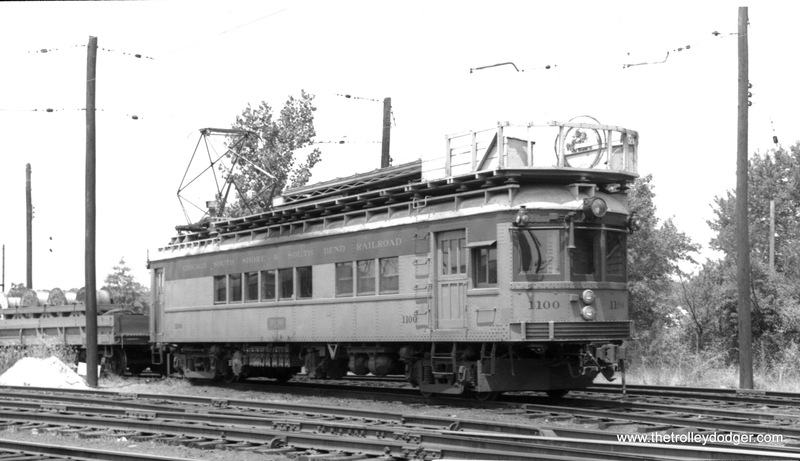 In 1938-39, Central Electric Railfans’ Association (CERA) ran three fantrips on Gary Railways interurbans in their waning days. 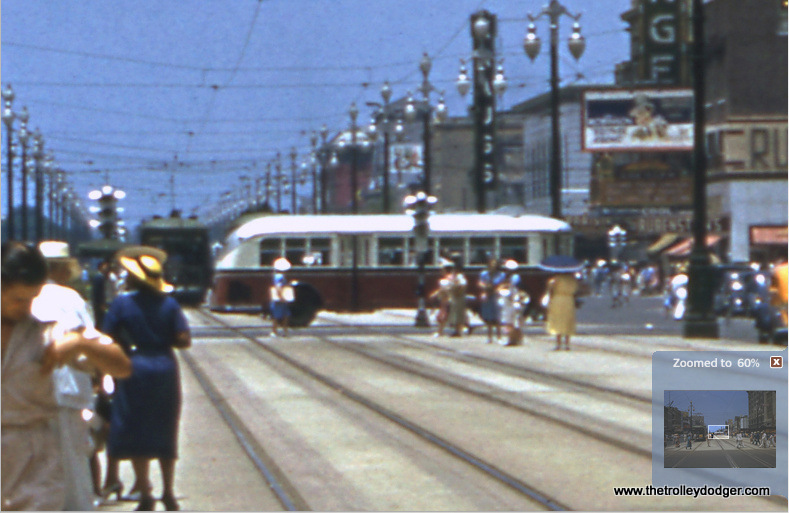 We have run pictures from some of those trips in previous posts. 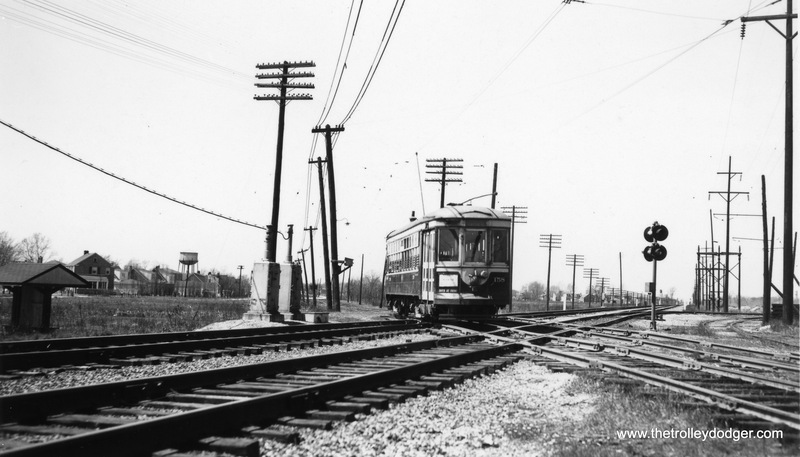 Here is a timeline of transit developments in the Gary area. 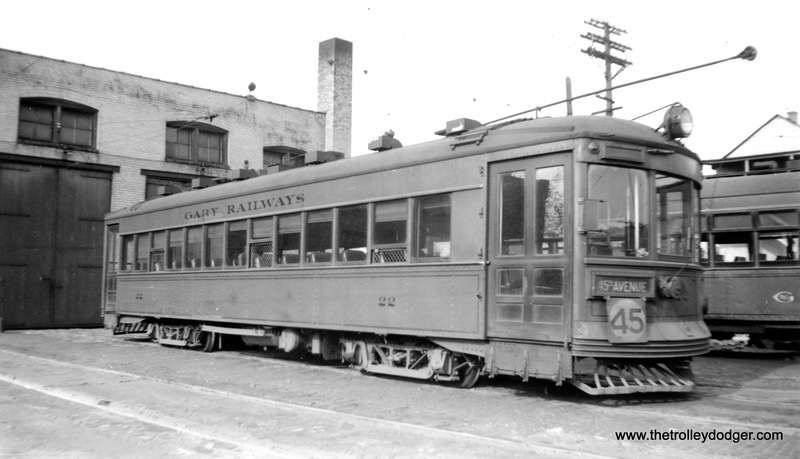 Gary Railways 101. 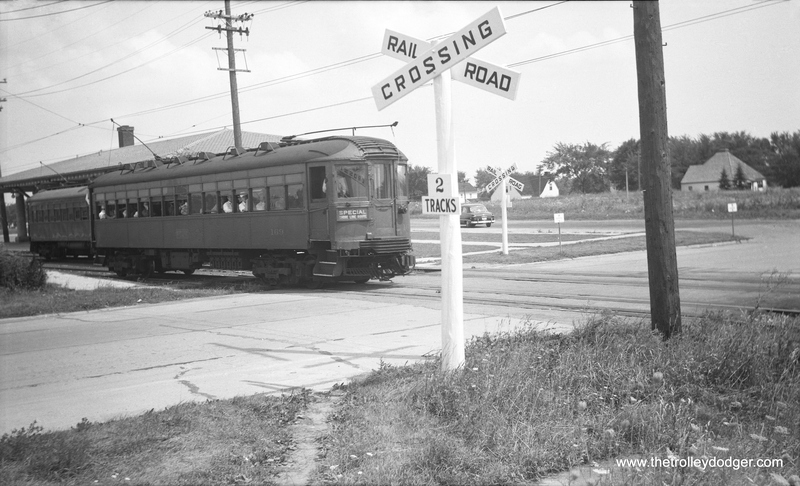 The sign says street railway service in Gary was inaugurated 21 years ago with this car. 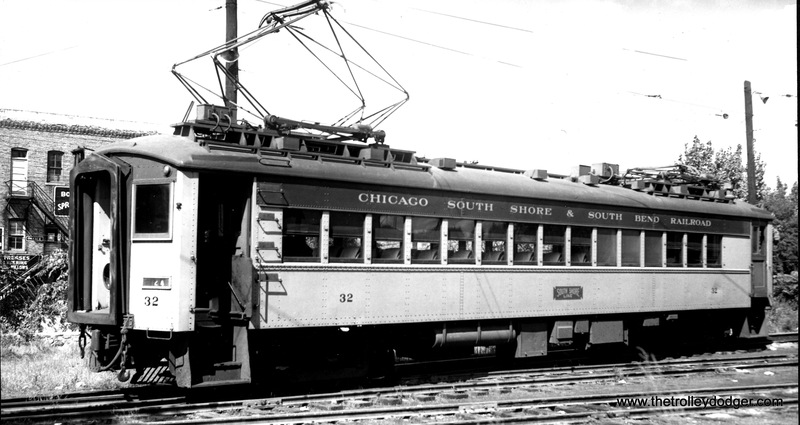 If service began in 1912, that would date this photo to 1933. 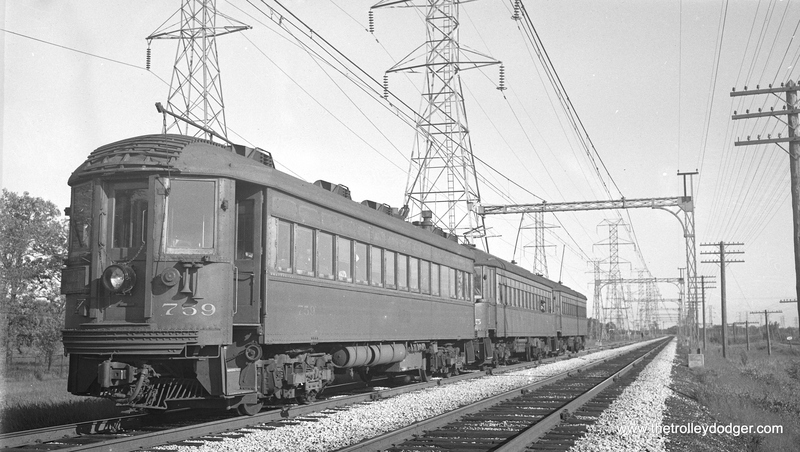 Gary Railways 15 at Kennedy siding on the Hammond line on March 9, 1941. 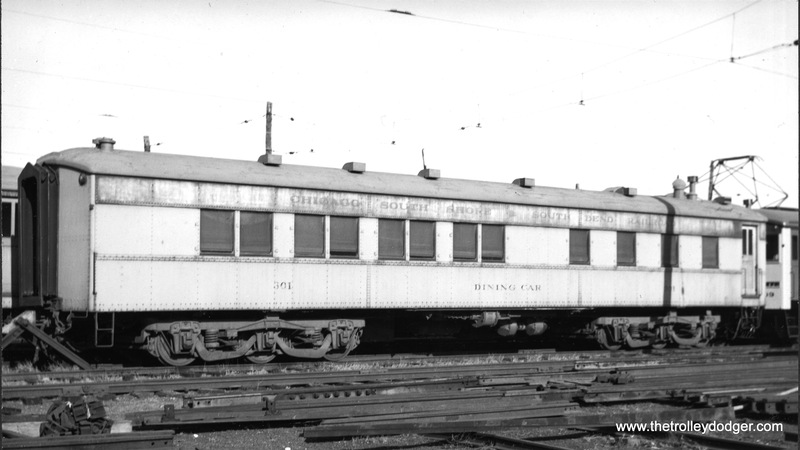 According to the photo information, this car was built by Cummings in 1926. 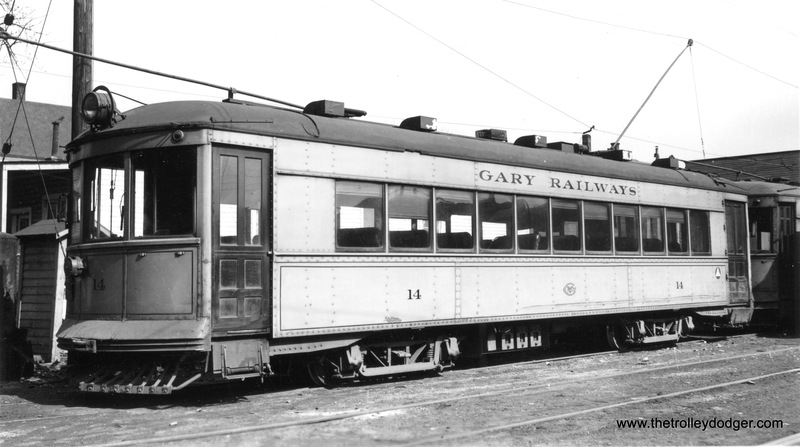 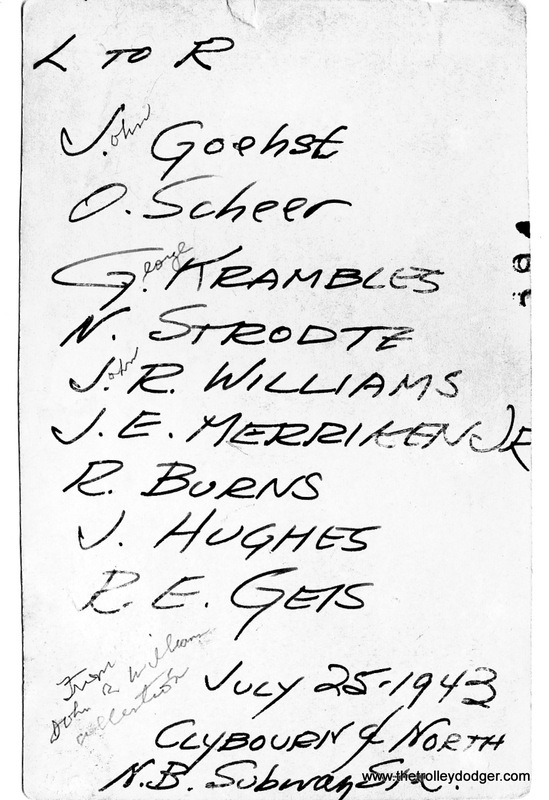 Gary Railways 16, signed for Hammond. 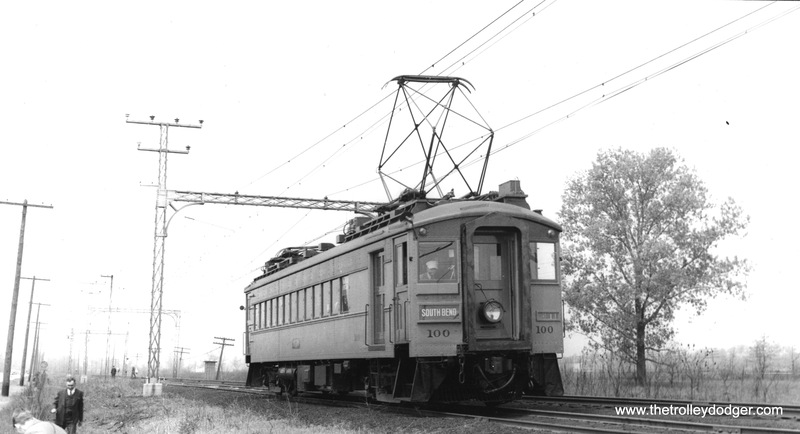 Gary Railways 14, at a loop on the Hammond line, on October 27, 1940. 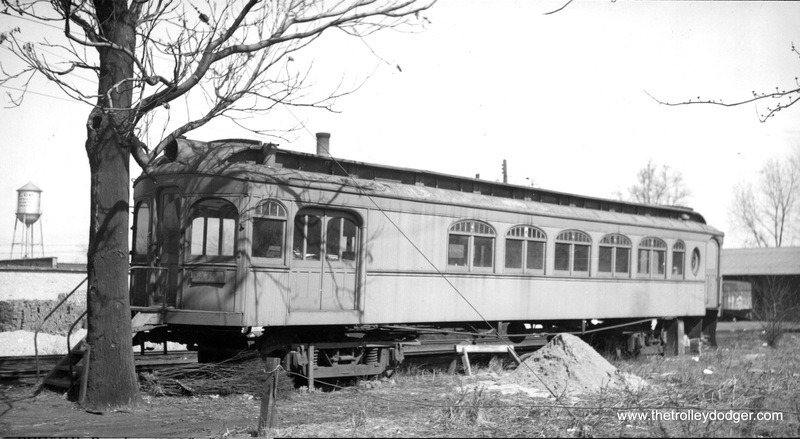 According to the photo information, it was built by Cummings in 1926. 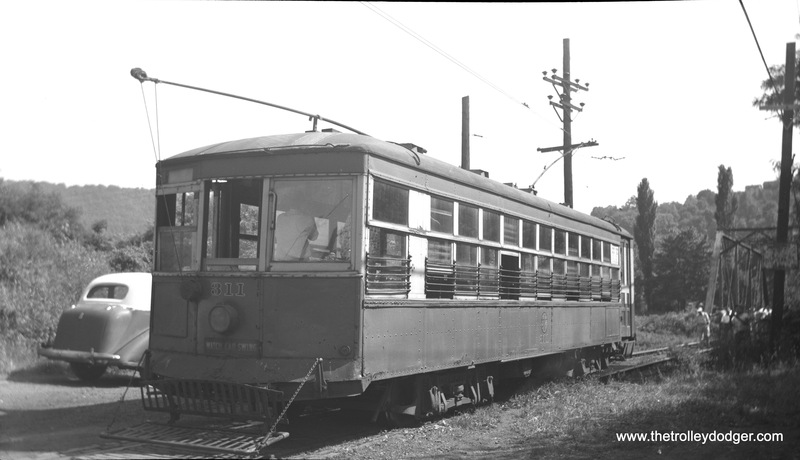 Gary Railways 19 at Tolleston, with both poles up. 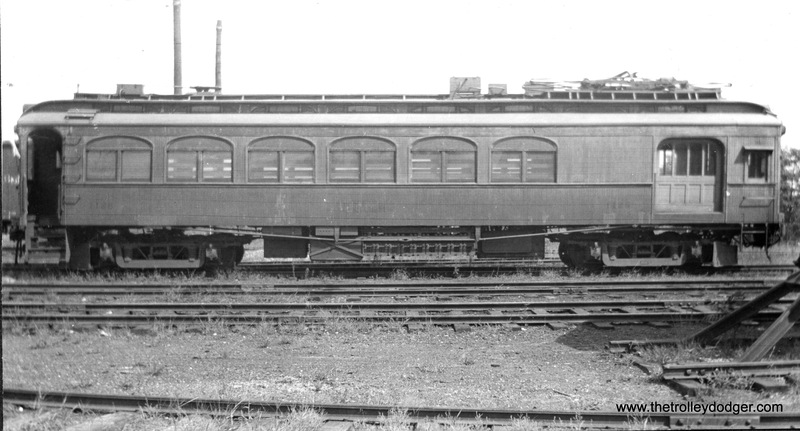 This lightweight safety car was built by Cummings Car & Coach in 1927. 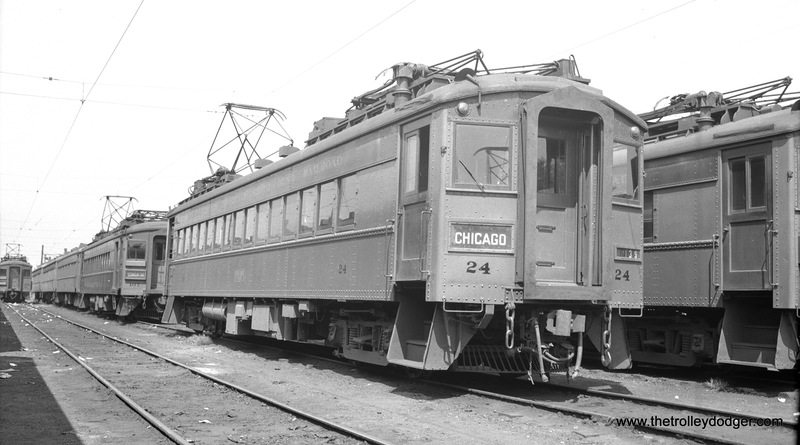 This car body, sole survivor of the fleet, is now at the Illinois Railway Museum. 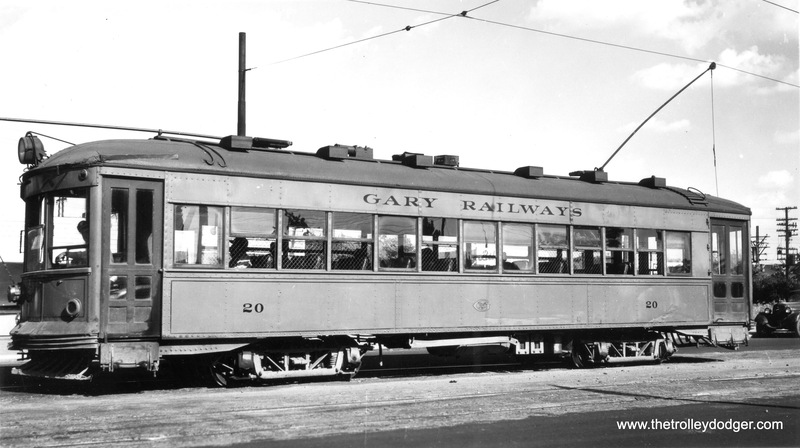 Gary Railways 20 on July 21, 1946. 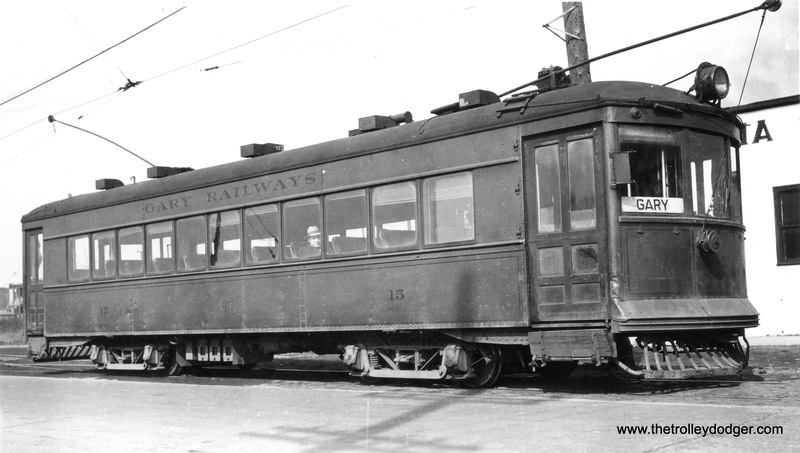 Gary Railways car 19, the only car preserved, on a Central Electric Railfans’ Association fantrip. 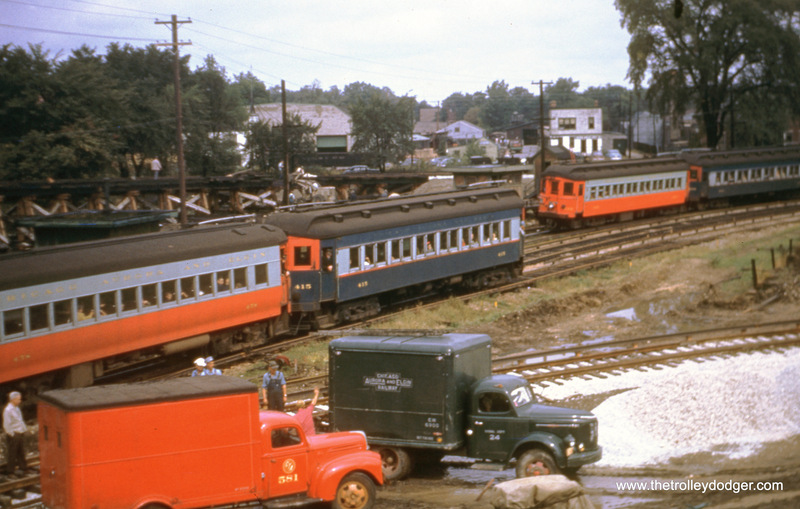 This matches a picture we previously published in our previous post More Hoosier Traction (September 2, 2015). 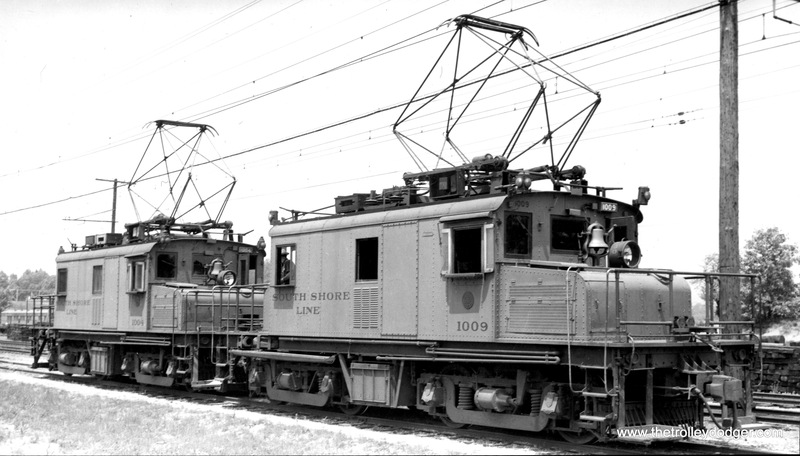 Bill Shapotkin said that other picture was taken “taken on March 19, 1939 — the day AFTER the last day of service on the Indiana Harbor (and Hobart) lines.” The difference in tonality between the two pictures may simply be the difference between panchromatic and orthochromatic film. 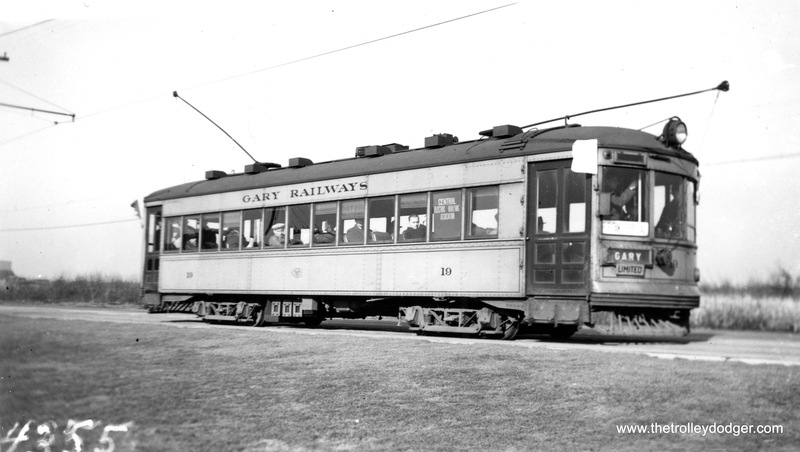 Gary Railways 9 at Hobart, Indiana in 1934. 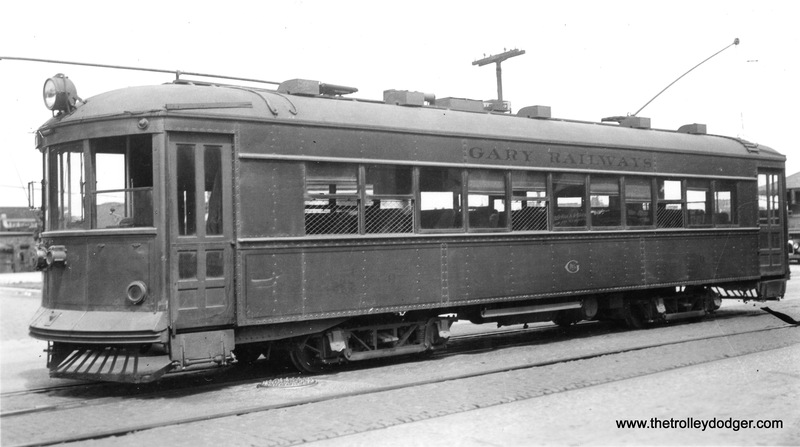 Gary Railways cars 12 and 9. 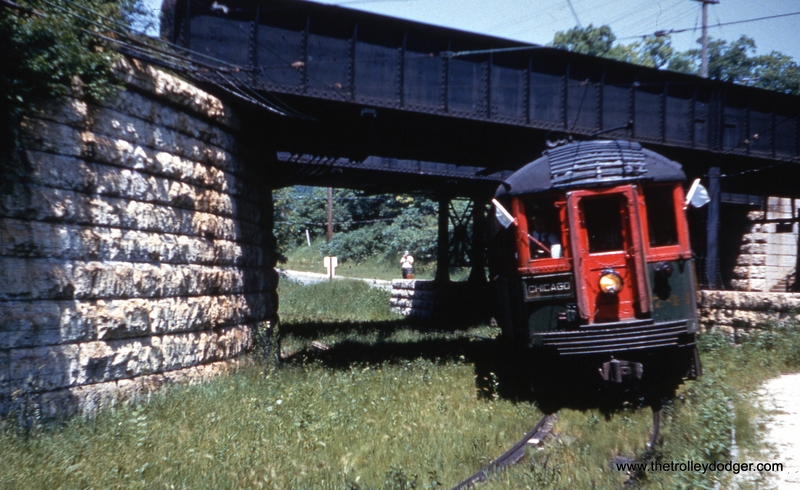 Gary Railways 17 at the North Broadway loop. 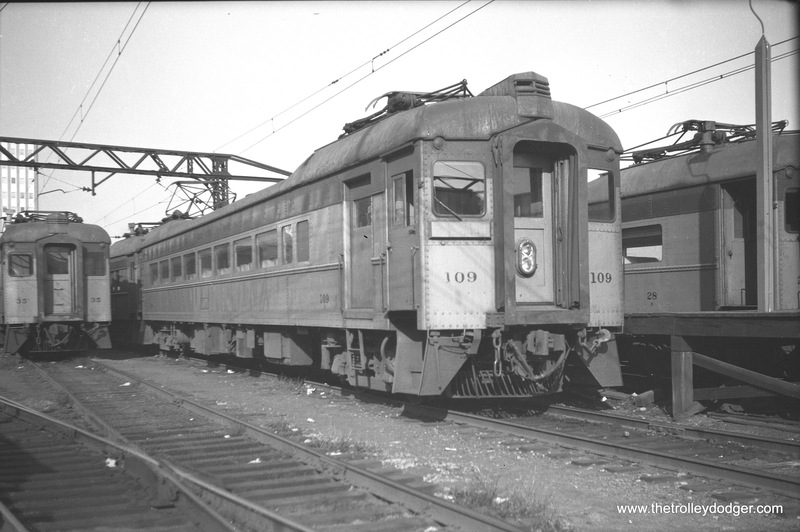 Johnston Traction 311, a double-truck Birney car (ex-Bangor, Maine) on June 24, 1956. 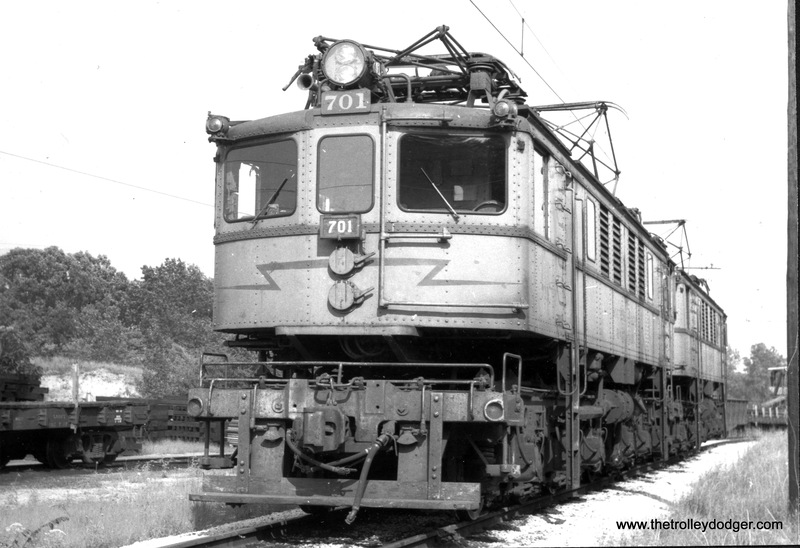 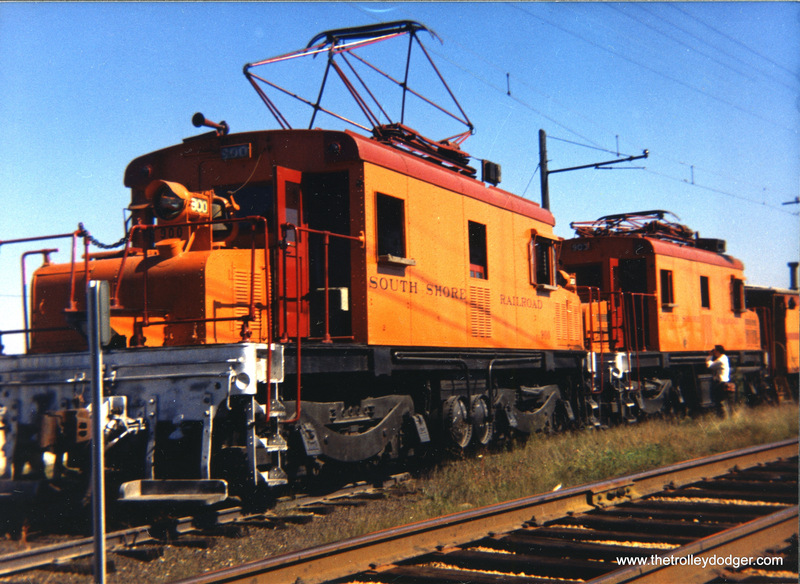 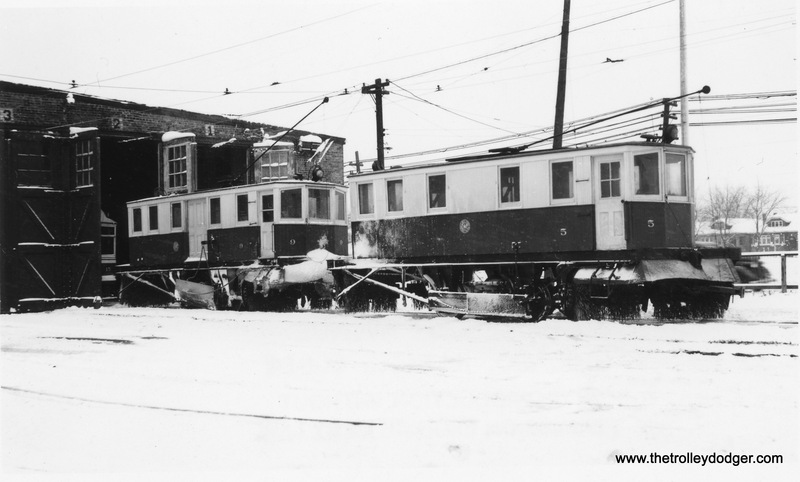 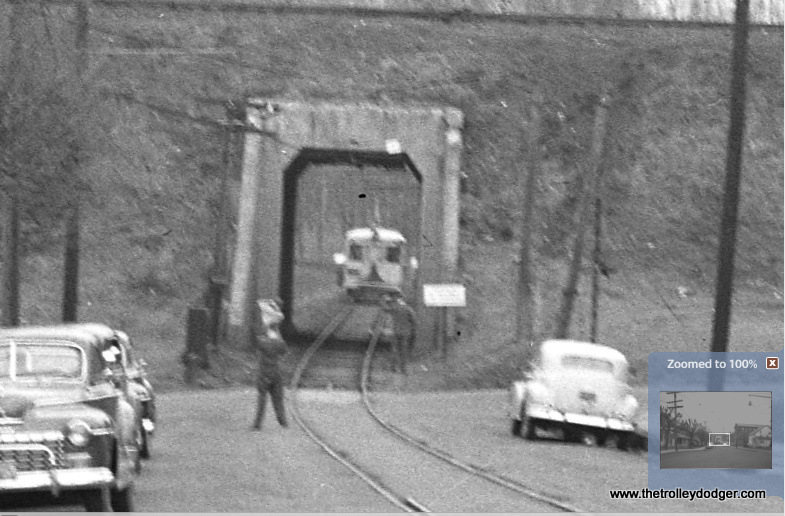 Don’s Rail Photos: ” 307 thru 311 came from Bangor Hydro Electric in 1941 where they were 10, 12, 14, 16, and 18. 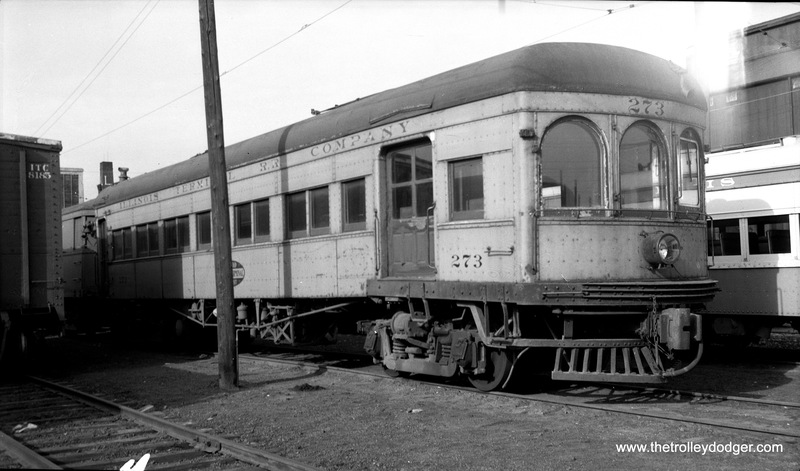 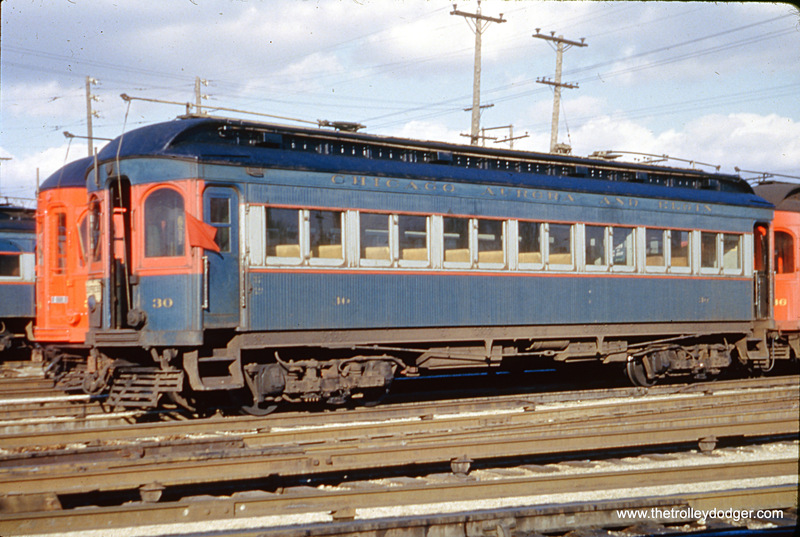 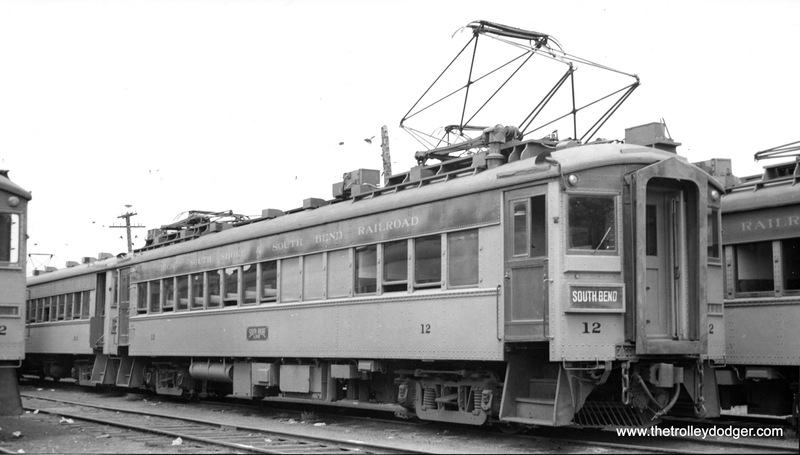 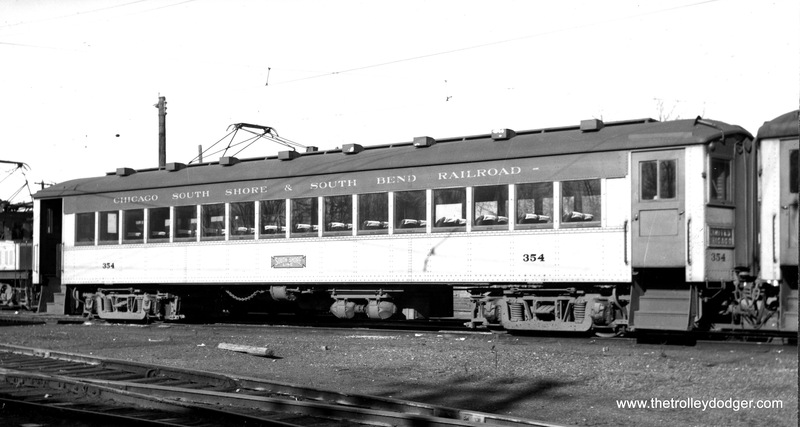 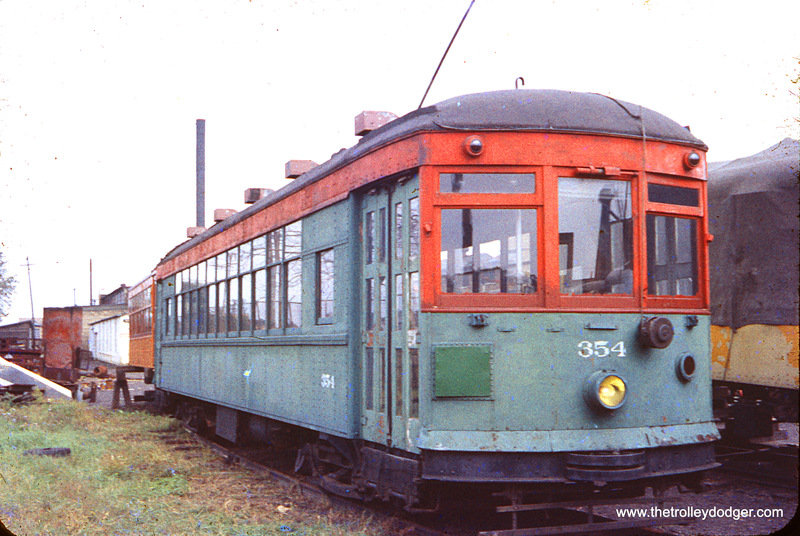 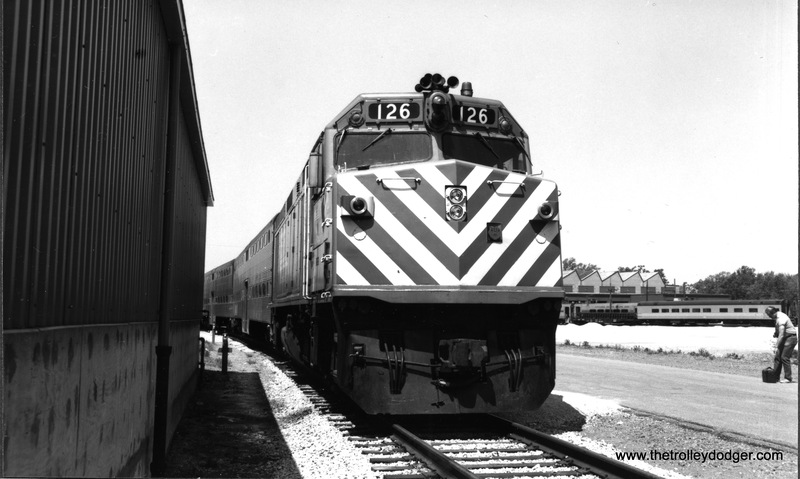 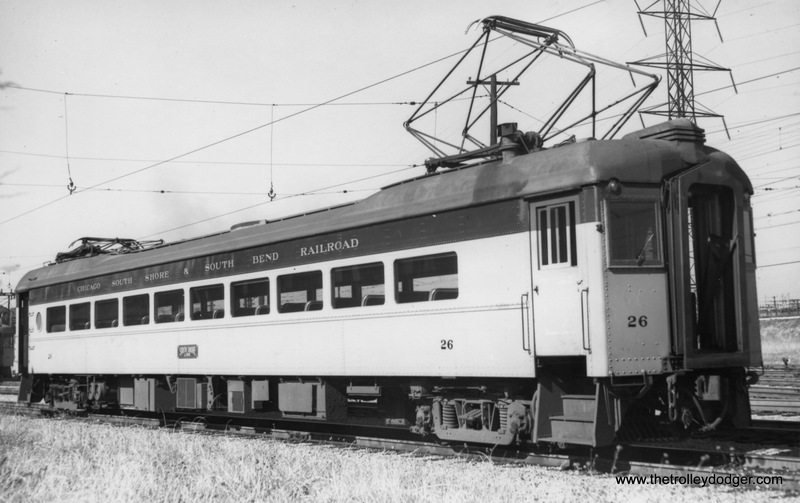 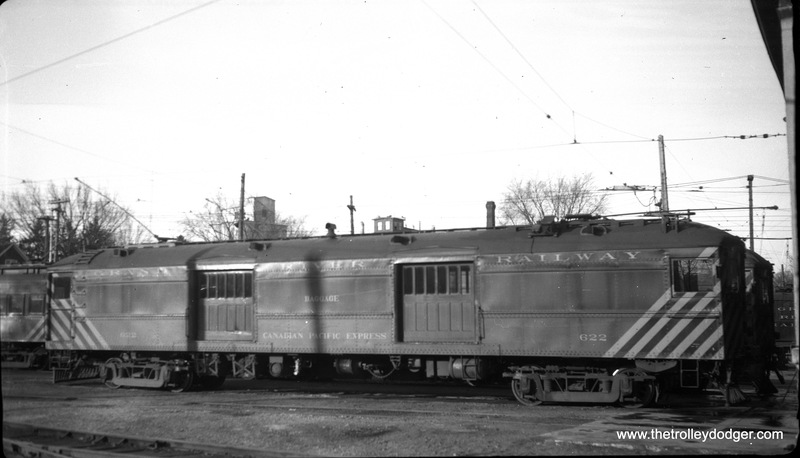 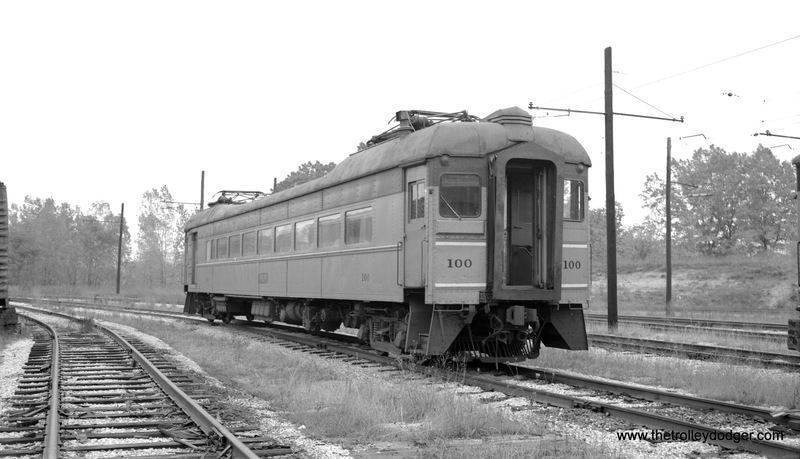 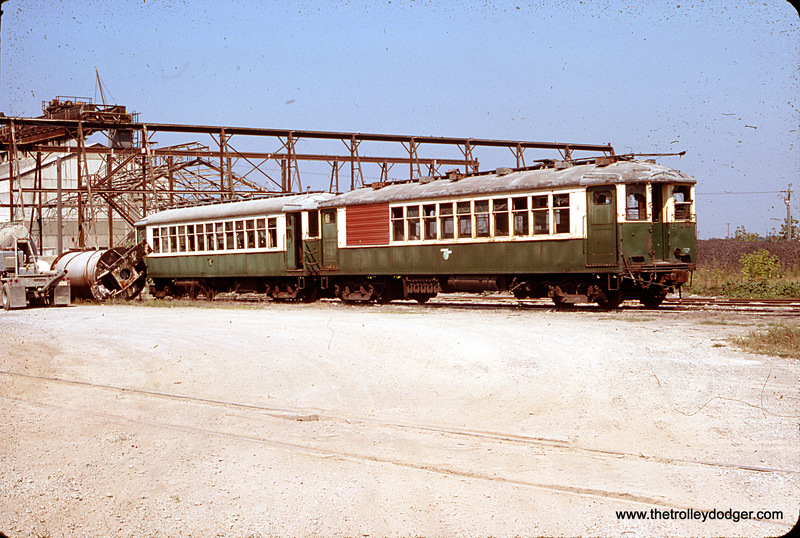 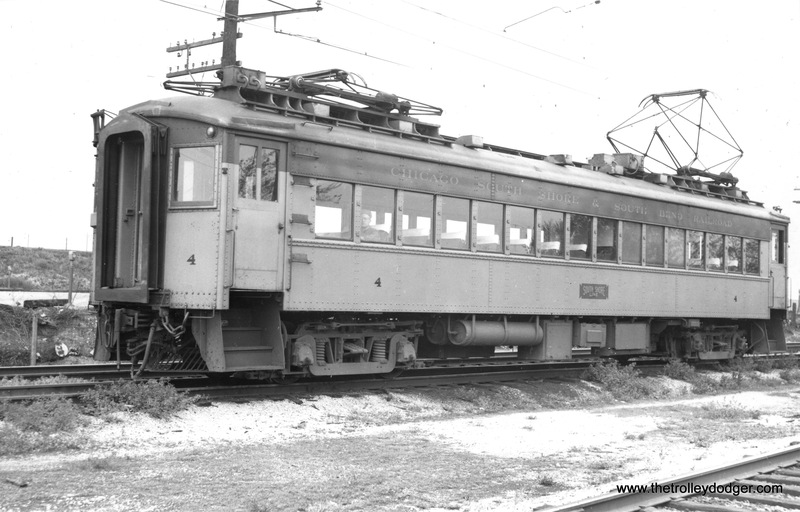 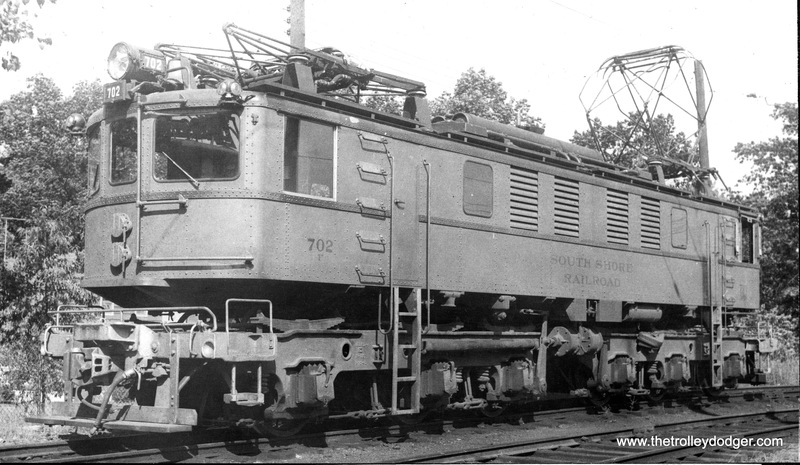 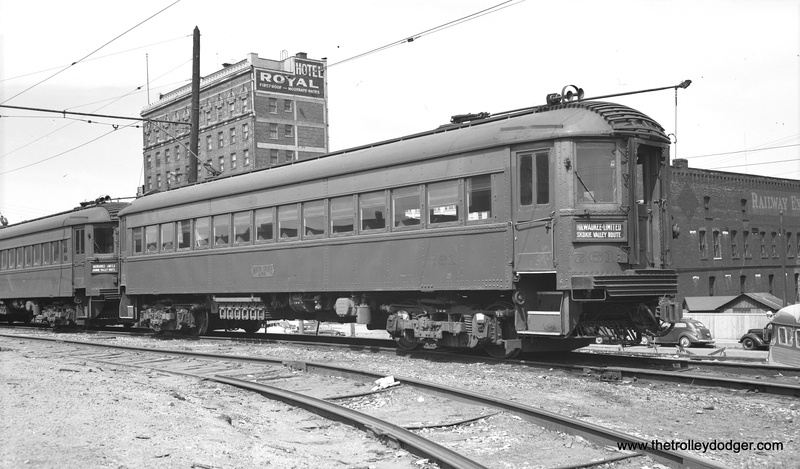 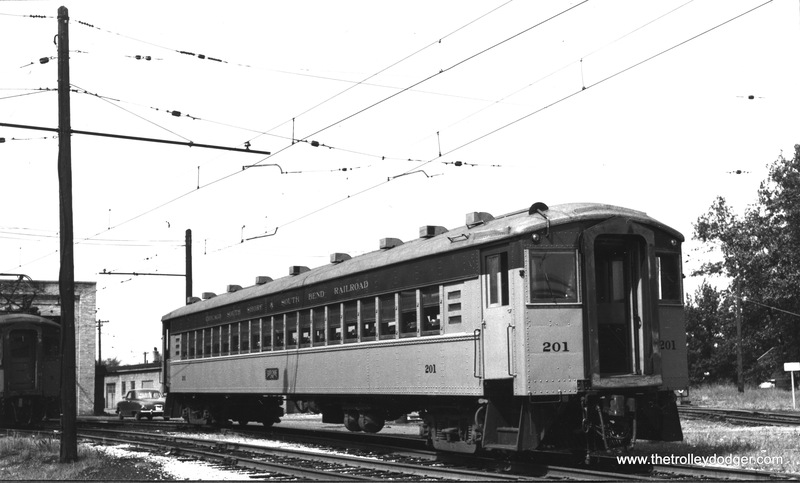 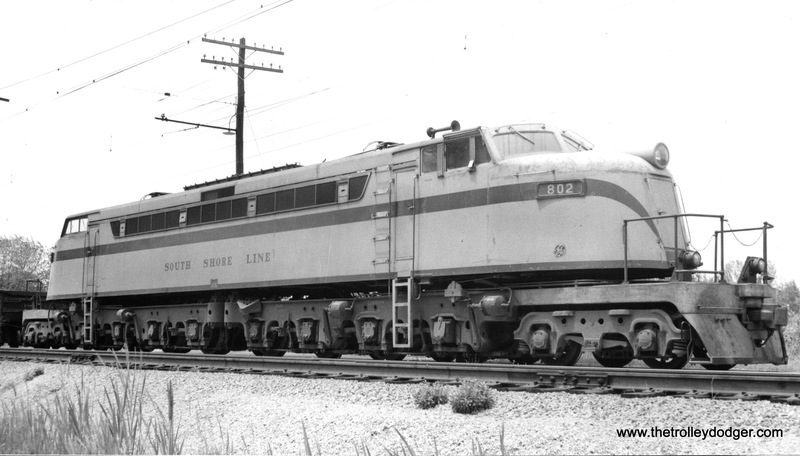 They were scrapped in 1957 except for 311 which was preserved at Rockhill Trolley Museum which acquired it in 1960.” Audio recordings of car 311 in service in Johnstown are included on Railroad Record Club LP #23. 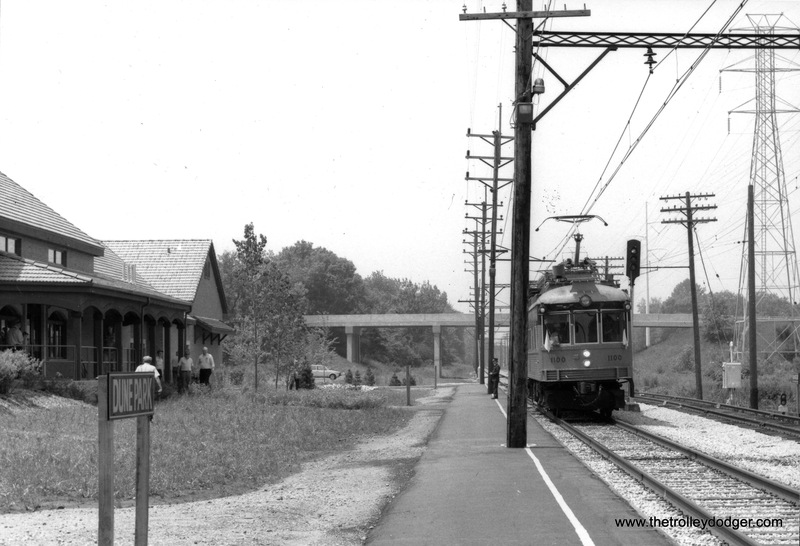 The former LVT station in Perkasie is now the headquarters for the local historical society. 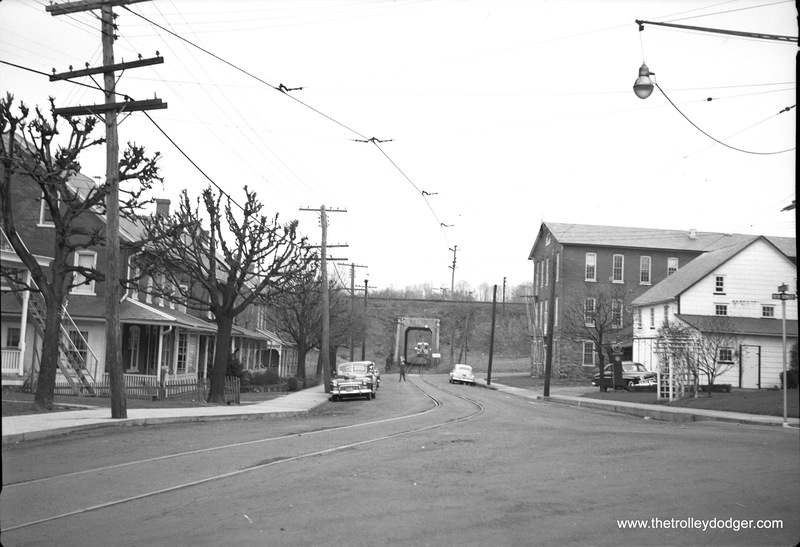 The former LVT underpass in Perkasie today. 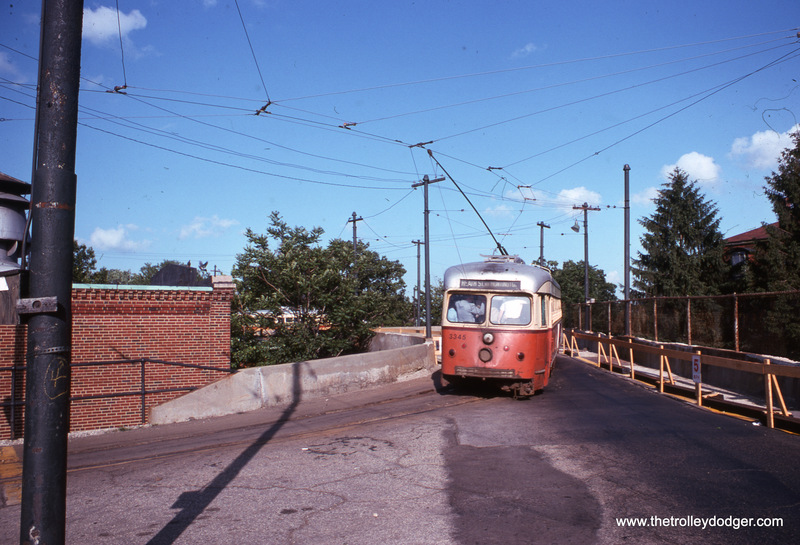 The ramp you see is at Norristown, and shows how Lehigh Valley Transit interurban cars descended to street level to continue north to Allentown. 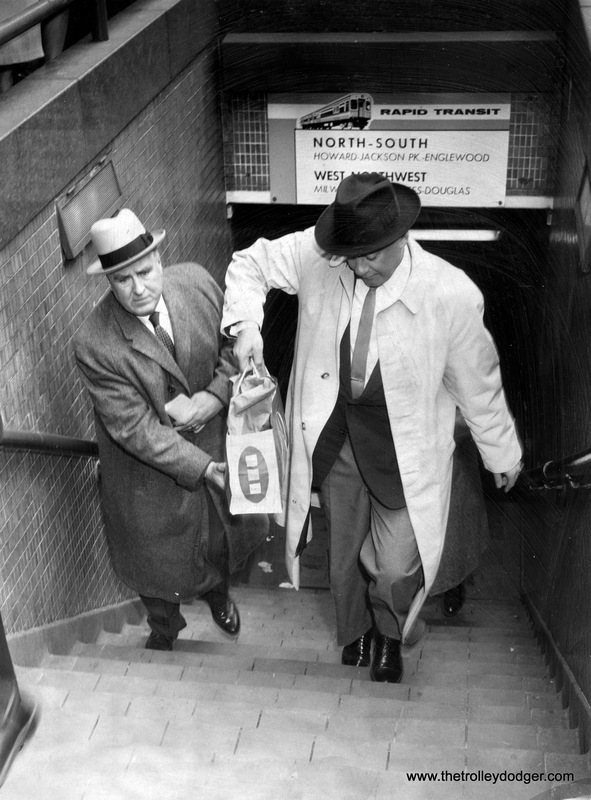 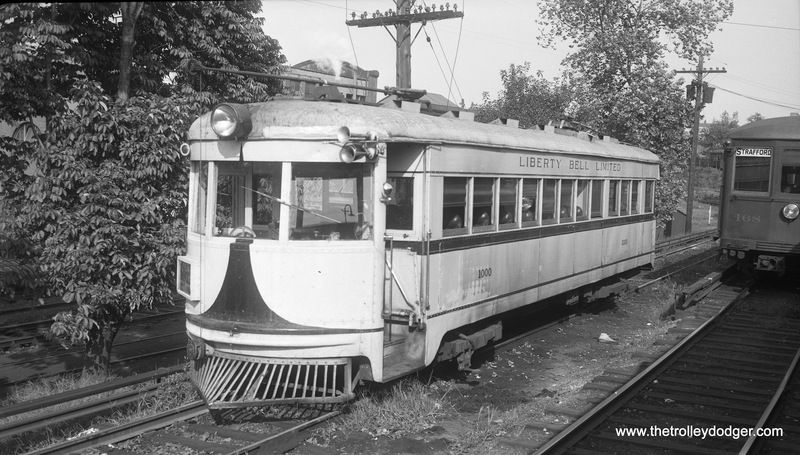 Service on the Liberty Bell Limited ended in September 1951. 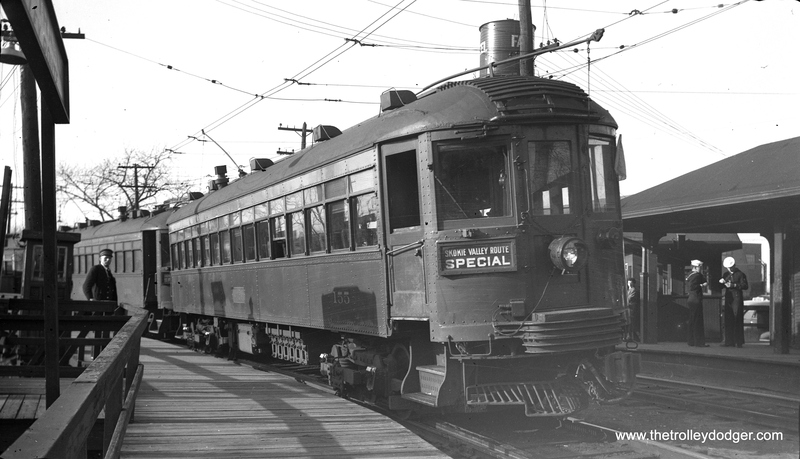 Service between Philadelphia and Norristown, started by the Philadelphia & Western, continues today under SEPTA. 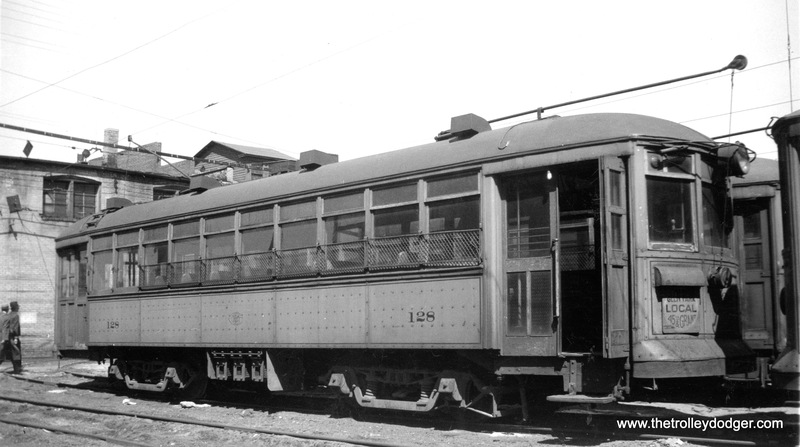 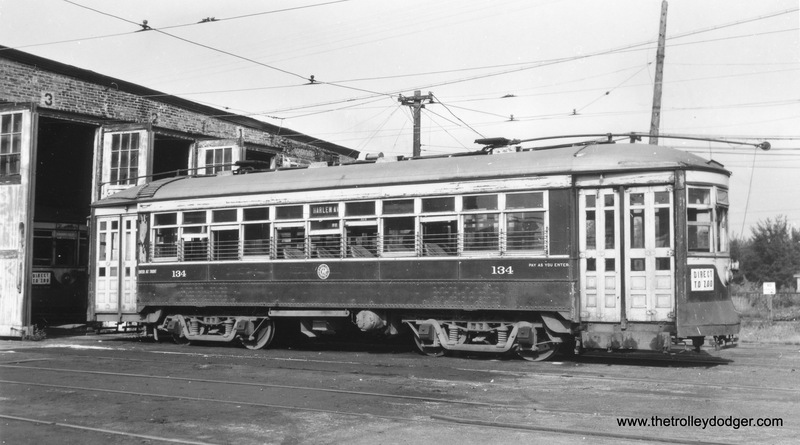 Philadelphia Suburban Transportation car 84, a 1932 Brill “Master Unit,” on the West Chester line. 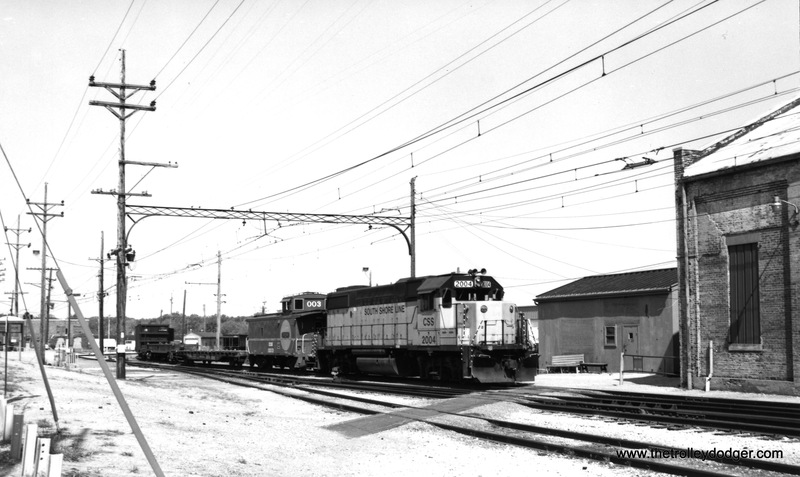 This long line was mainly single-track with occasional passing siidngs such as this one. 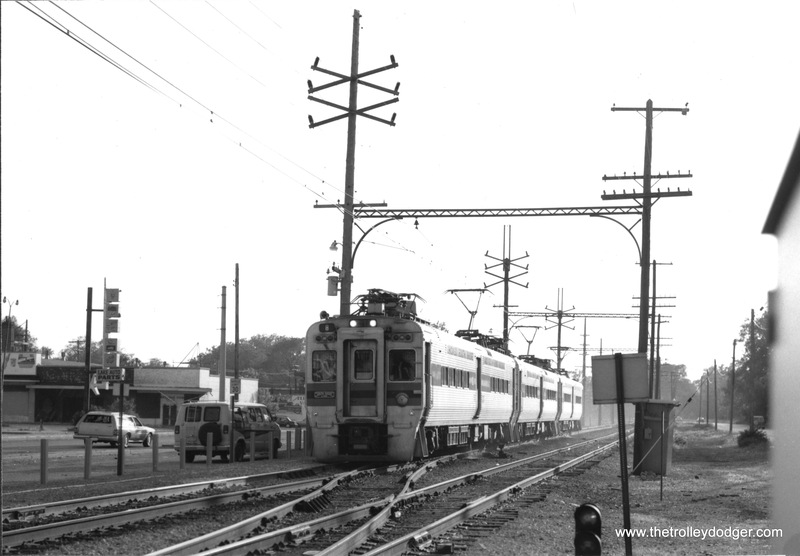 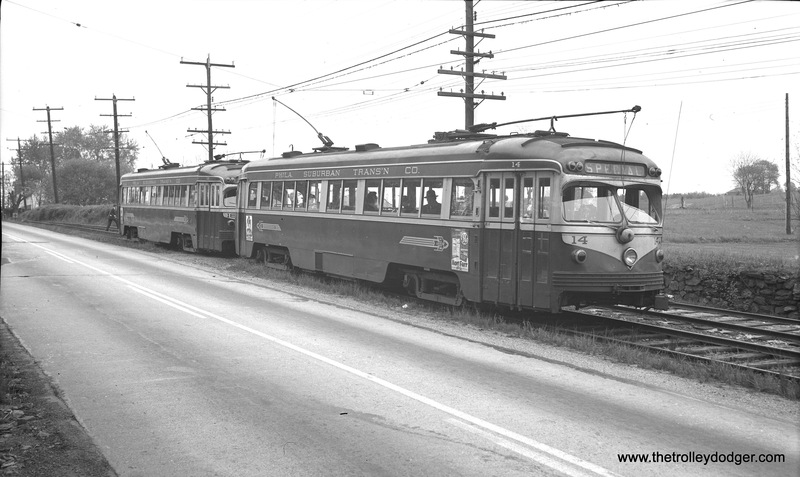 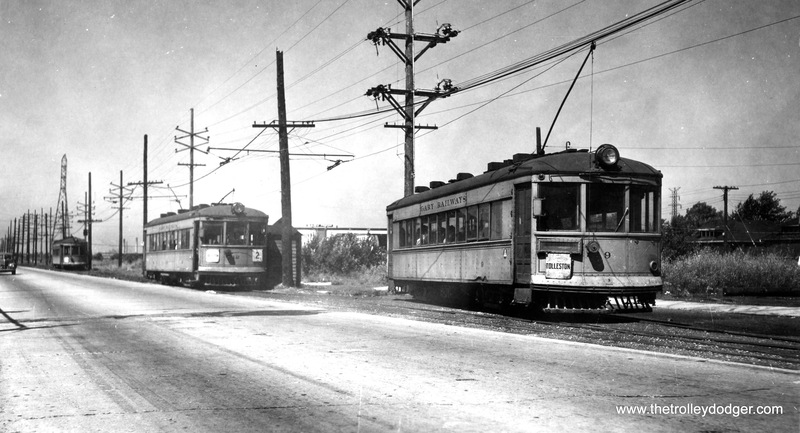 Philadelphia Suburban double-end cars 14 and 18 on West Chester Pike, April 25, 1954. 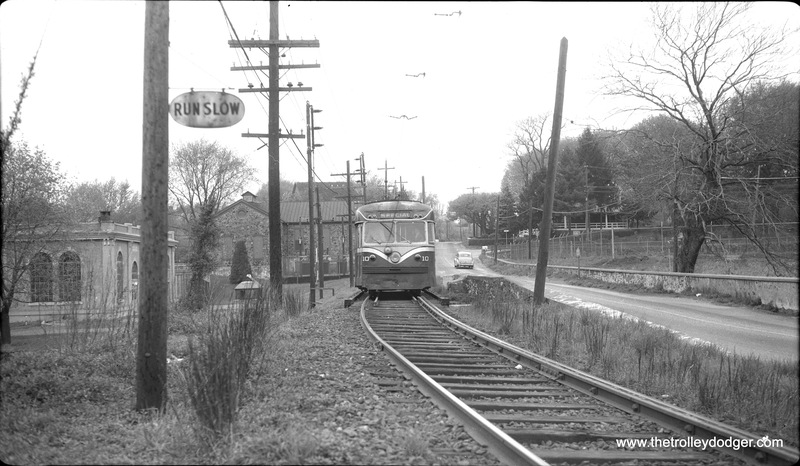 Buses replaced trolley cars in June so that West Chester Pike could be widened. 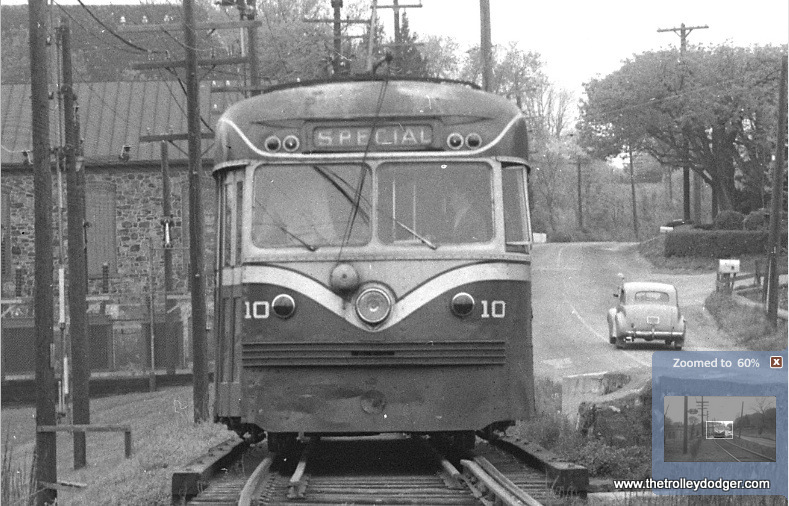 Brilliner 10 is on side-of-the-road trackage on the Philadelphia Suburban’s West Chester line, which was bustituted in 1954. 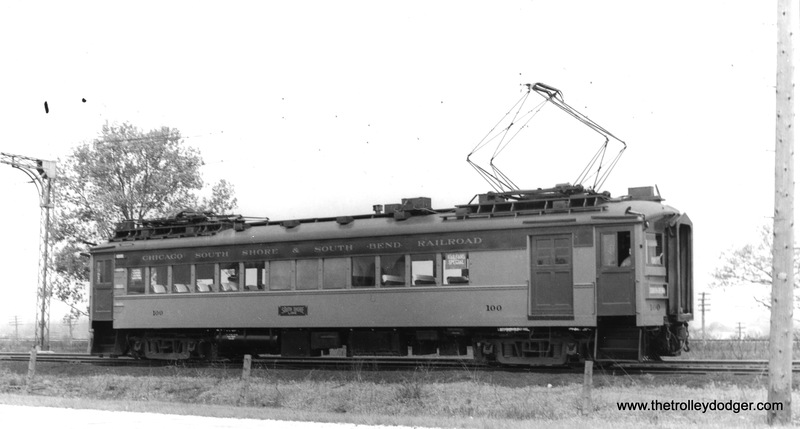 A close-up of the previous photo. 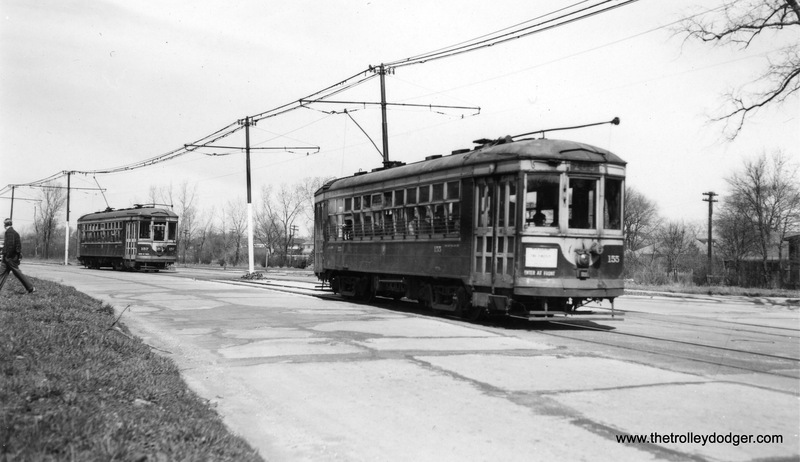 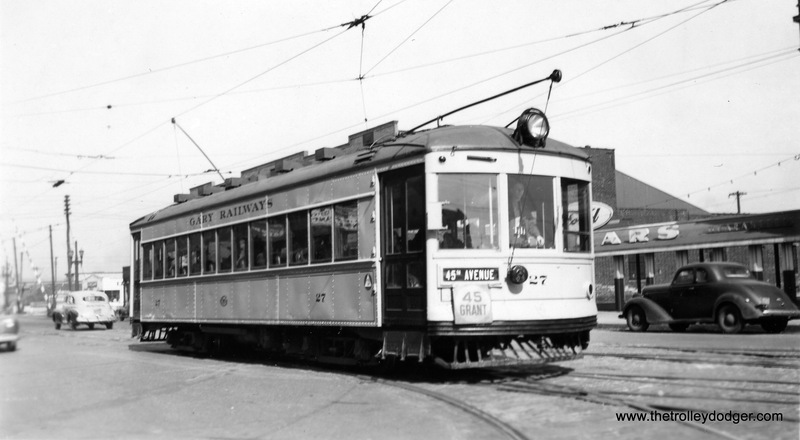 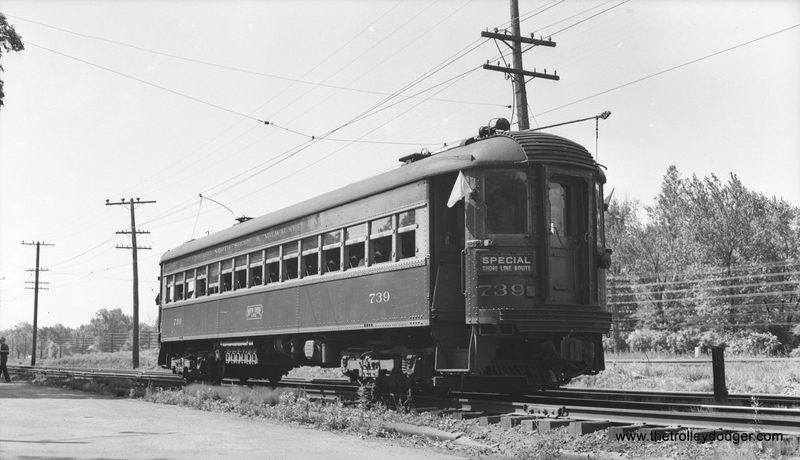 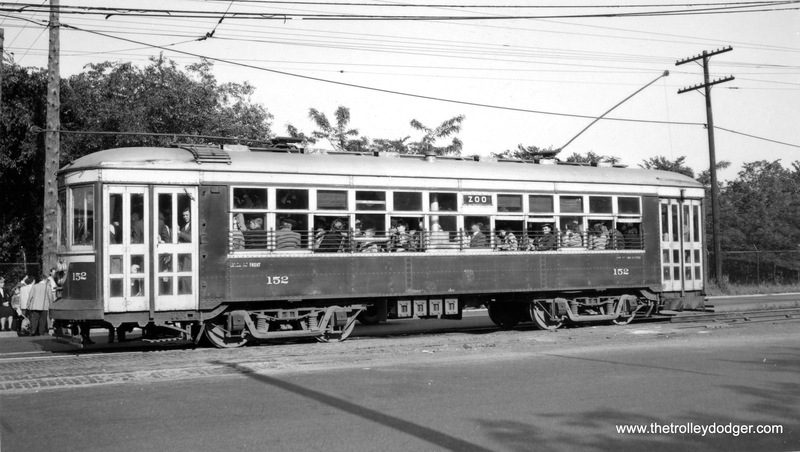 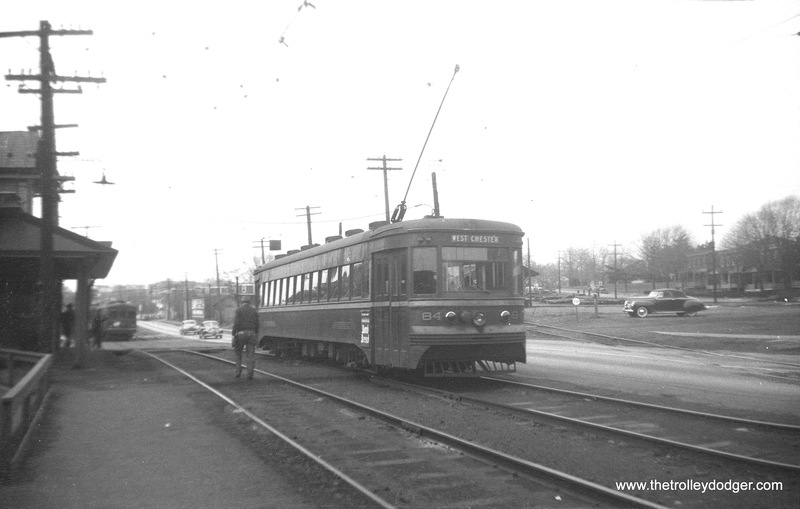 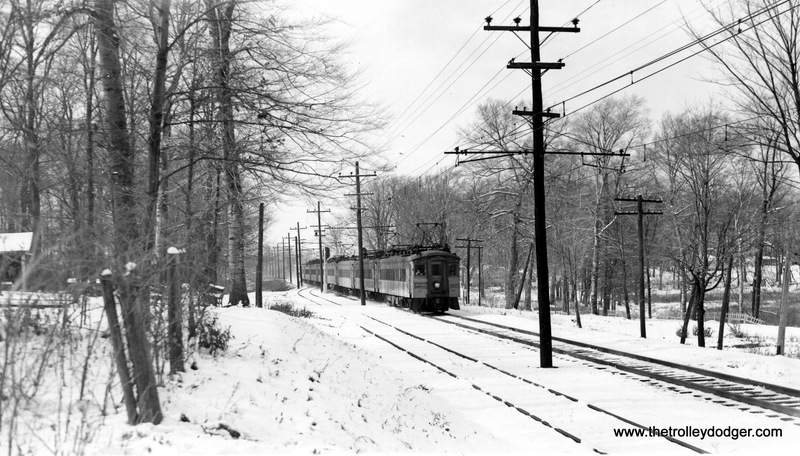 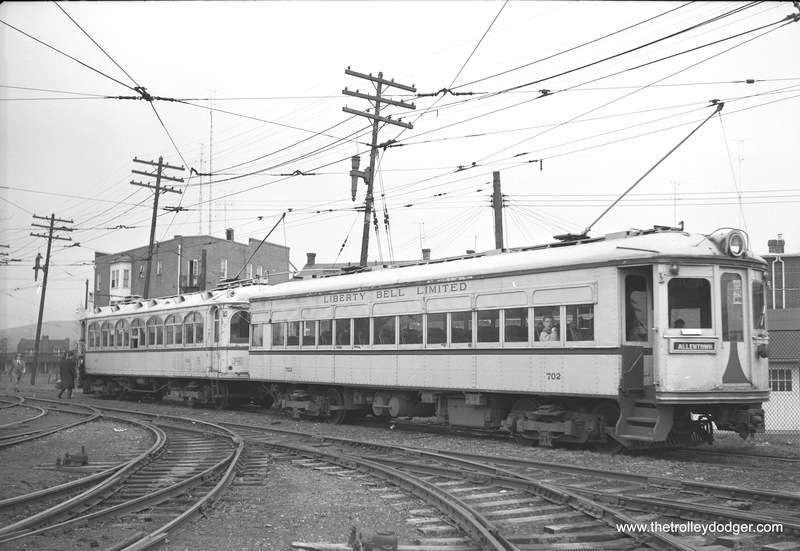 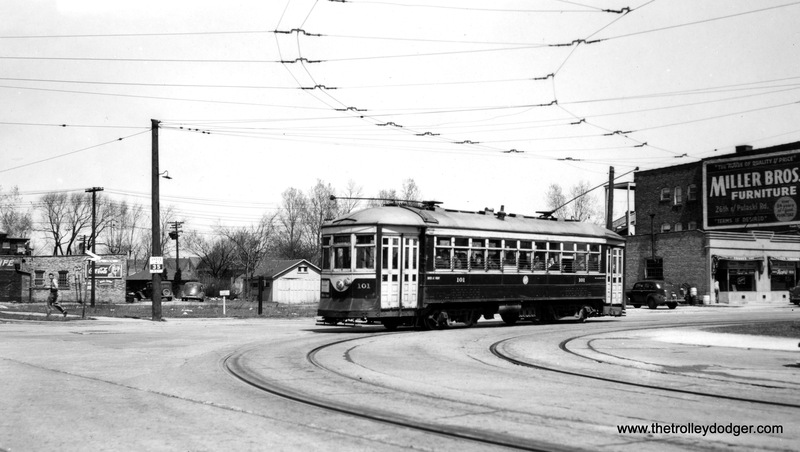 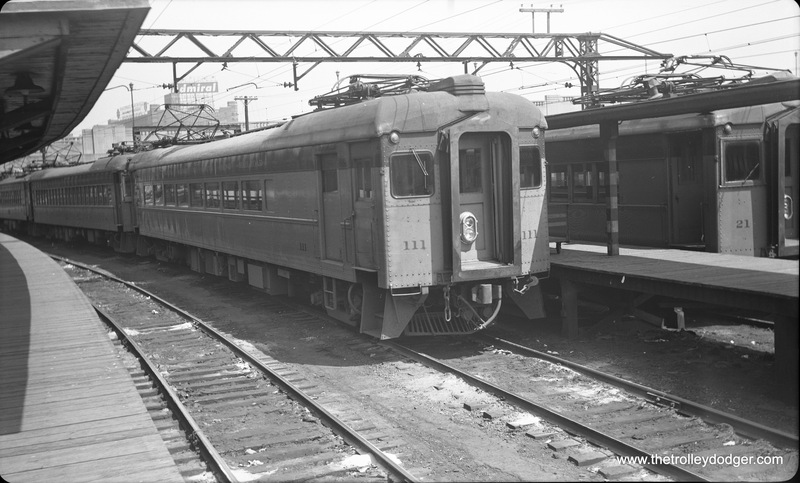 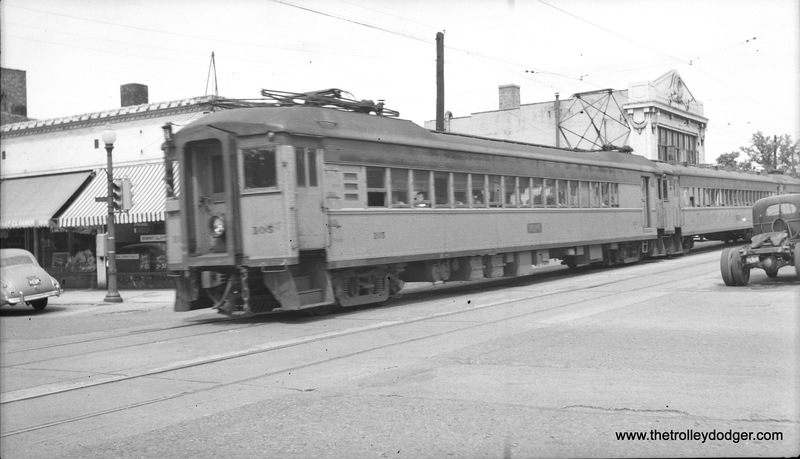 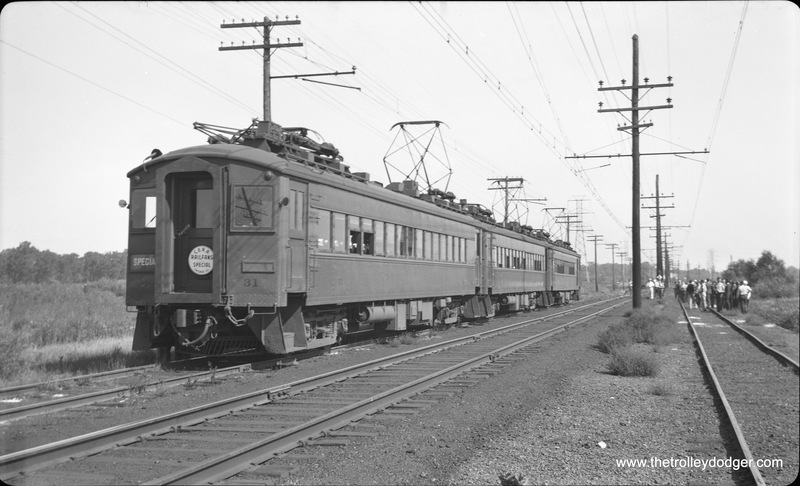 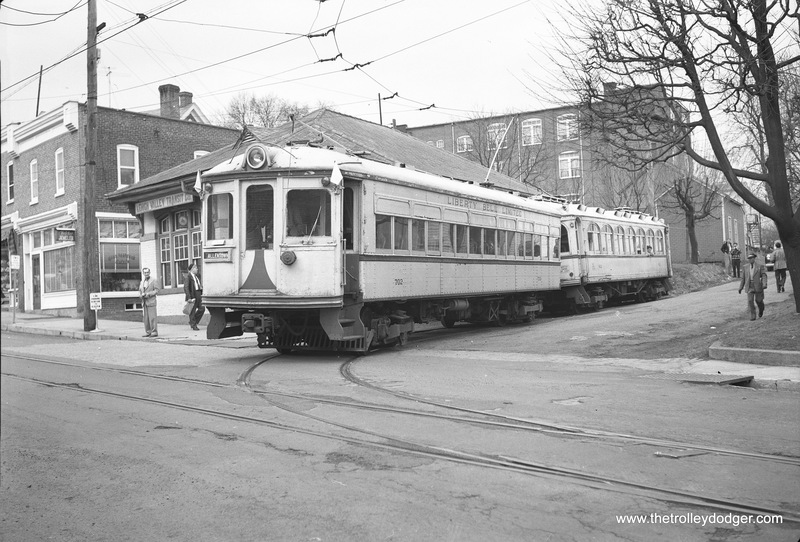 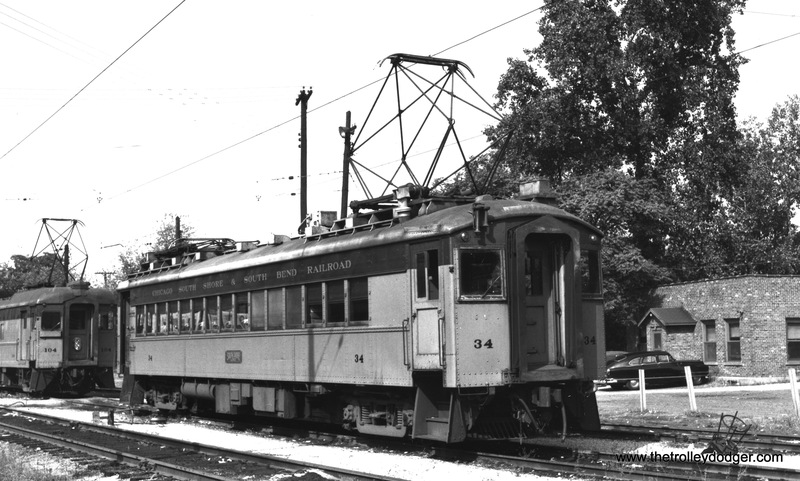 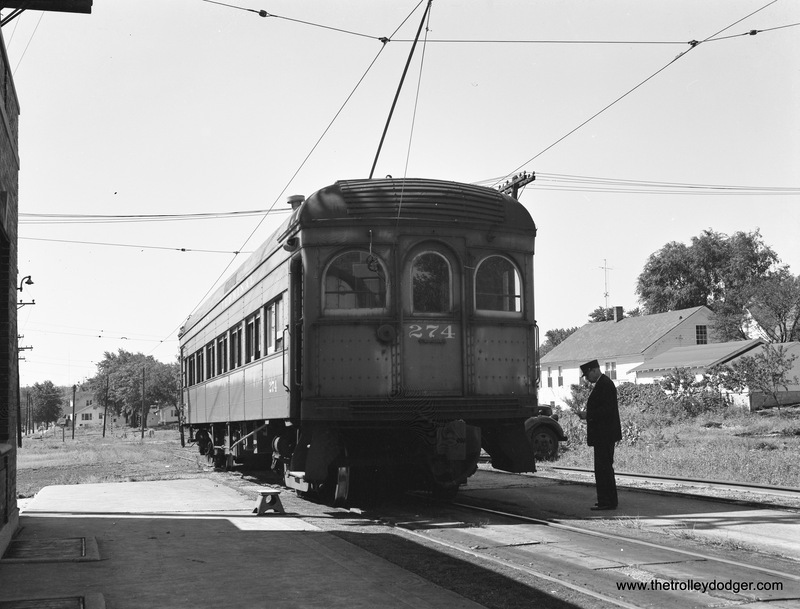 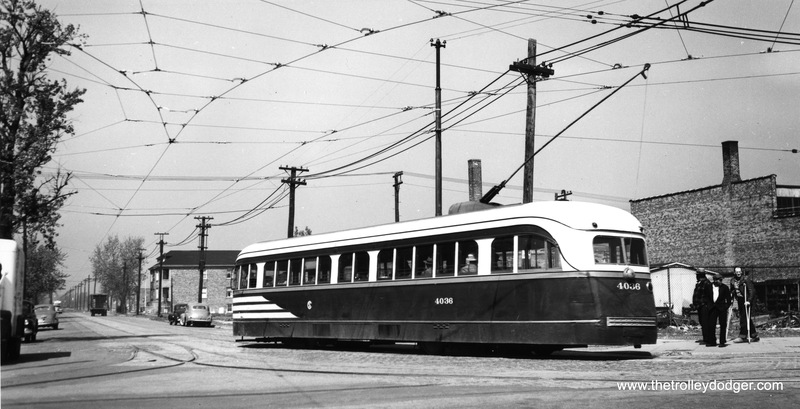 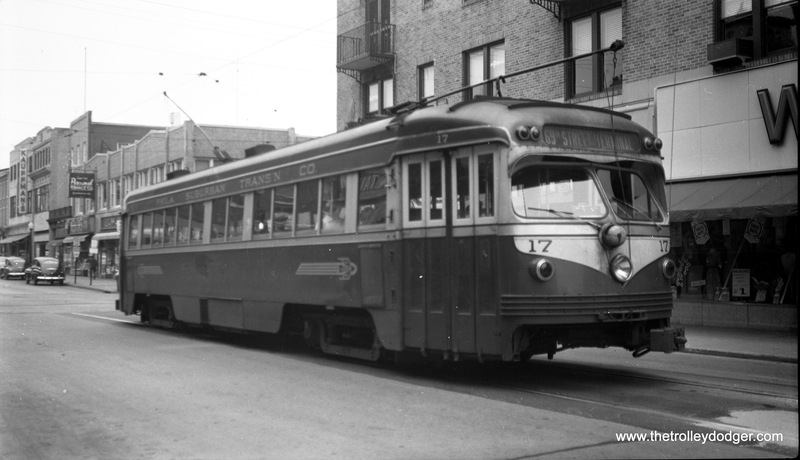 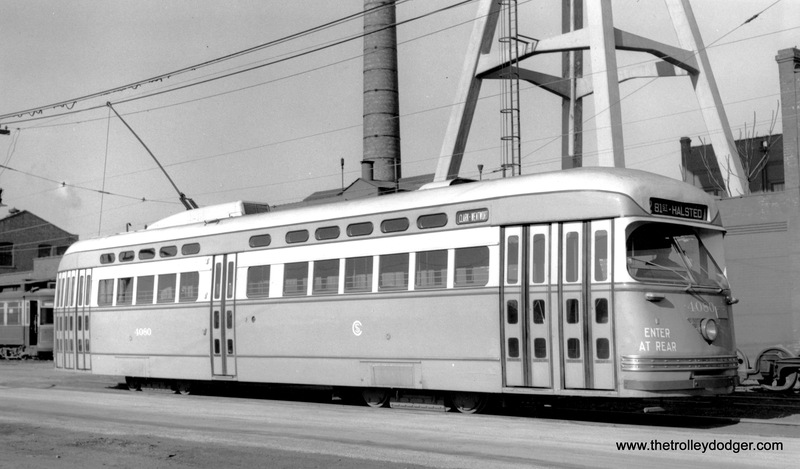 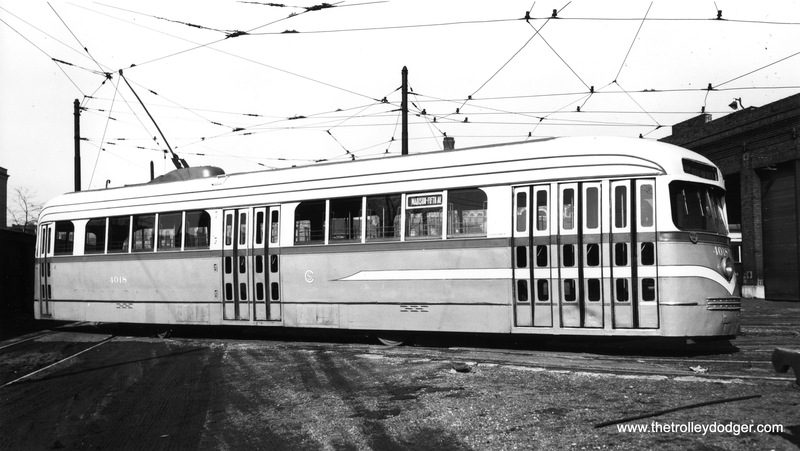 Philadelphia Suburban Transportation Co. double-ended car 12 at 69th Street and Garrett Road on April 14, 1951. 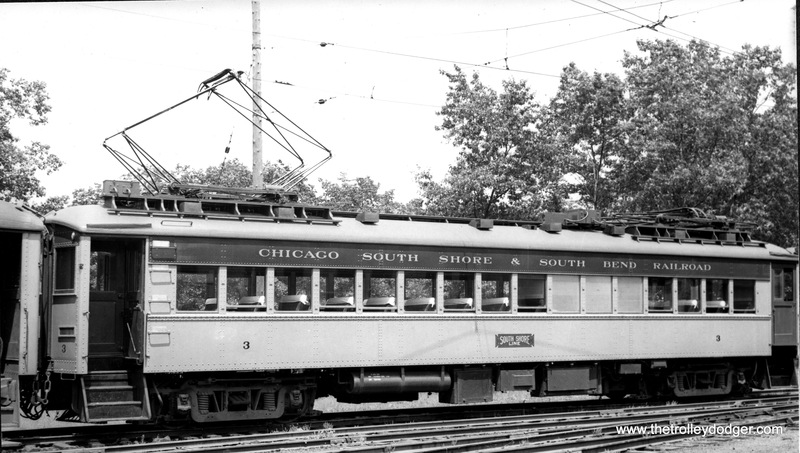 It is outbound on the Ardmore line. 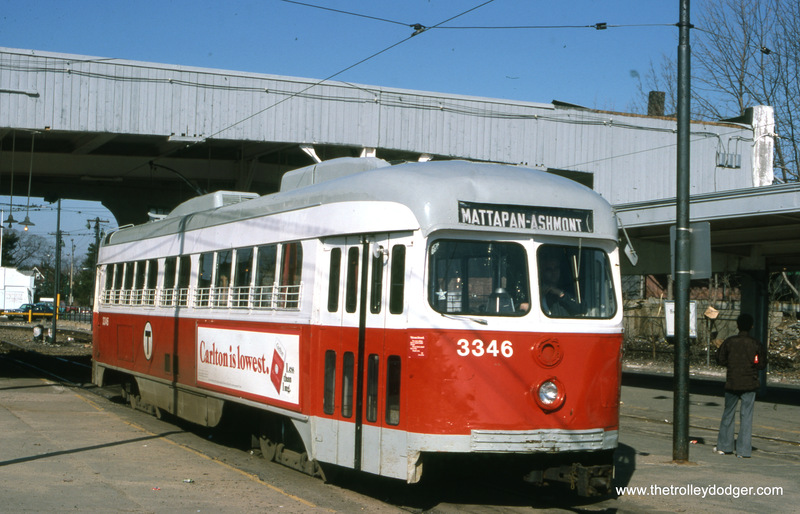 MBTA double-end PC 3346 at Mattapan on March 31, 1978. 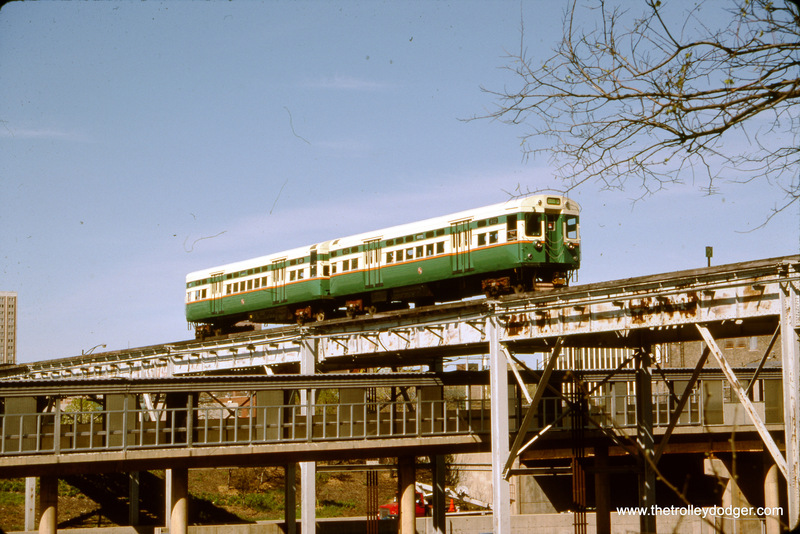 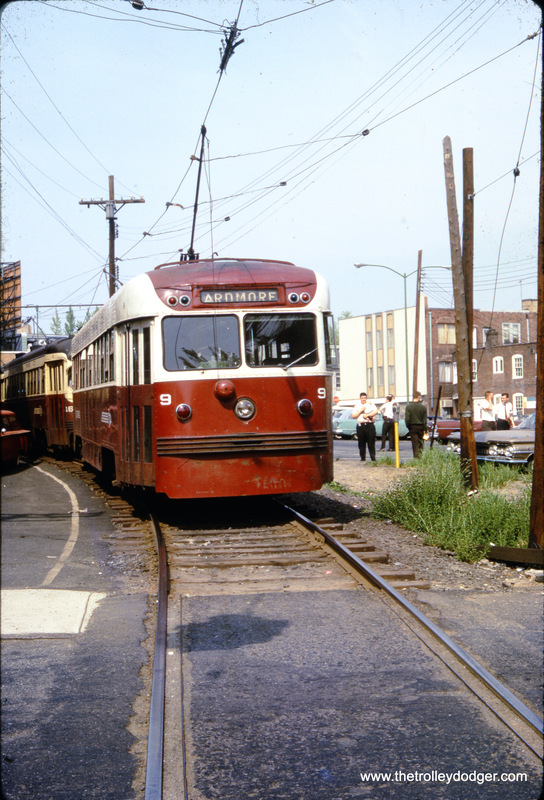 These cars were painted red, since the Ashmont-Mattapan branch line is considered an extension of the Red Line subway. 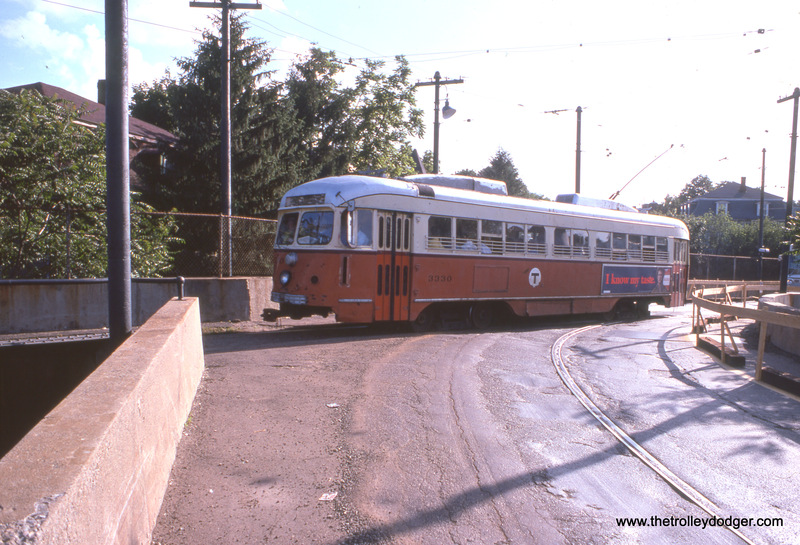 Outbound double-end PCC 3345 at Ashmont in August 1968. 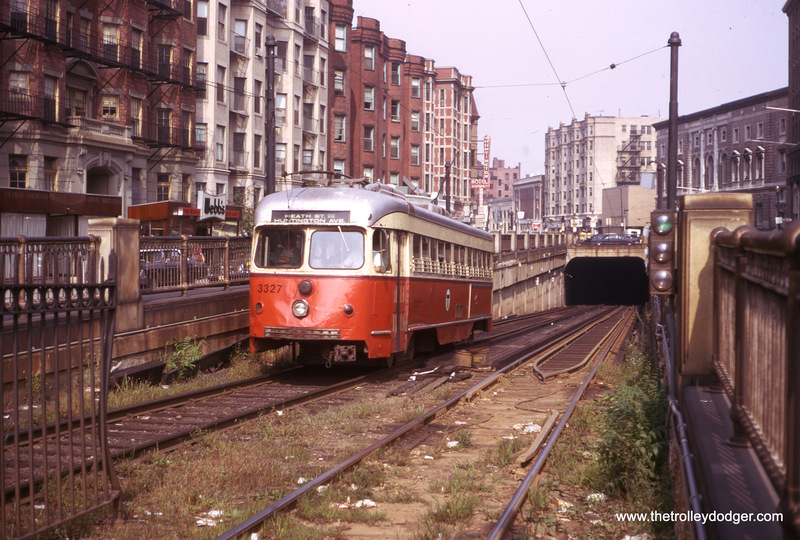 3345 at Ashmont in August 1968 with a standing room crowd. 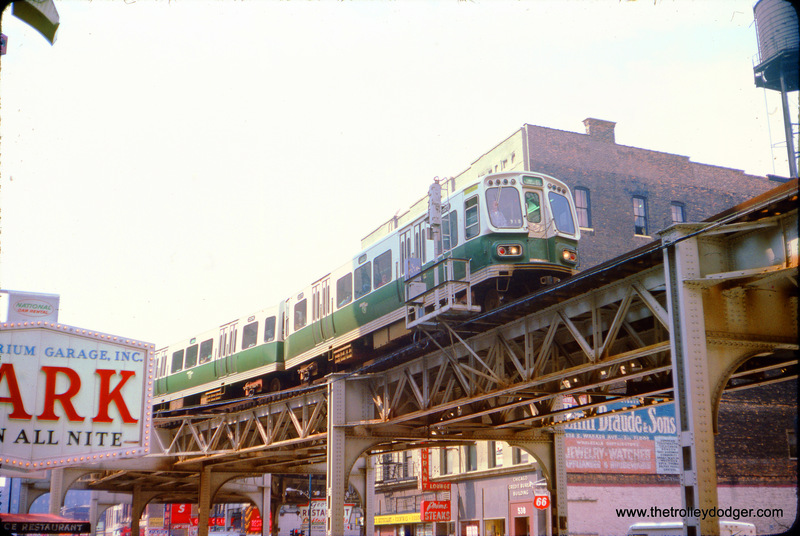 Despite the roll sign, the Ashmont-Mattapan tracks are separate from Boston’s Green Line system. 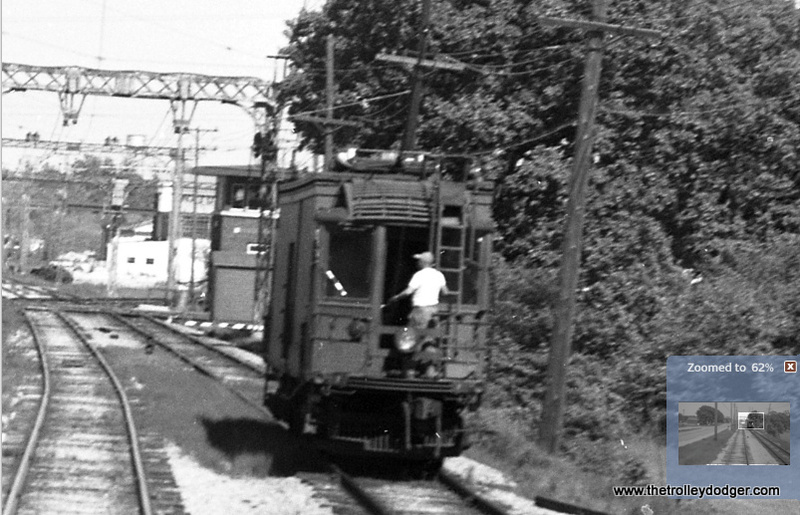 3330 at Ashmont in August 1968. 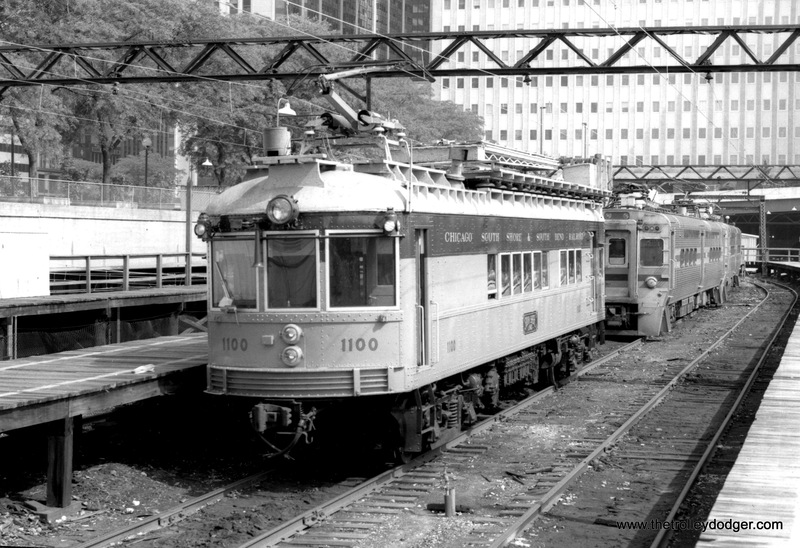 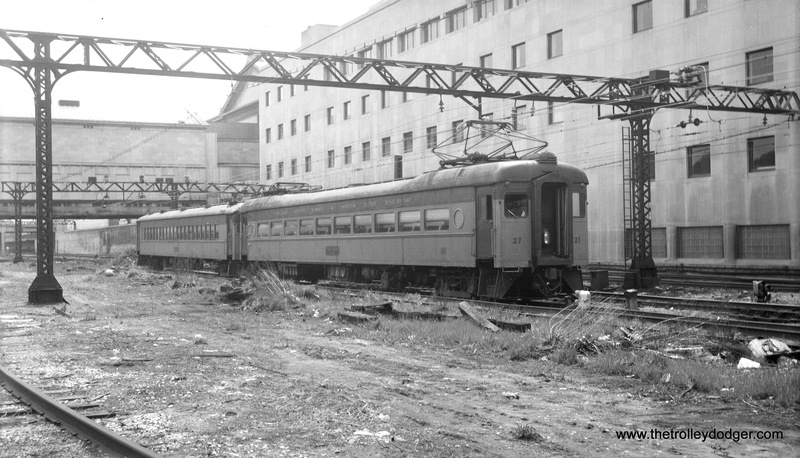 MBTA 3296, operated in multiple units, at the old North Station on September 28, 1970. 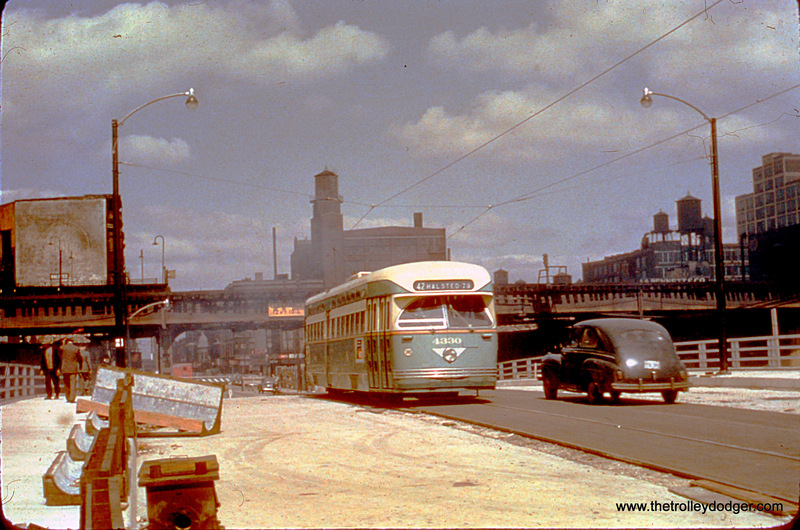 This 1958 picture shows the old Garfield Park “L” crossing the area now occupied by the Kennedy expressway. 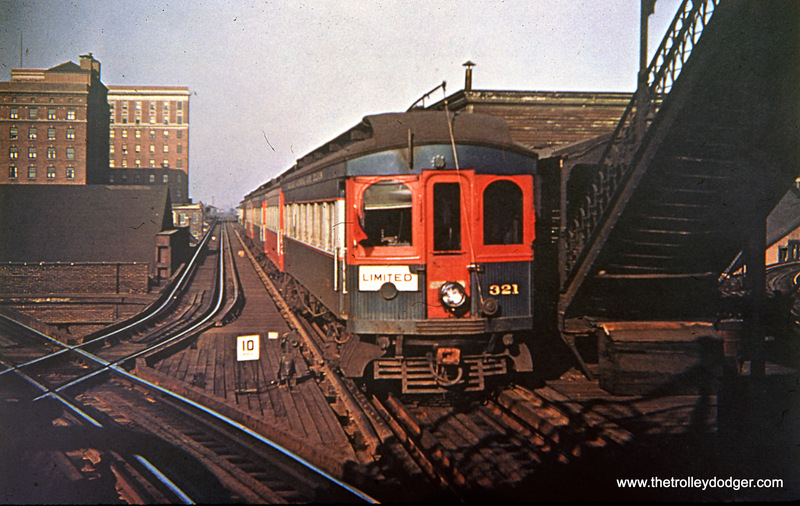 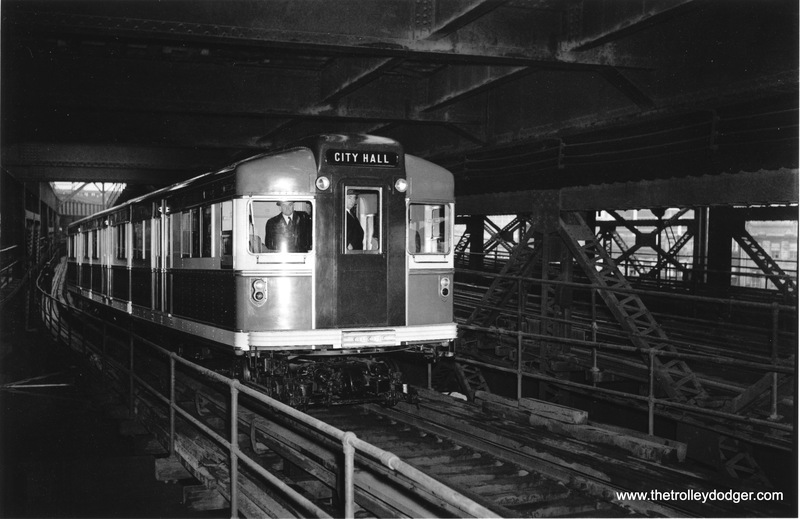 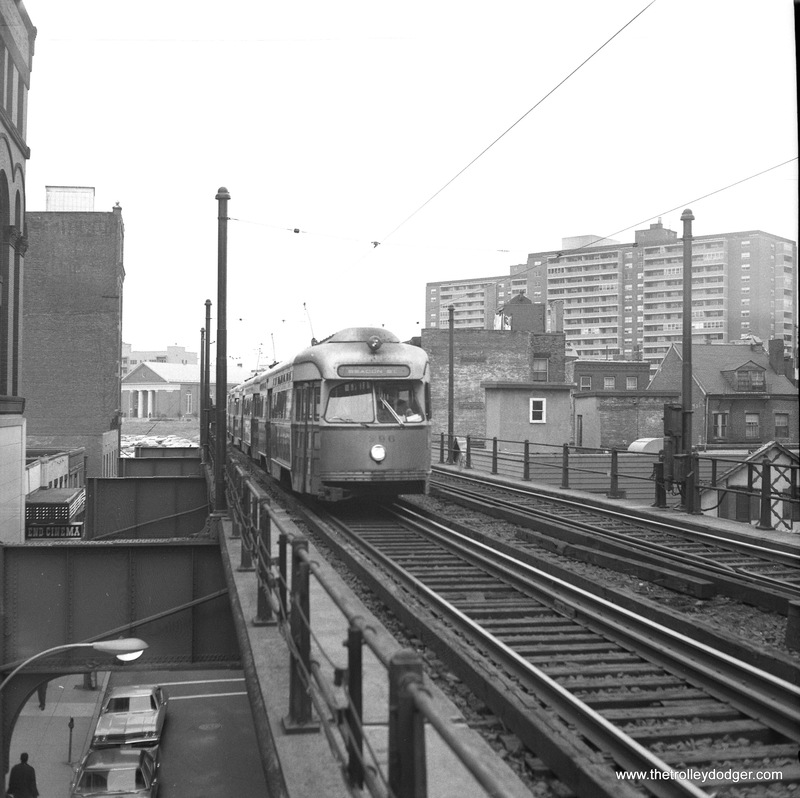 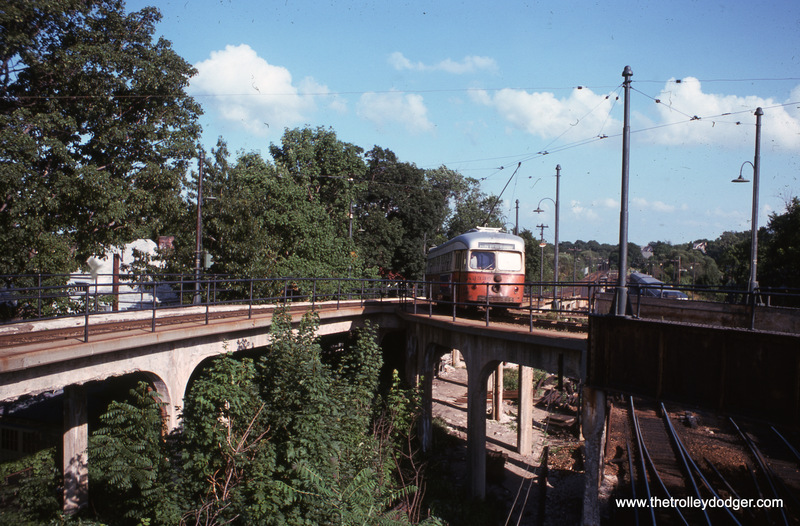 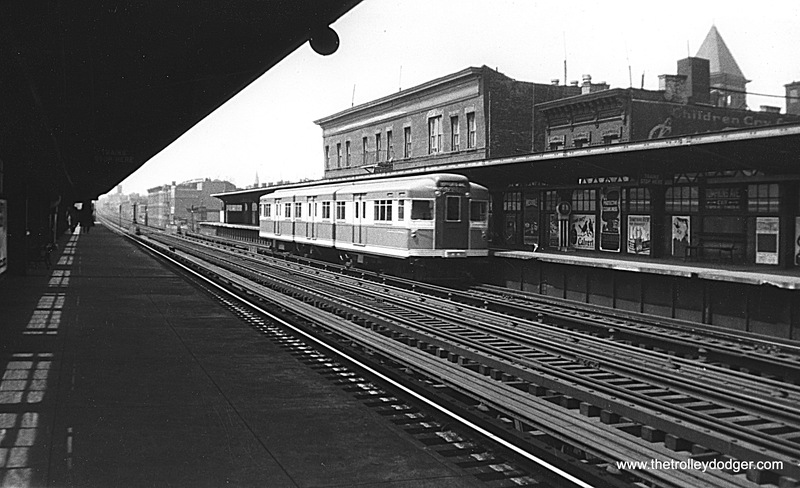 The “L” was replaced by the Congress Expressway median line on June 22, 1958, after which these tracks were removed. 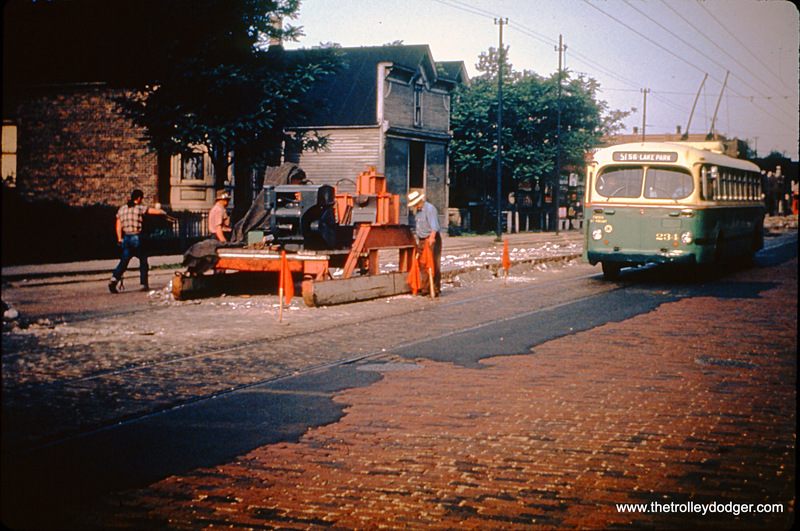 But prior to that, they had to be shored up with new supports due to excavation work for the new highway, which opened on November 5, 1960. 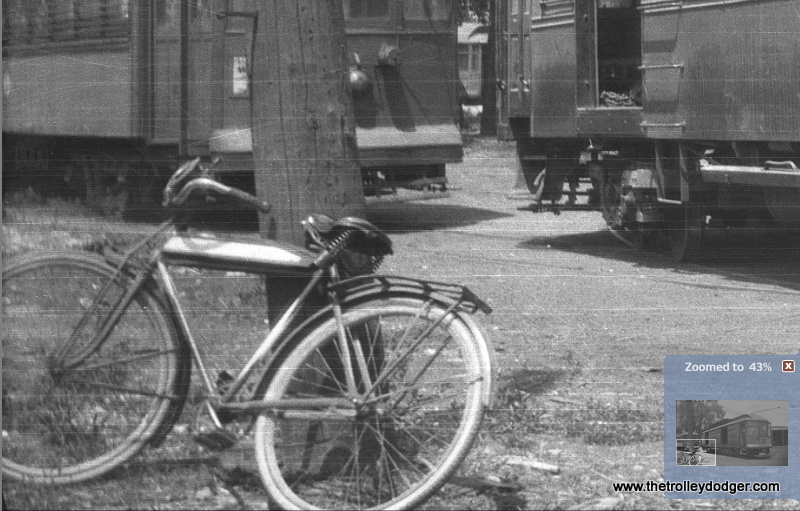 We ran another picture taken at this location in our previous post Some Thoughts on “Displaced” (August 30, 2016). 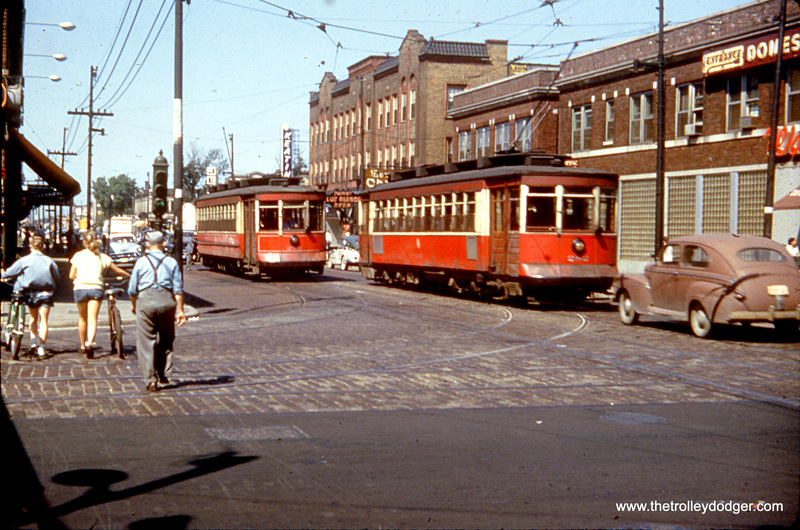 You can also see a 1957 Chevy in the picture, plus an early Volkswagen. 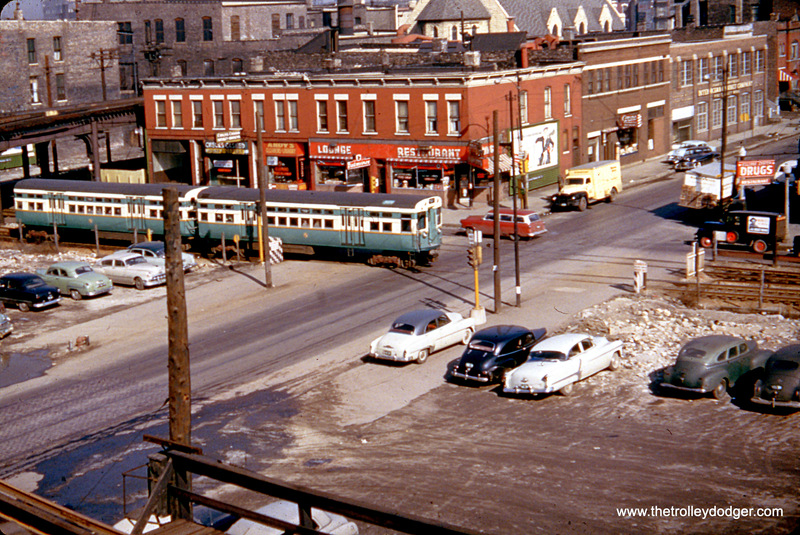 The last year for the split rear window Beetles was 1953, so this one is later. 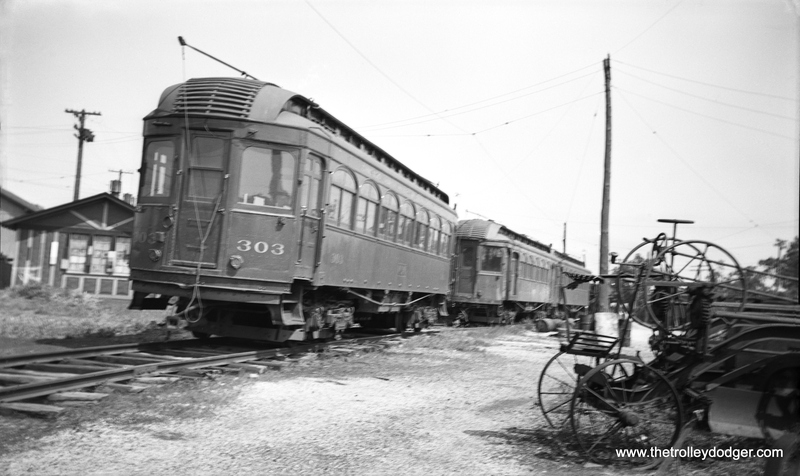 This picture of various Chicago, Aurora & Elgin trains was taken around September 1953 at DesPlaines Avenue in Forest Park. 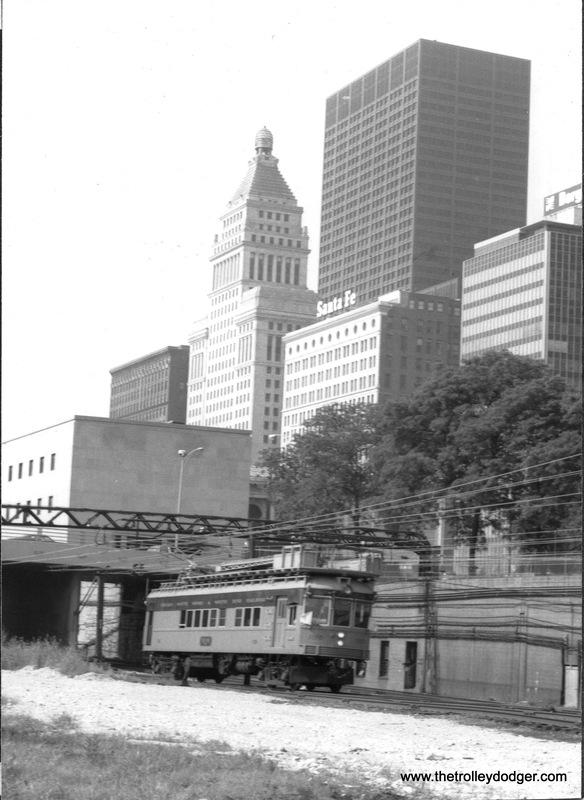 Construction is underway to reconfigure the terminal for a new track arrangement, where CA&E trains will no longer head downtown, but will terminate and loop here. 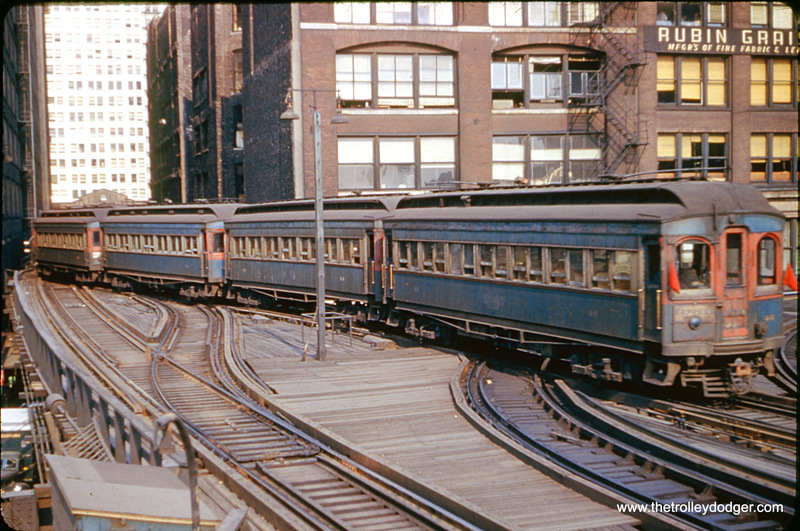 The wooden ramp in the background was built so that CTA trains could loop without crossing CA&E tracks, which were no longer going to be connected to the CTA. 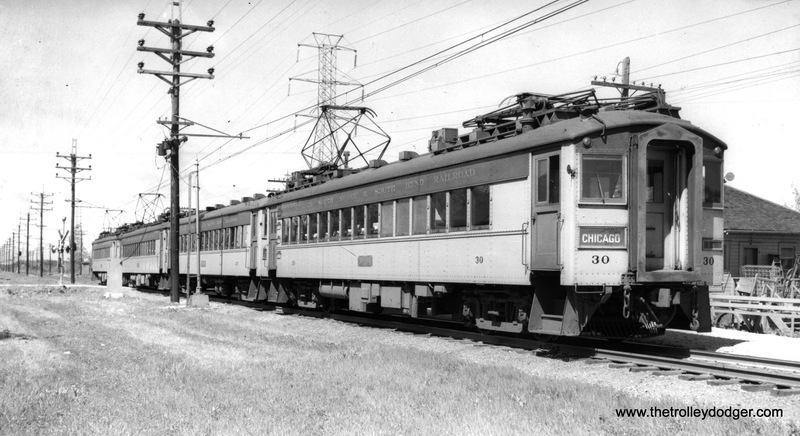 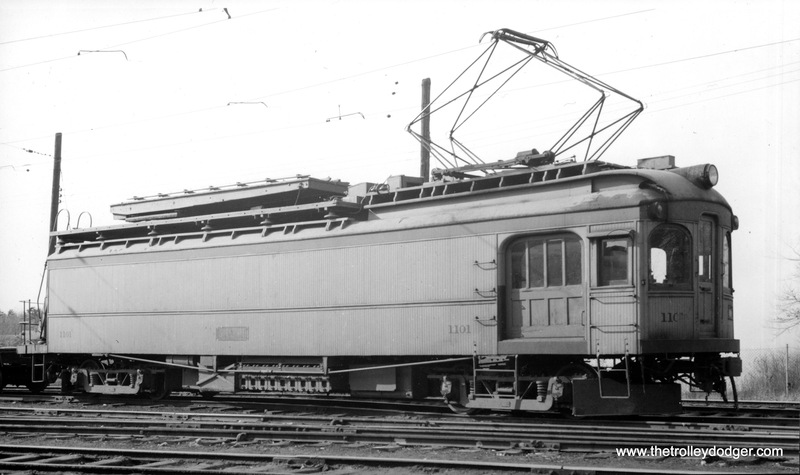 This new arrangement continued until the CA&E quit operating passenger service on July 3, 1957. 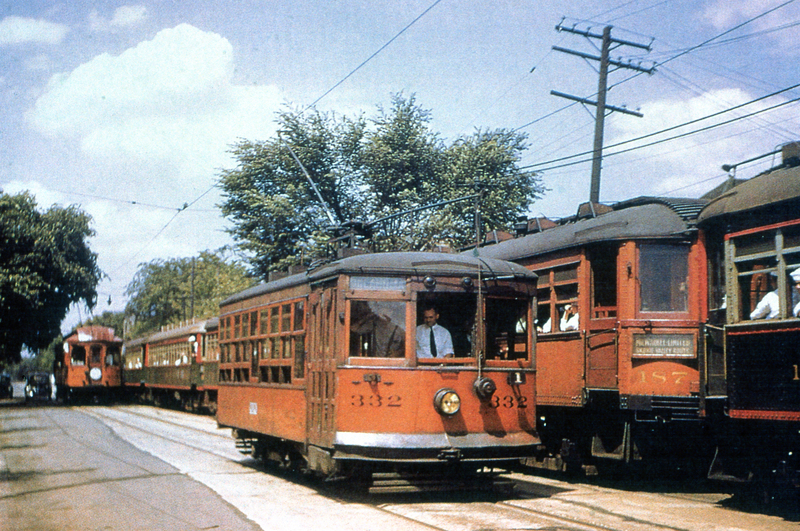 The three Chicago Rapid Transit cars shown here are at 22nd and Mannheim, the end of the Westchester branch. 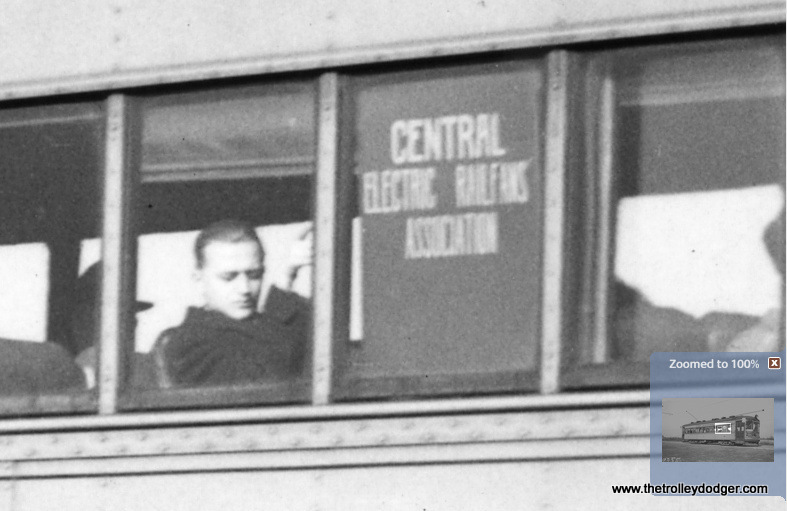 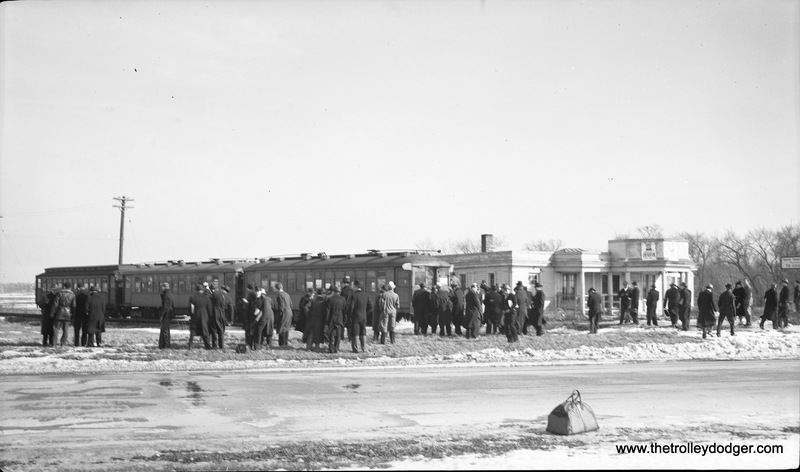 The occasion was a February 12, 1939 Central Electric Railfans’ Association fantrip. 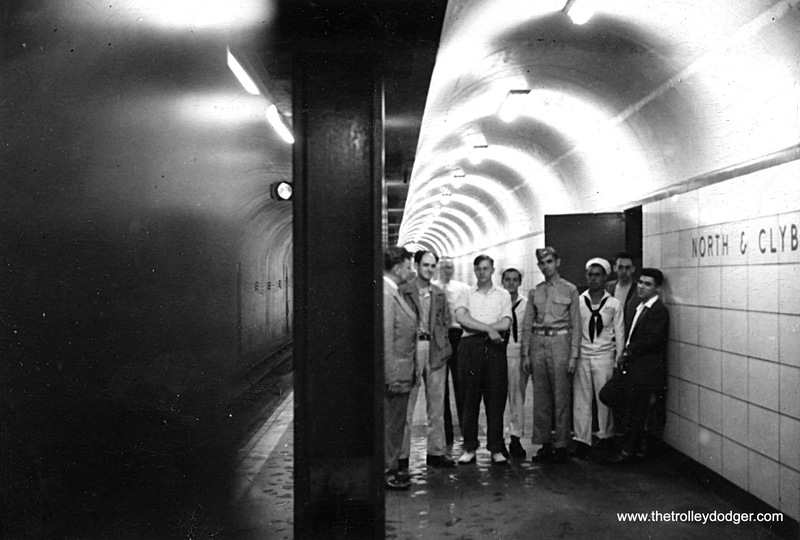 We have posted other photos from this excursion in previous posts. 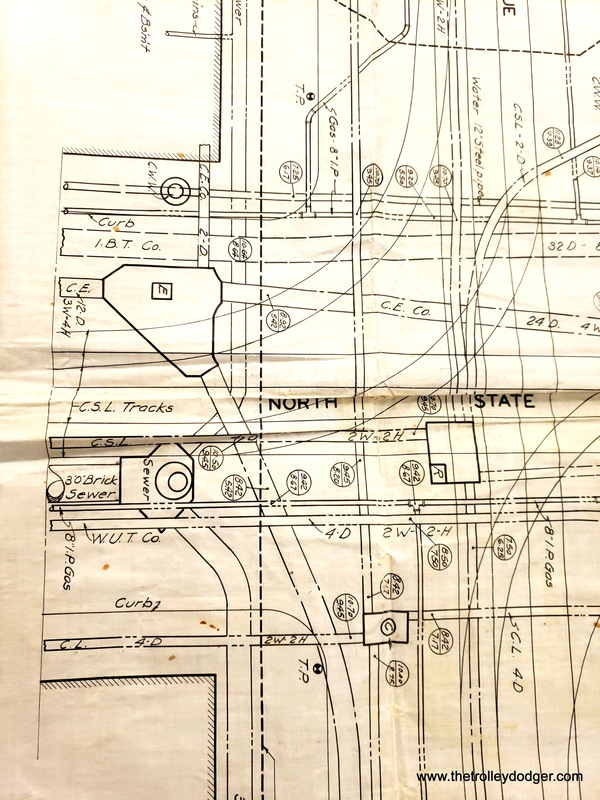 There was a photo stop scheduled at this location from 1:15 to 1:30 p.m.
PS- My never ending search for CA&E was rewarded with this route map (circa 1940) that I had never seen before. 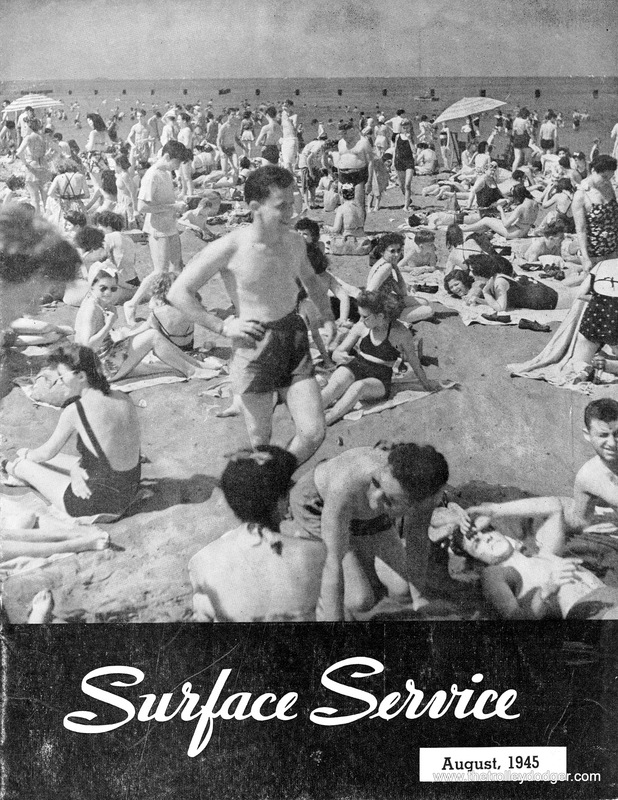 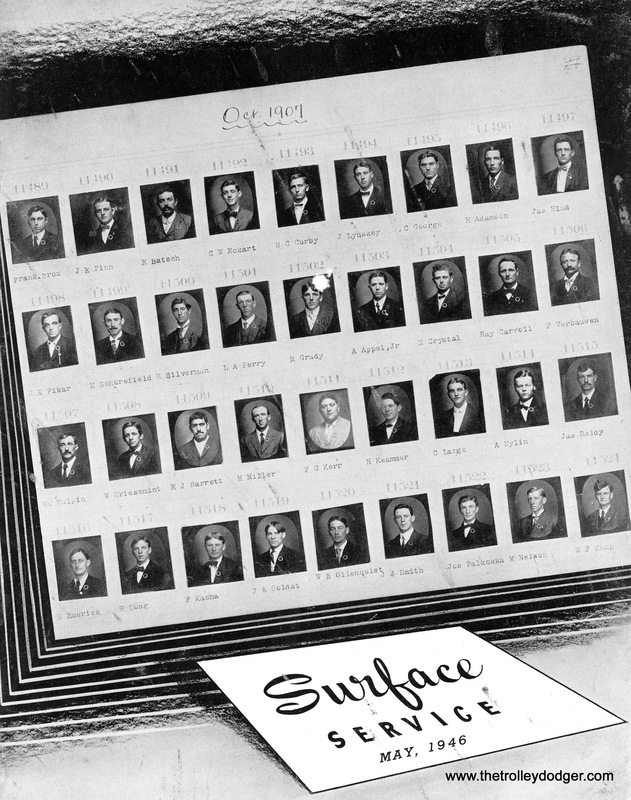 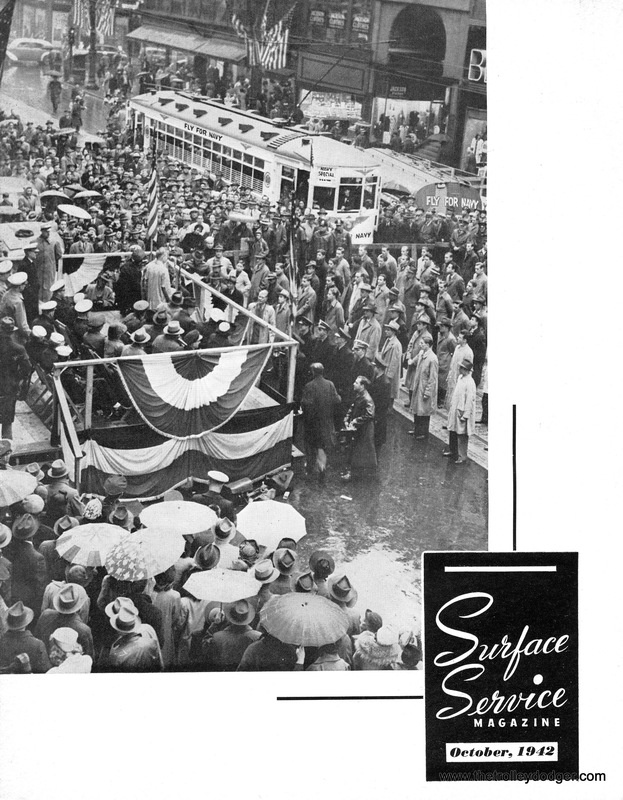 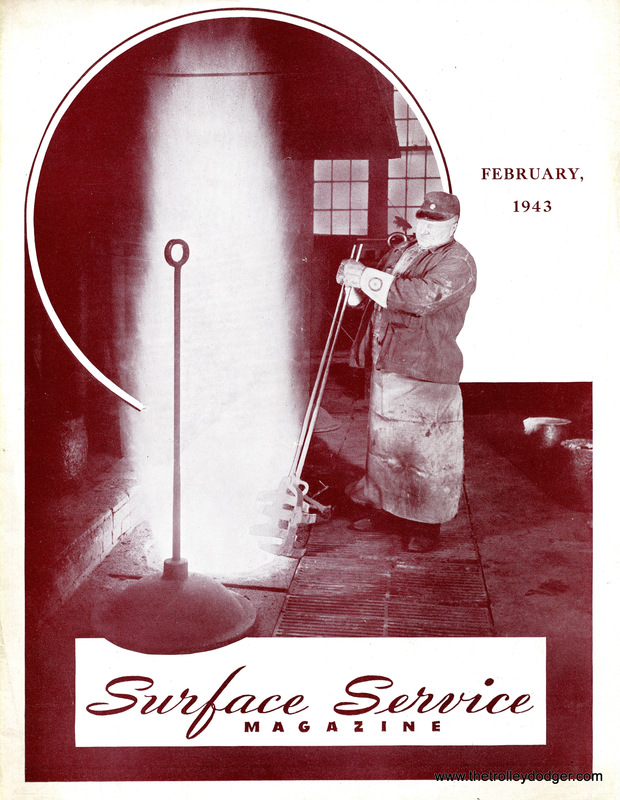 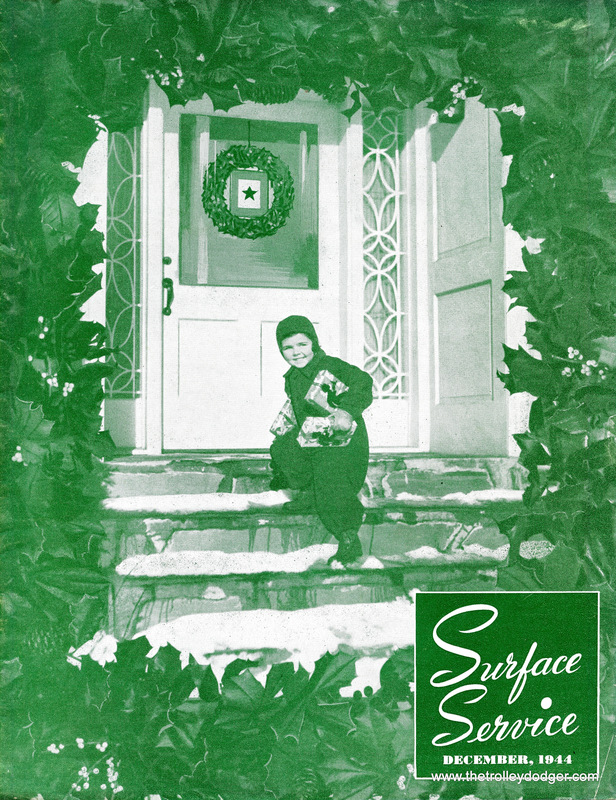 We are pleased to report that hi-resolutions scans for 12 more issues* of Surface Service, the Chicago Surface Lines emplyee magazine, have been added to our E-book Chicago’s PCC Streetcars: The Rest of the Story (available in our Online Store). 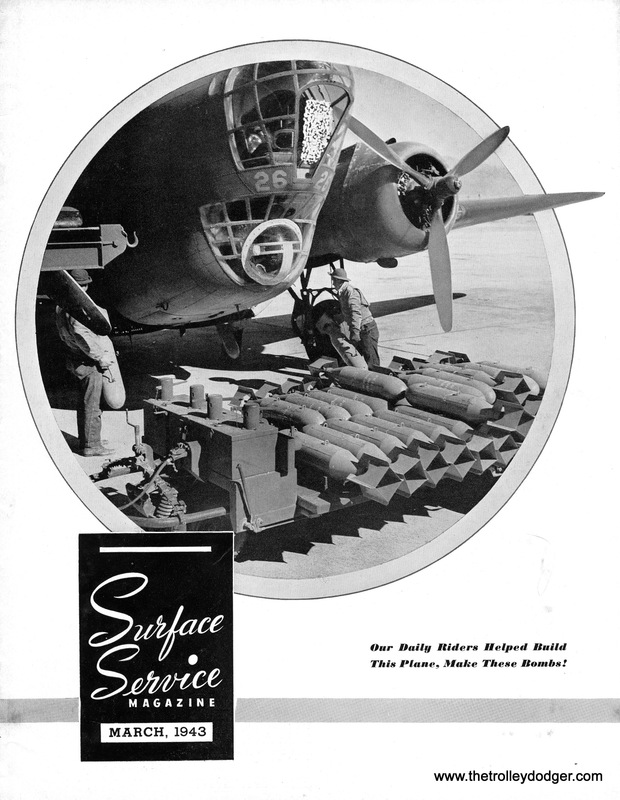 This totals 200 additional pages of information. 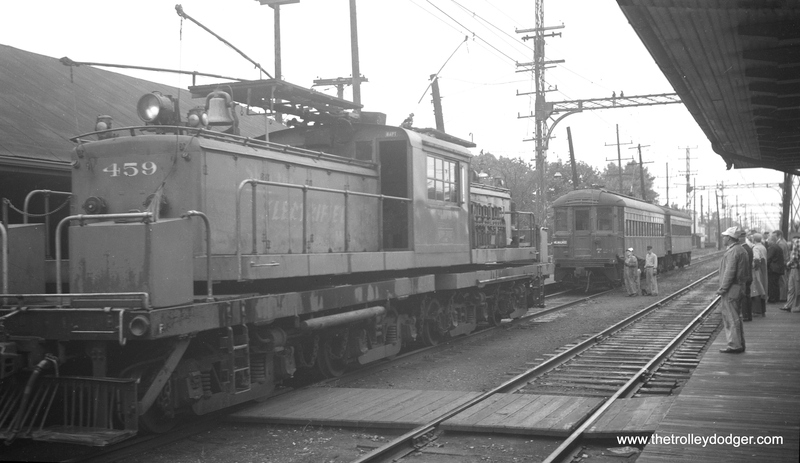 This is our 182nd post, and we are gradually creating a body of work and an online resource for the benefit of all railfans, everywhere. 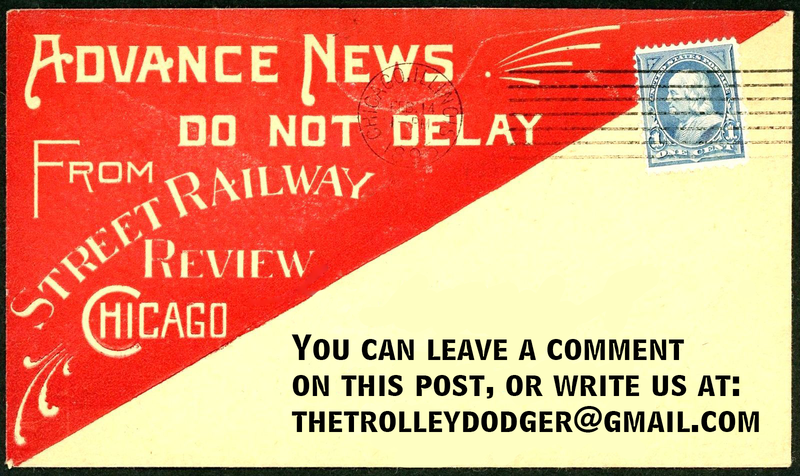 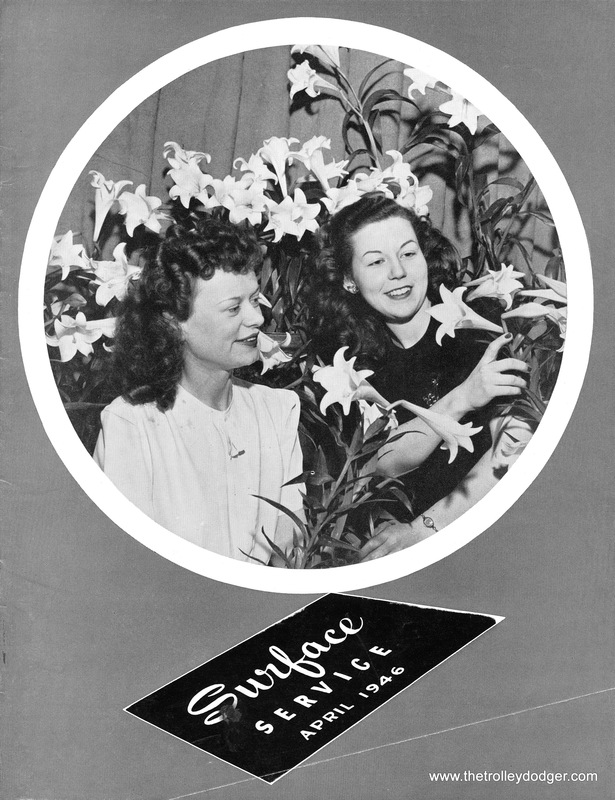 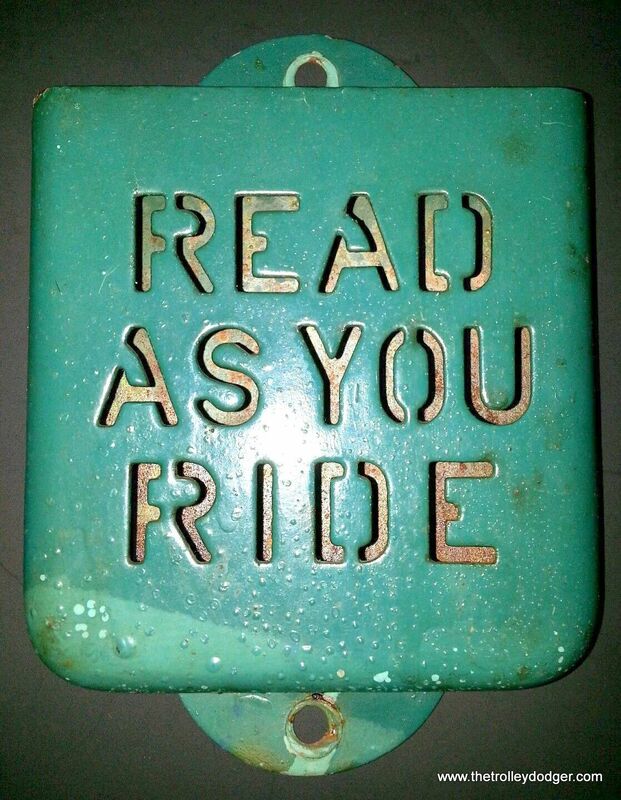 To date, we have received over 284,000 page views, for which we are very grateful.